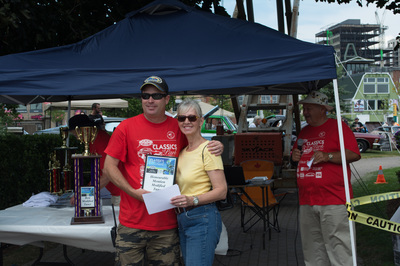 Kim Anderson of CarLine presents Brad Carne with a plaque for best car, a 1973 Chevy Camaro. 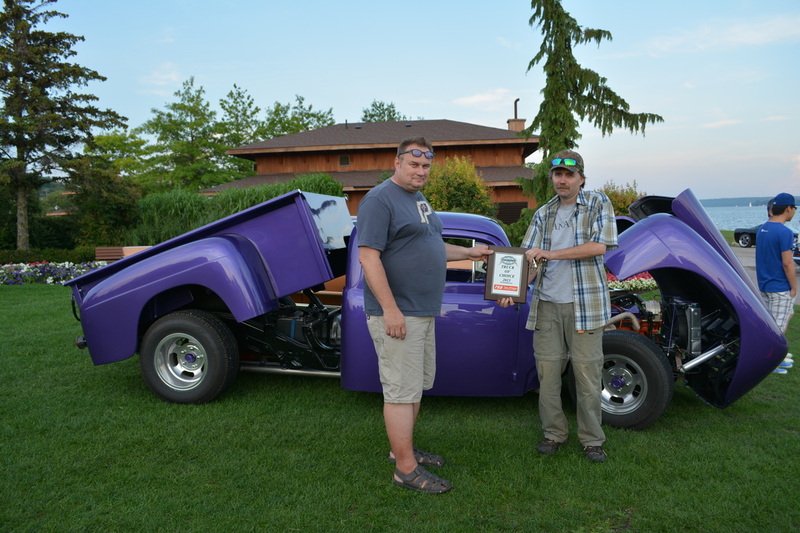 Armand Gauthier of Part Source Presents Eric Kennedy with a plaque for best truck,a 1957 Chevy Cameo pickup. 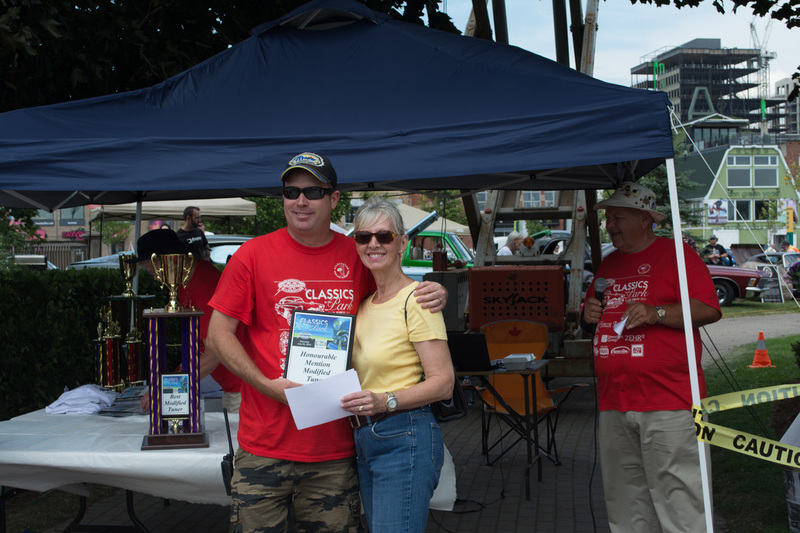 Kim Anderson of CarLine presents Eric Kennedy with a plaque for best truck, a 1957 Chevy Cameo pickup. 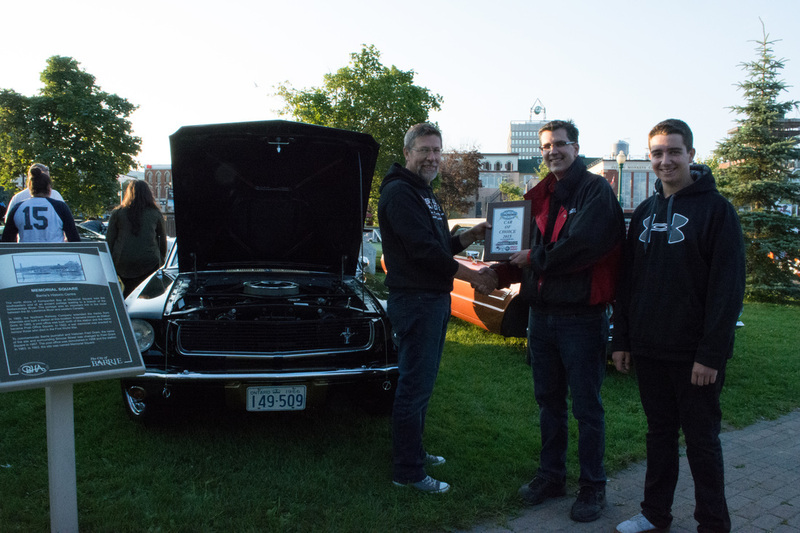 Armand Gauthier of Part Source Presents Greg Marinoff with a plaque for best car, a 1969 Ford Mustang. 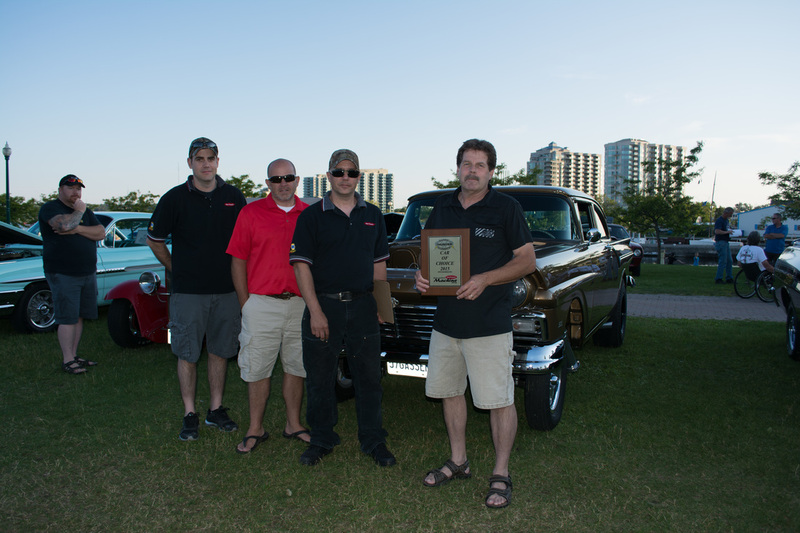 Armand Gauthier of Part Source Presents Wayne Mcauley with a plaque for best truck, a 1946 One Ton Chevy. 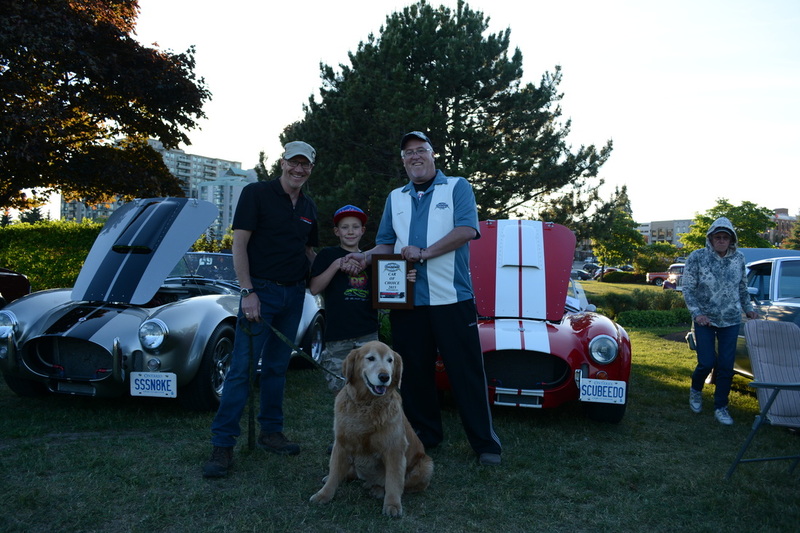 Greg Wiebe of Superior Tire & Auto Presents Dave Grant with a plaque for best car, a 1965 Cobra Shelby. 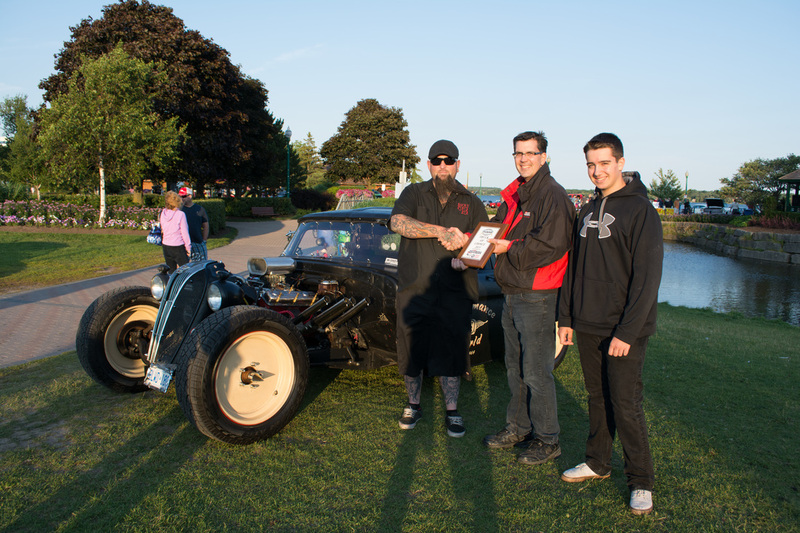 Greg Wiebe of Superior Tire & Auto Presents John Ens with a plaque for best truck, A 1964 Ford F100 Rat Rod. 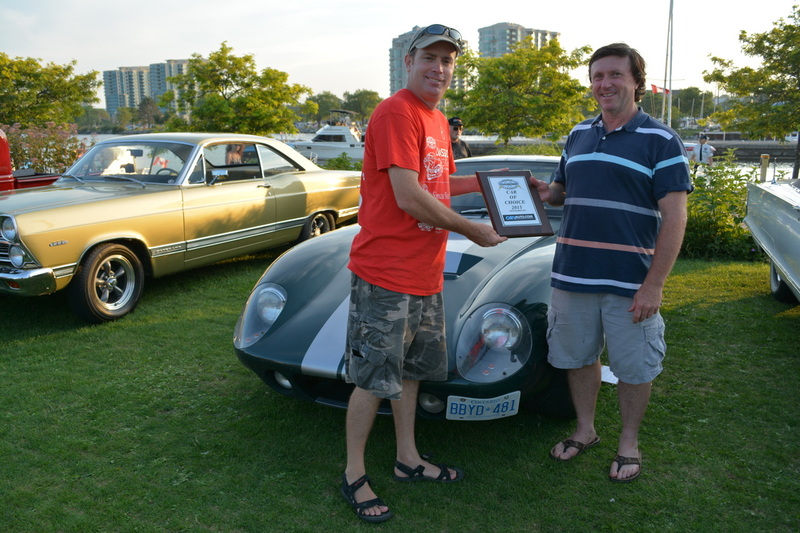 plaque for best car, a 1967 Beaumont Sport Delux. 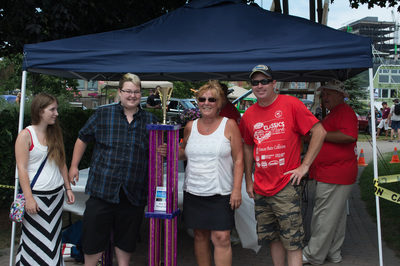 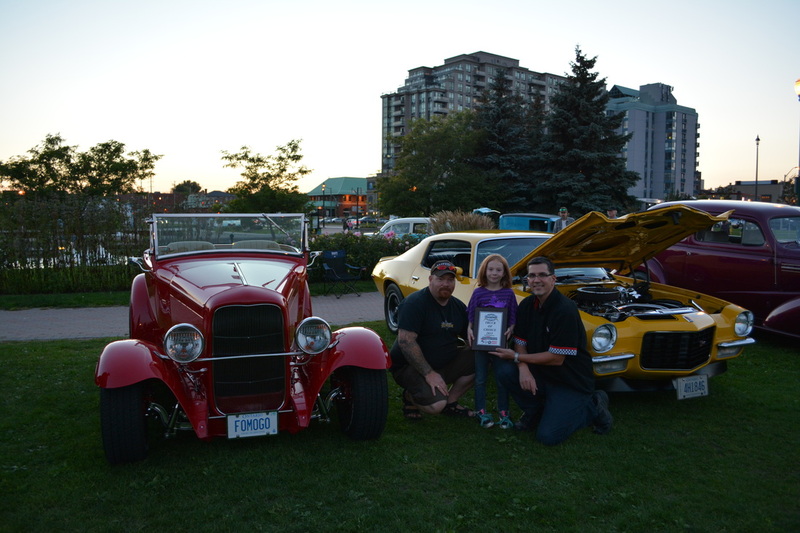 Ally and Hailey of Hooters Barrie presents Judy Gallant with a plaque for best truck, a 1937 Ford. 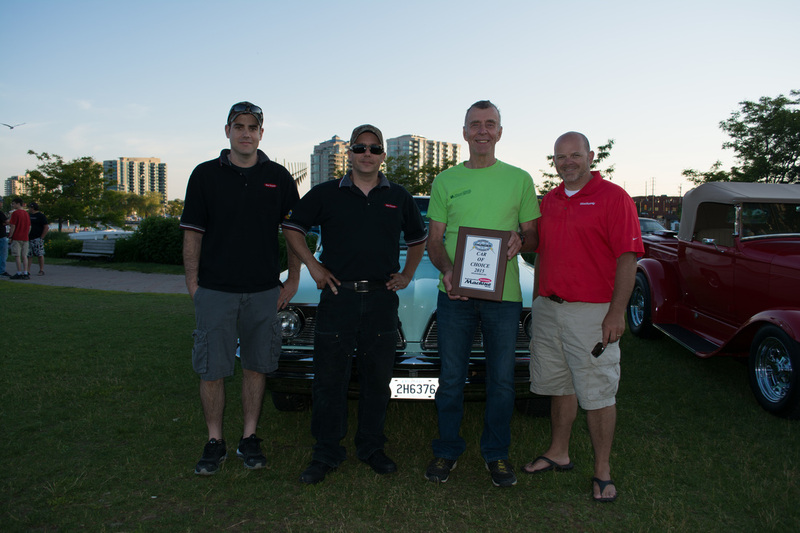 Jason and Justin Holmes of 400 Transmission presents Brad Watson with a plaque for best car, 1933 Ford 3 window coupe. 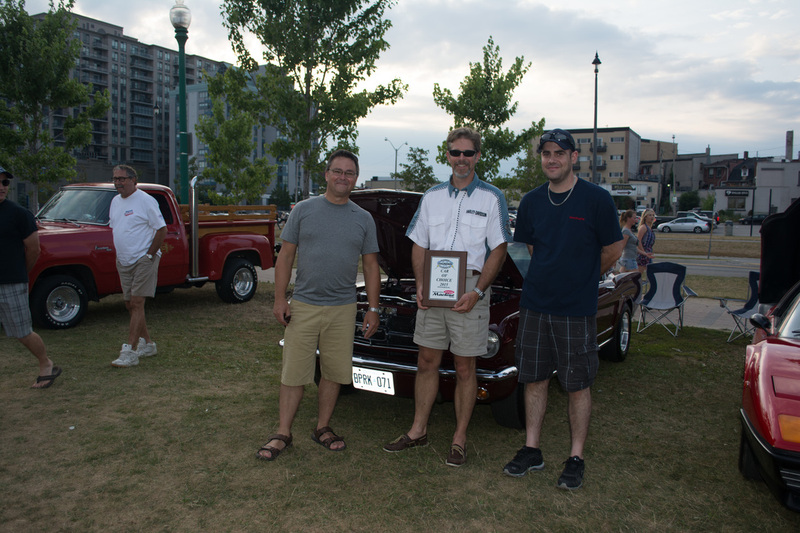 Jason and Justin Holmes of 400 Transmission presents Shane with a plaque for best truck, a 1966 Chevy C-10. 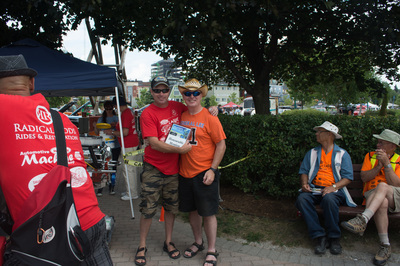 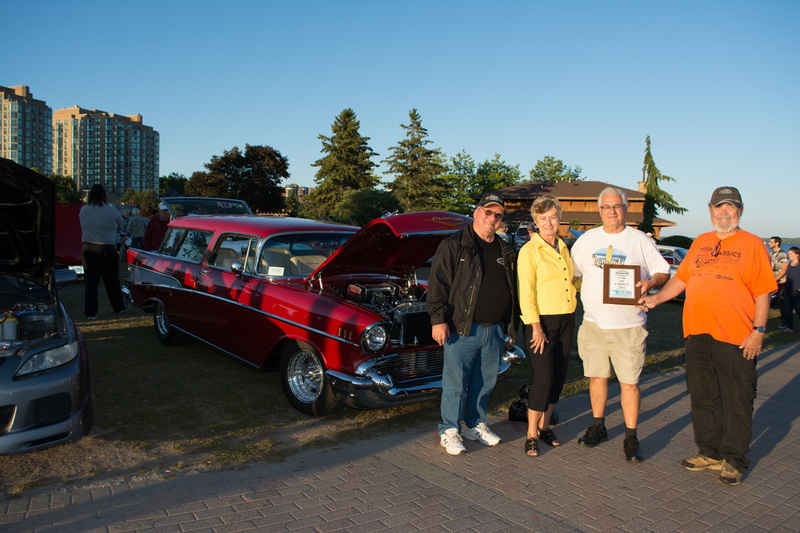 Cary MacDonald for Dave's Car Care presents Don Leblanc with a plaque for best car, a 1963 Chevy Nova. 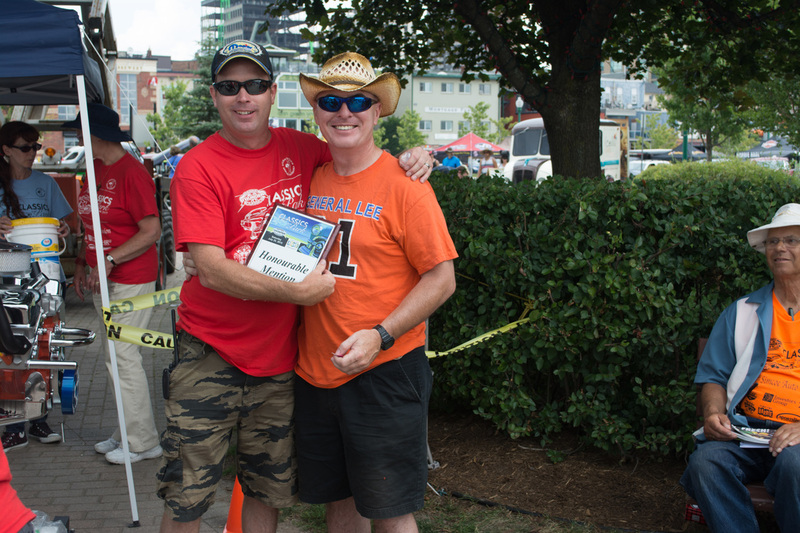 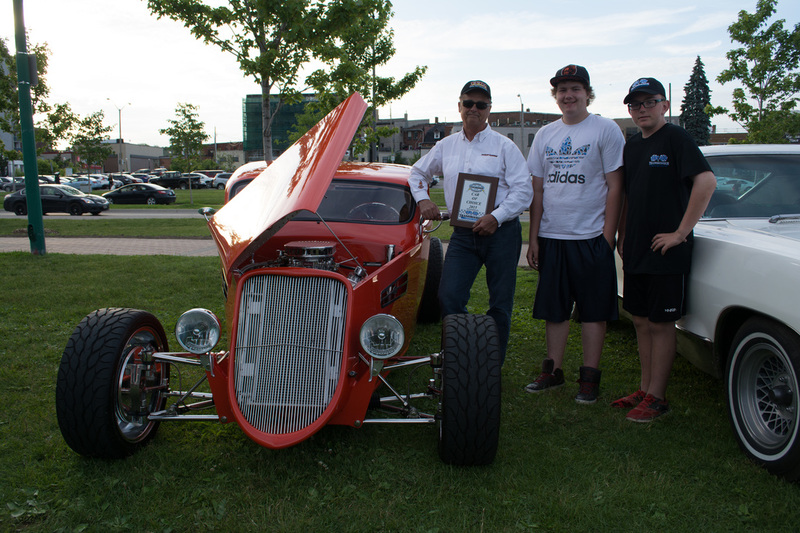 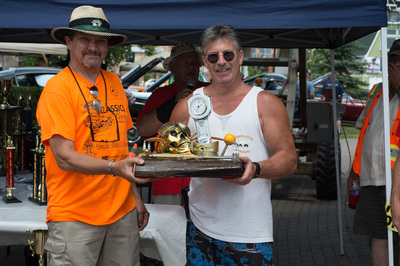 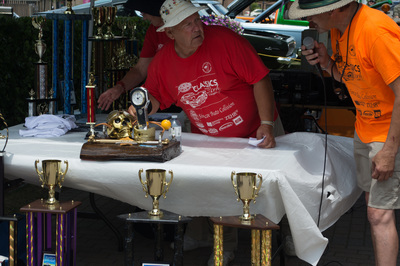 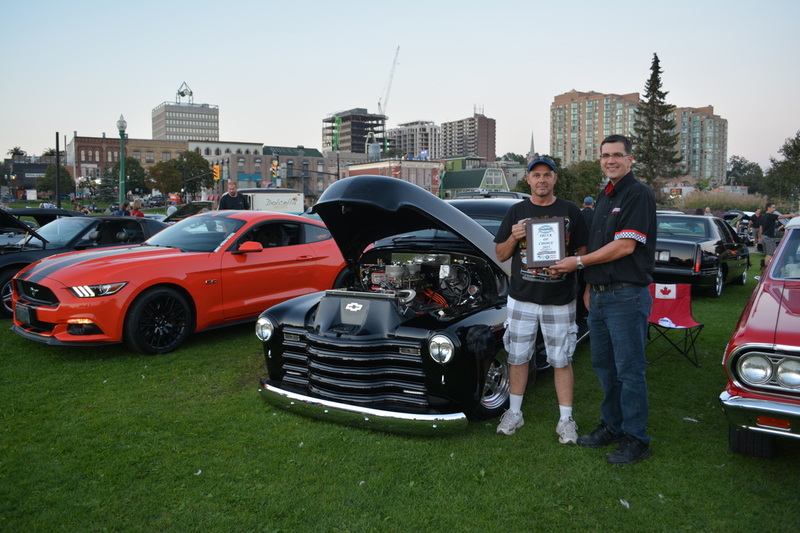 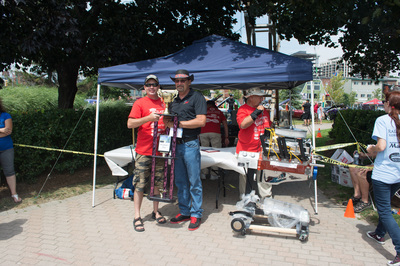 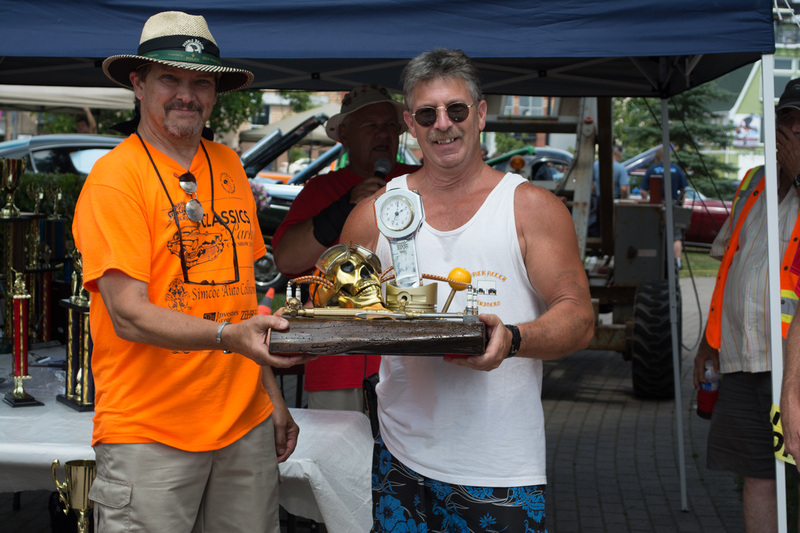 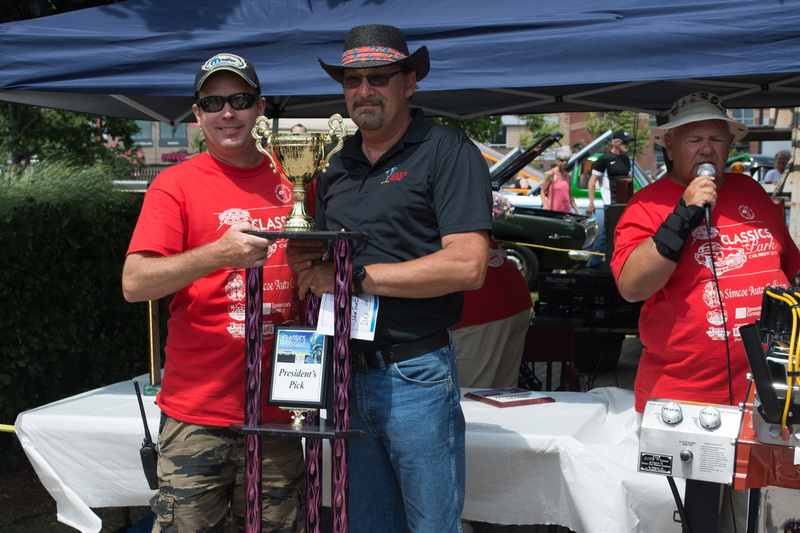 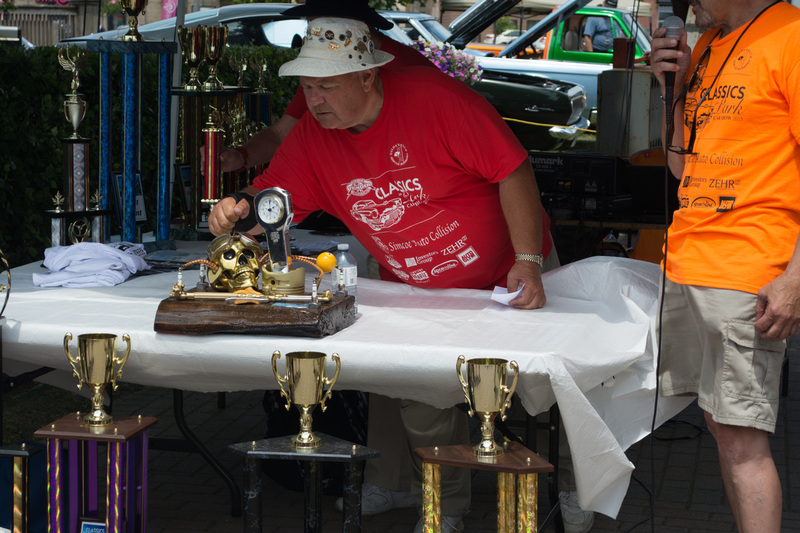 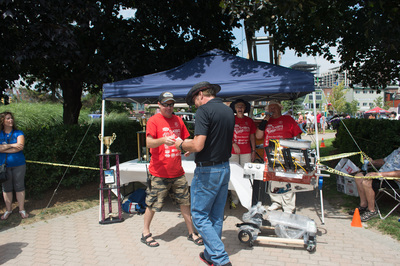 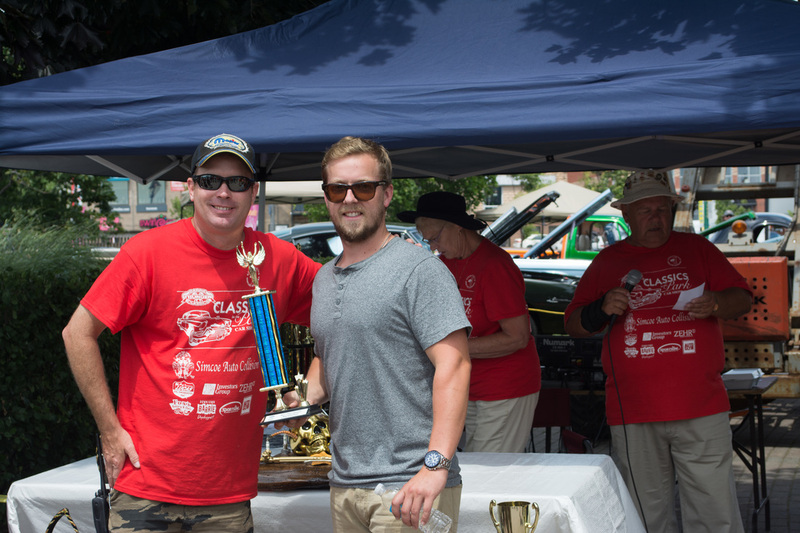 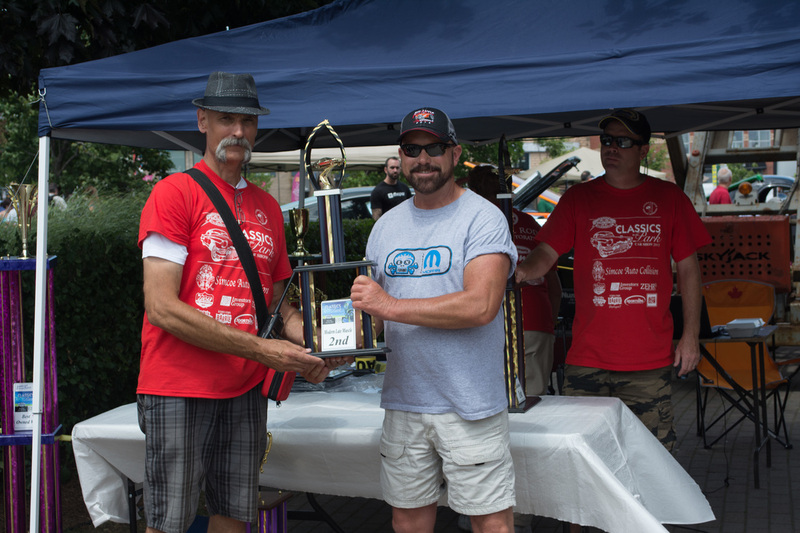 Cary MacDonald for Dave's Car Care presents Gary Page with a plaque for best truck, a 1946 Fast Rat twin turbo. 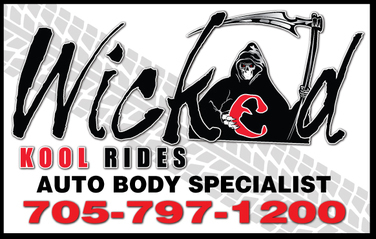 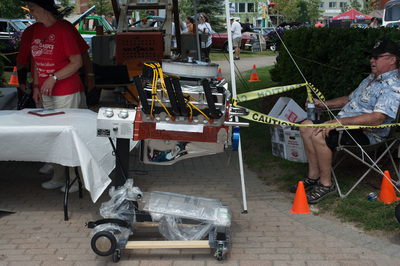 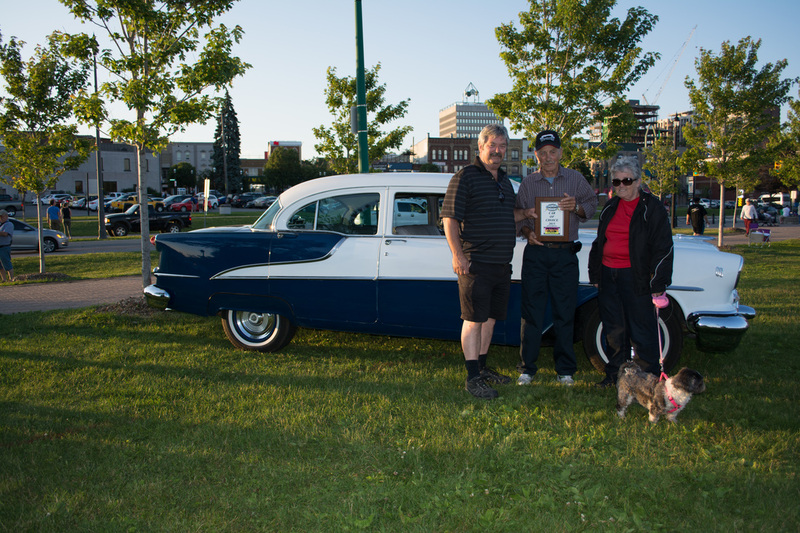 Cary MacDonald of Wicked Kool Rides presents Vick Griffin with a plaque for best car, a 1955 Ford Customline. 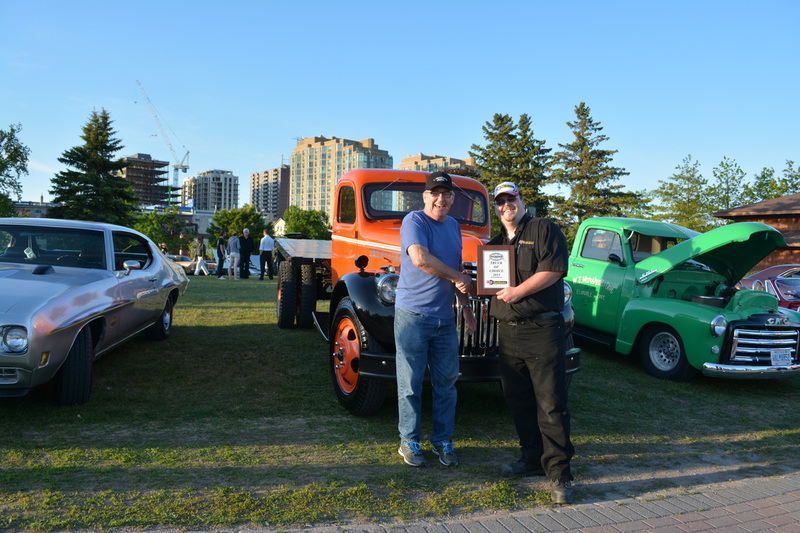 Cary MacDonald of Wicked Kool Rides presents Jim Croft with a plaque for best truck, a 1959 GMC 9310. 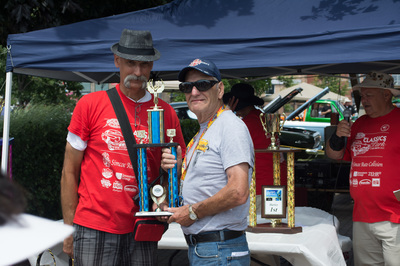 George Neshovski of Wimpy's Diner presents Deter Mudry with a plaque for best car, a 1934 Ford. 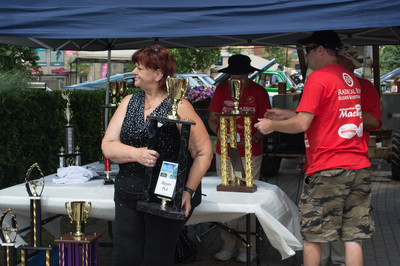 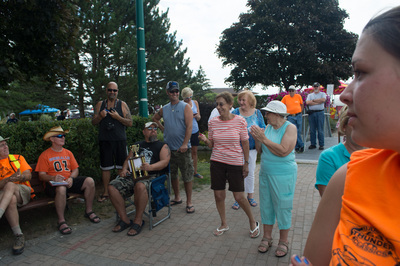 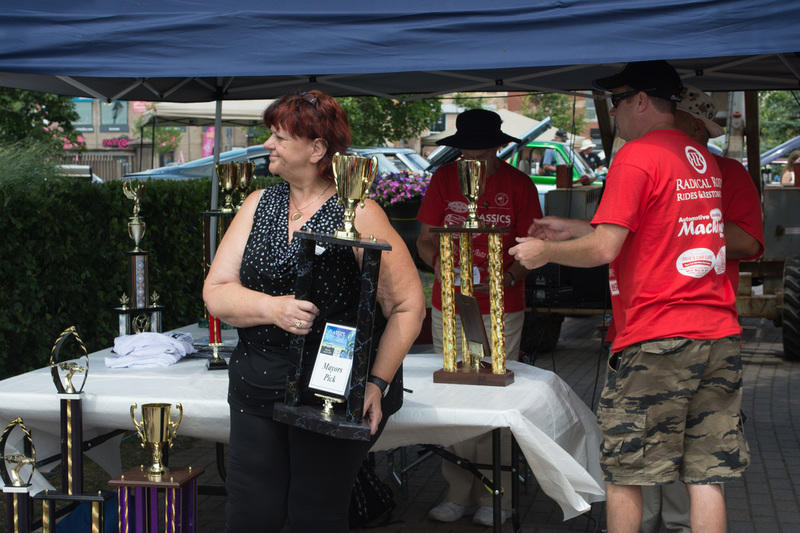 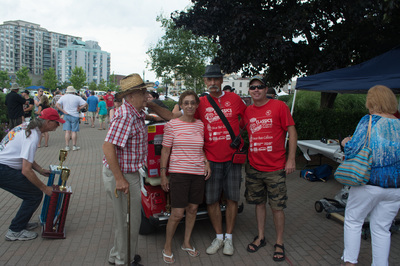 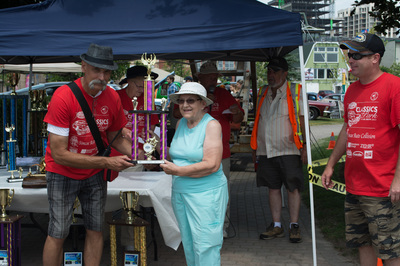 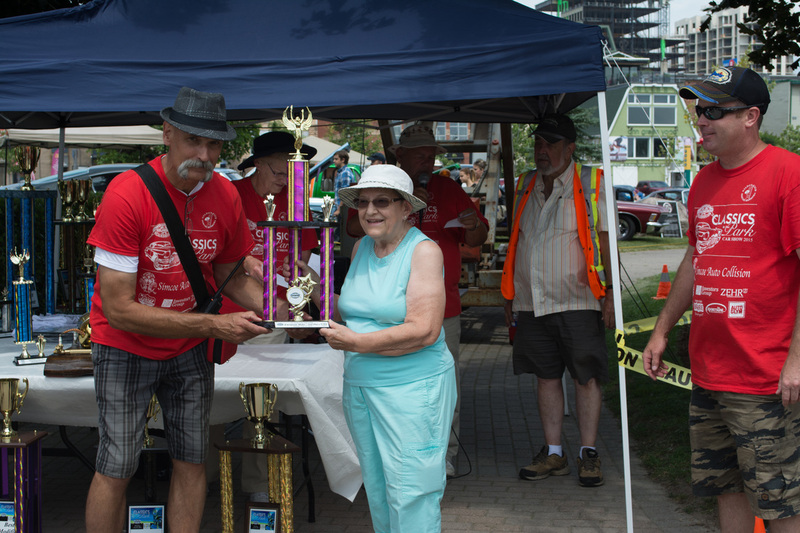 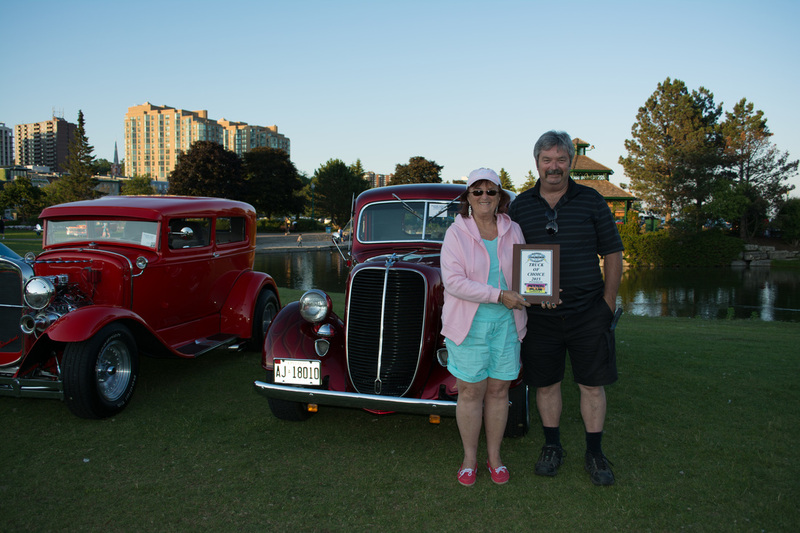 George Neshovski of Wimpy's Diner presents Judy Gallant with a plaque for best truck, a 1937 Ford. 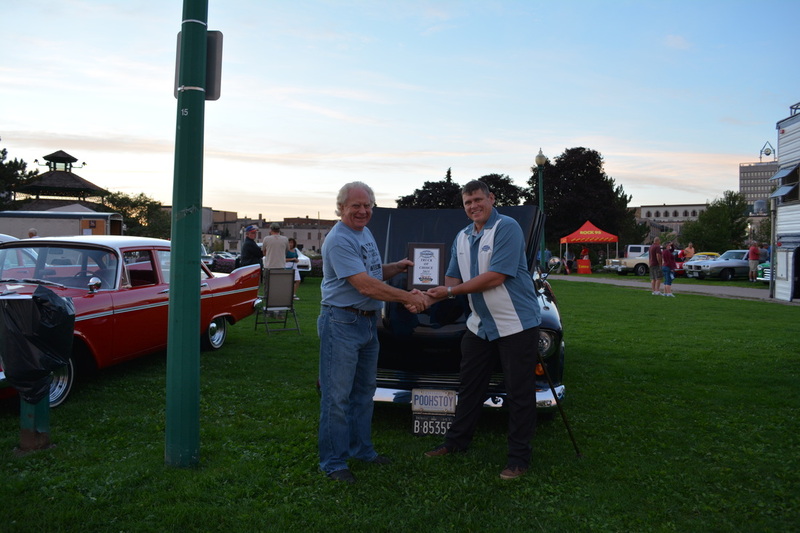 Morris Broomer of Petron Plus Formula 7 presents Frank Gonneau with a plaque for best car, a 1955 Oldsmobile 88. 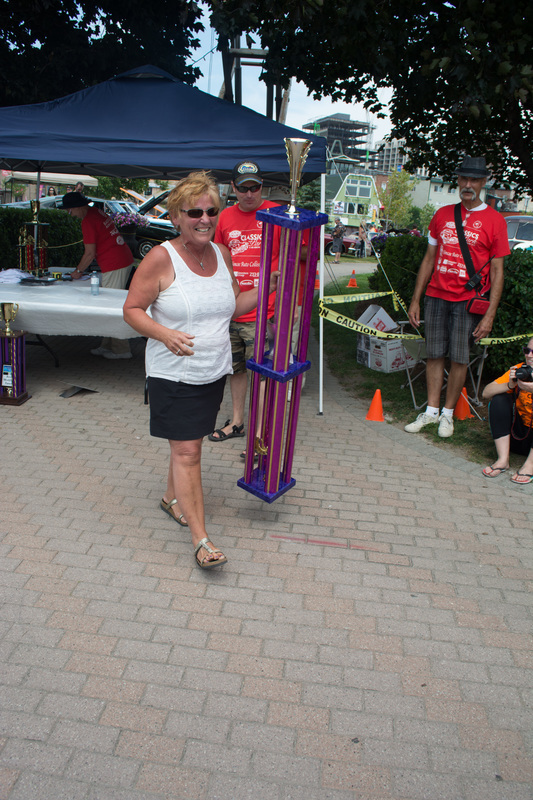 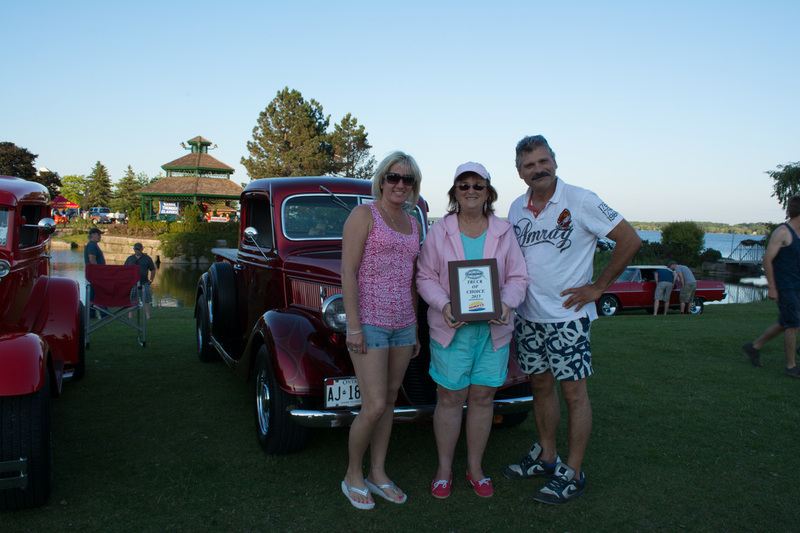 Morris Broomer of Petron Plus Formula 7 presents Judy Gallant a plaque for best truck a 1937 Ford. 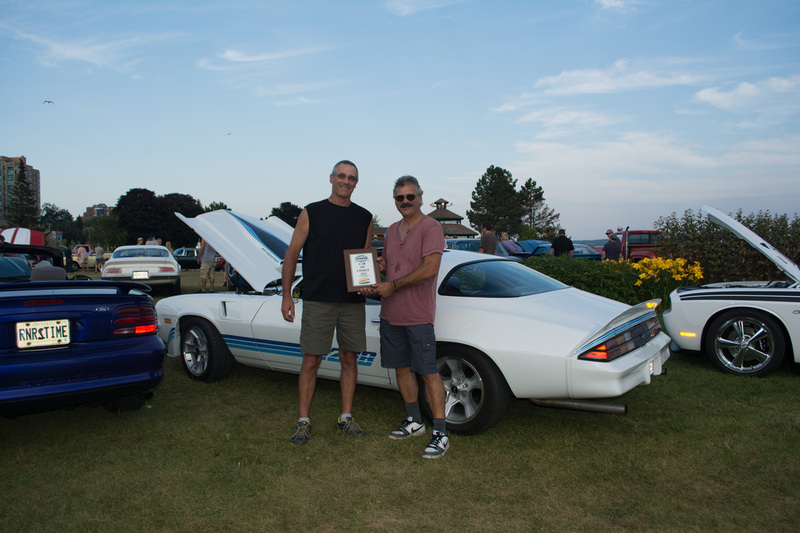 Steve Gradon of Rads Plus presents Peter White with a plaque for best a car, a 1969 Chevy Camaro. 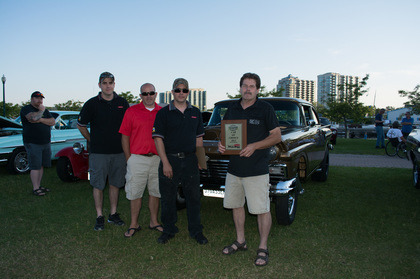 Steve Gradon of Rads Plus presents Name Withheld a plaque for best truck, a GMC. 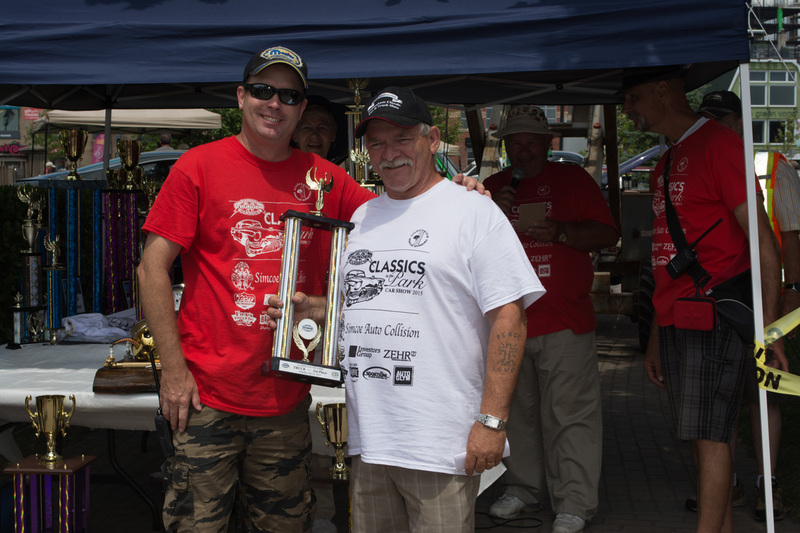 Cory Nickerson of Ideal Supply presents Don Gordon with a plaque for best car, a 1957 Ford Gasser. 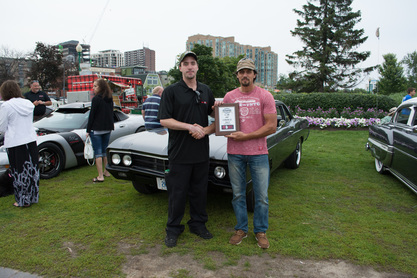 Paul Thompson of Ideal Supply presents Joe Bonitos with a plaque for best car, a 1961 Bonneville. 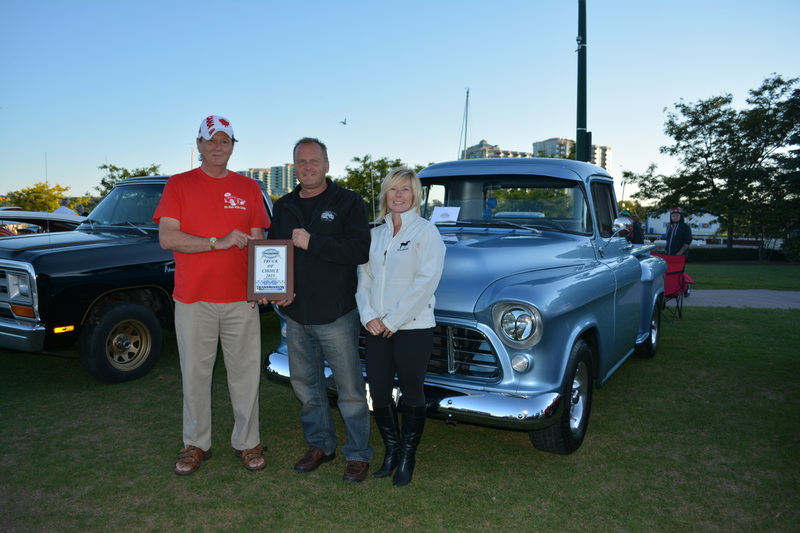 Cory Nickerson of Ideal Supply presents Paul Smith a plaque for best truck, a 1957 Chevy. 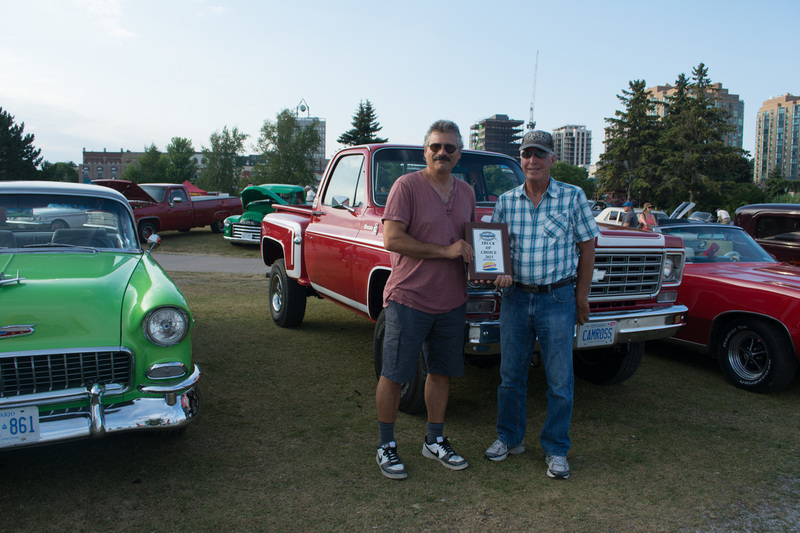 Paul Thompson of Ideal Supply presents Wayne Scott with a plaque for best truck, a 1975 Chevy C10. 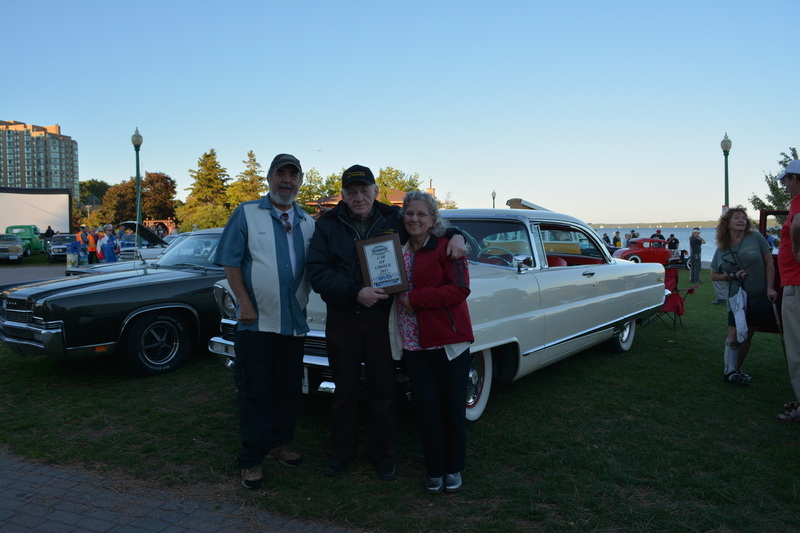 David Curlette on Behalf of Simcoe Trophies presents Anne-Marie and Ron Henderson with a plaque for best car, a 1957 Chevrolet Belair. 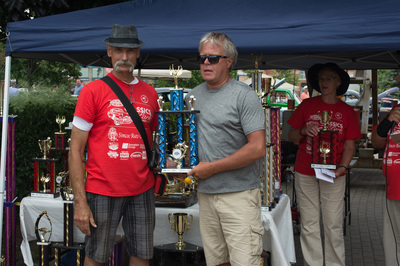 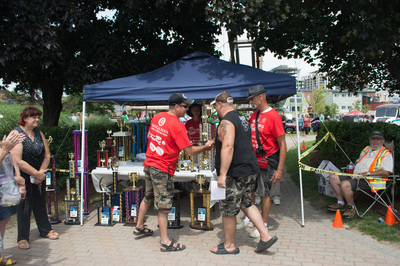 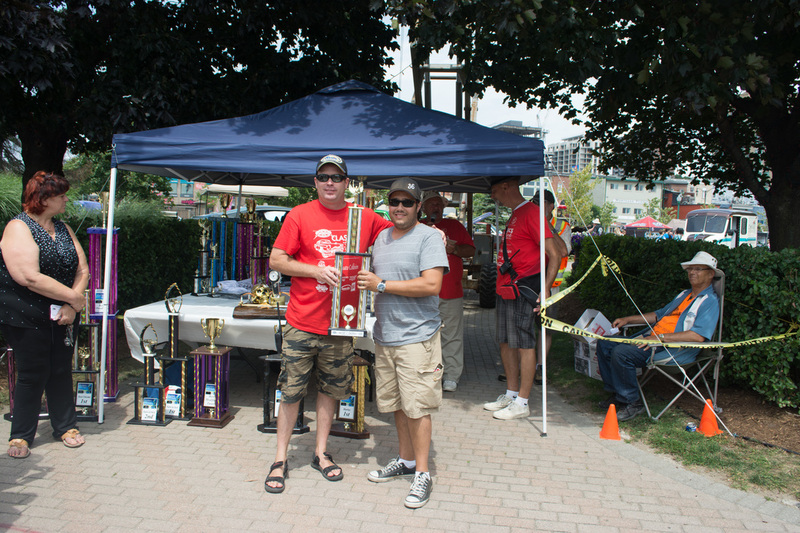 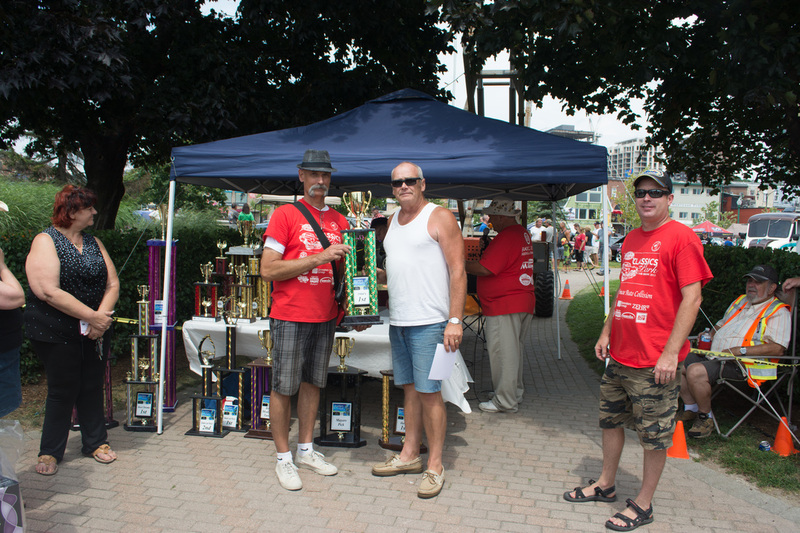 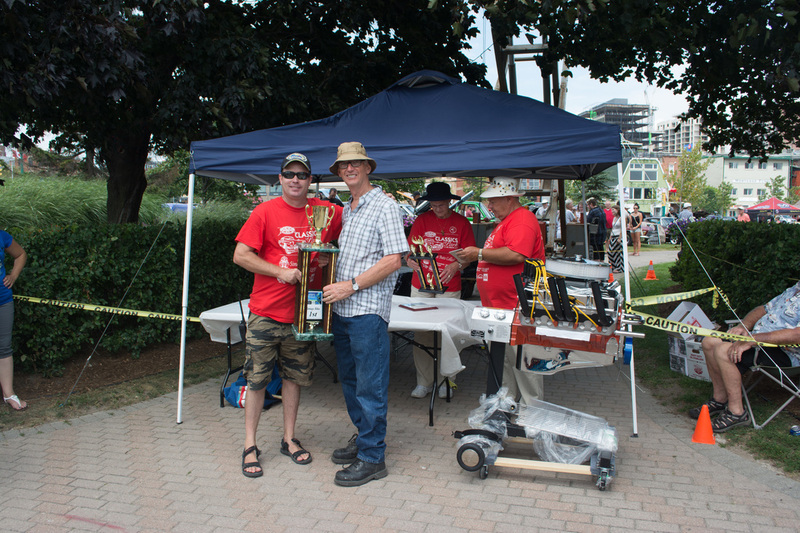 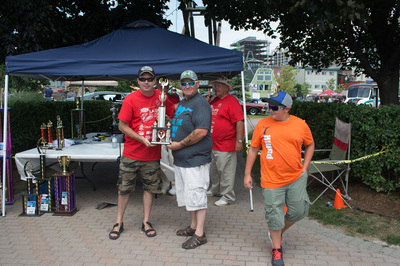 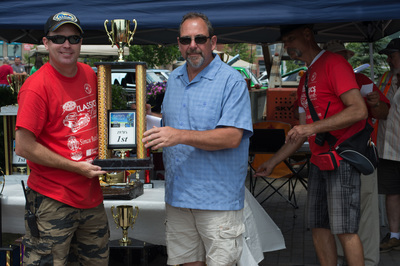 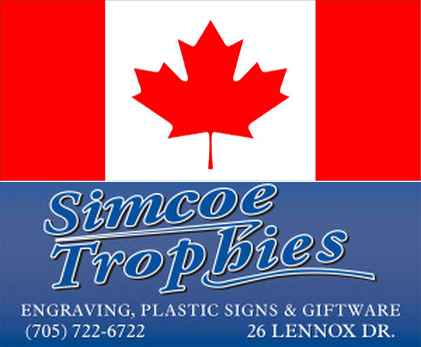 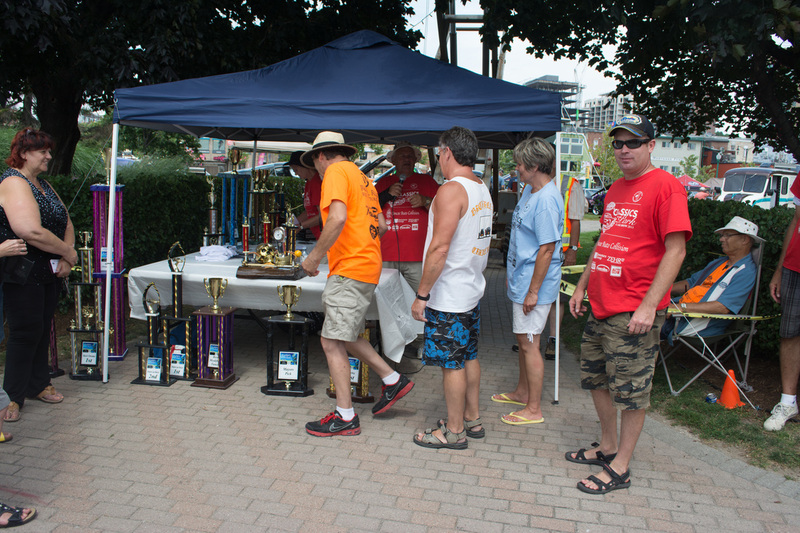 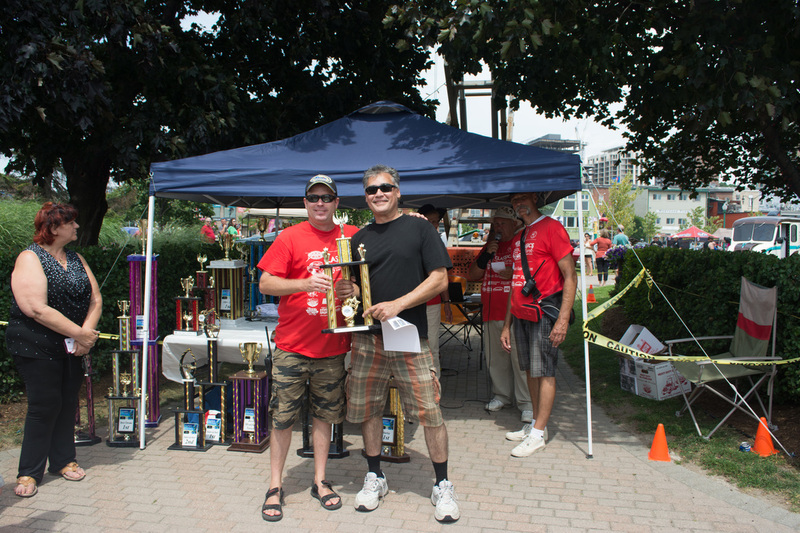 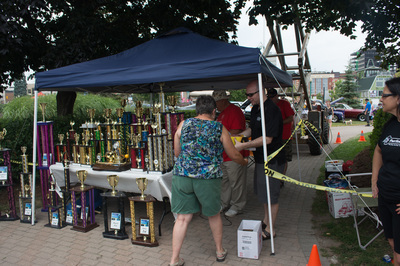 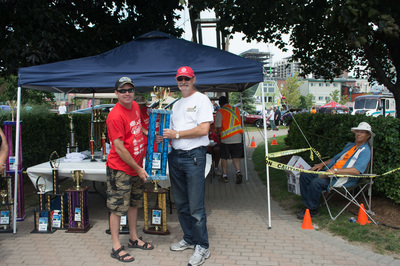 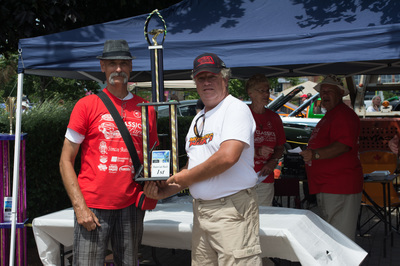 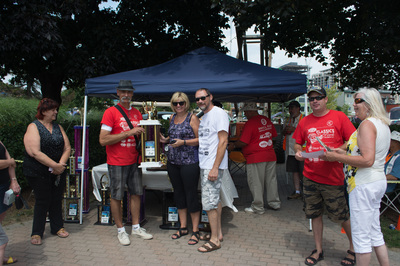 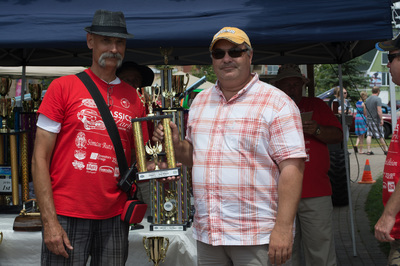 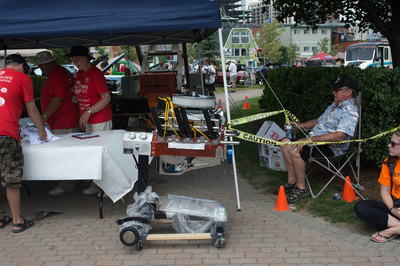 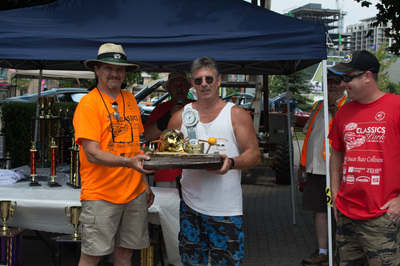 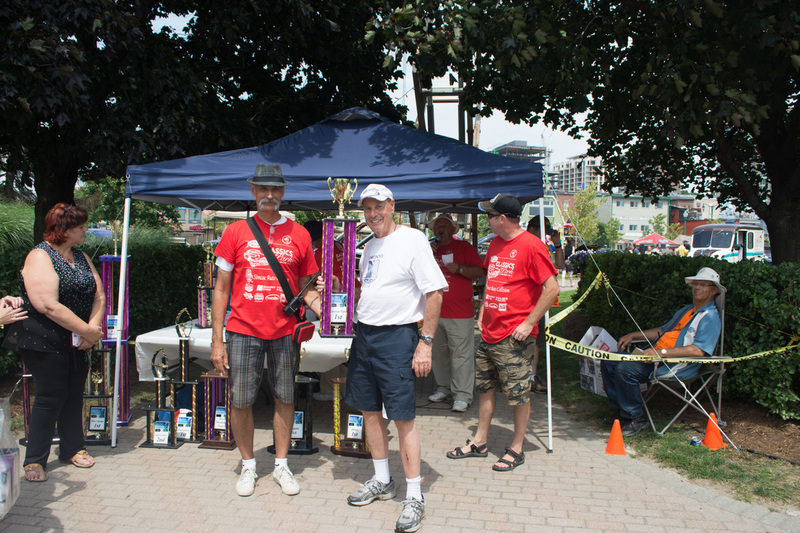 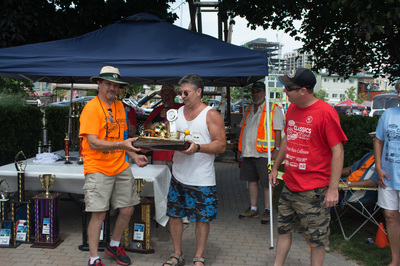 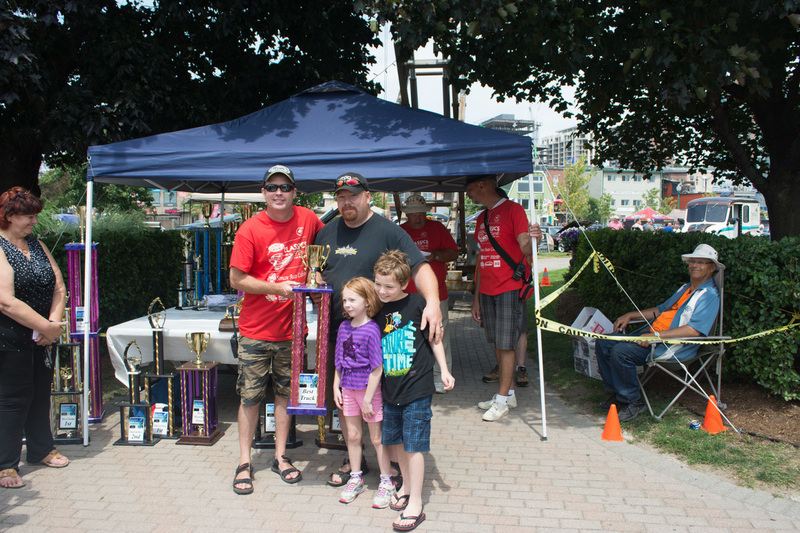 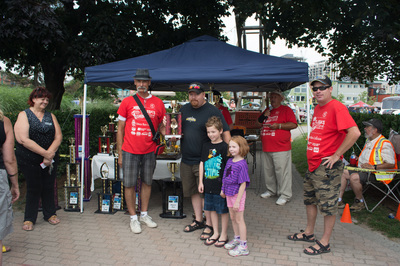 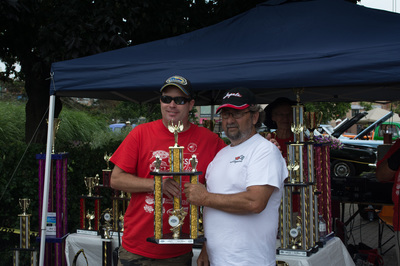 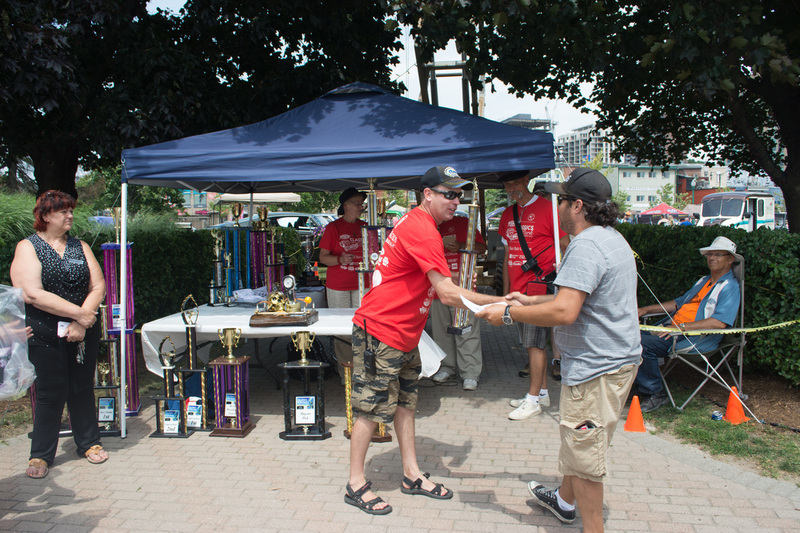 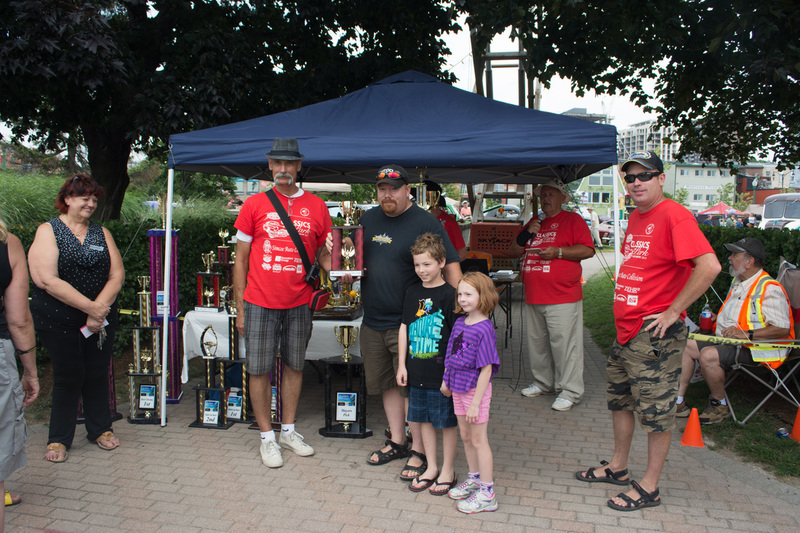 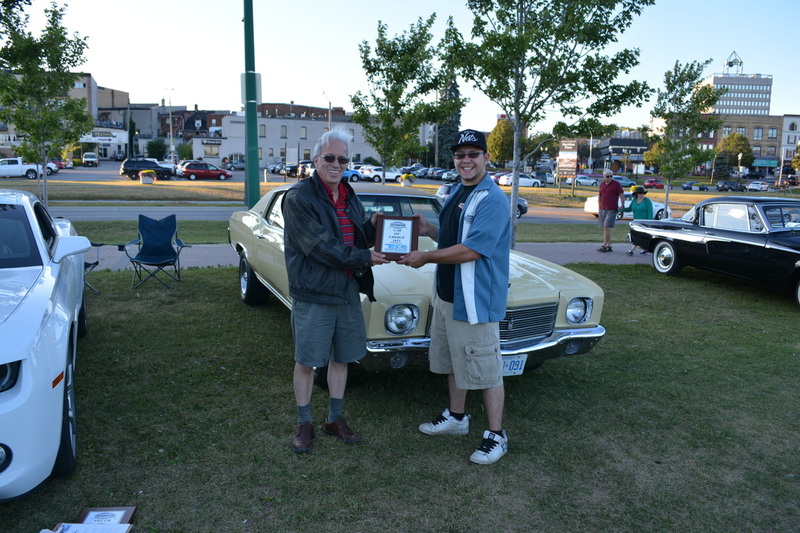 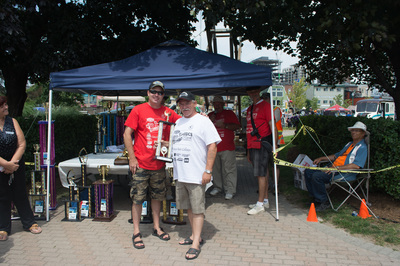 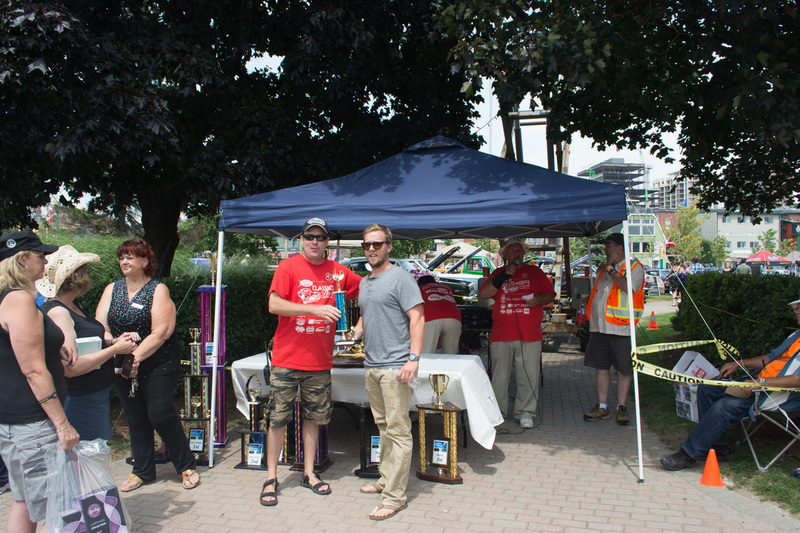 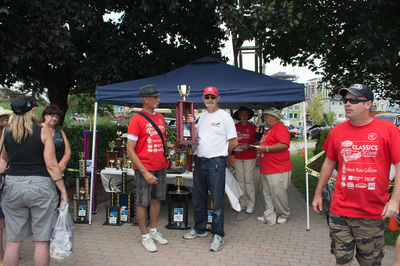 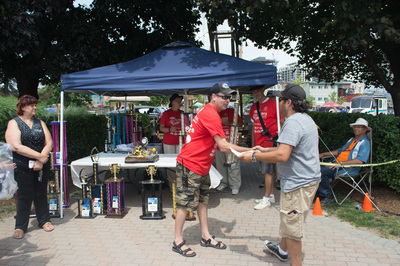 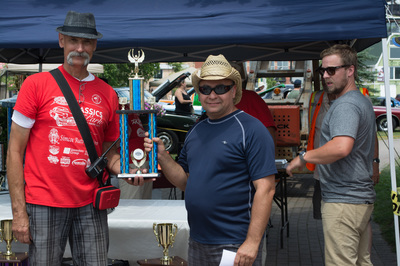 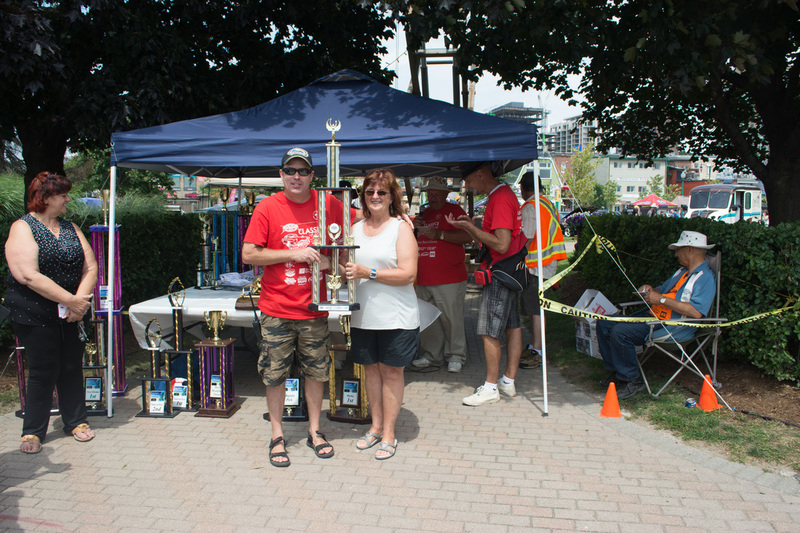 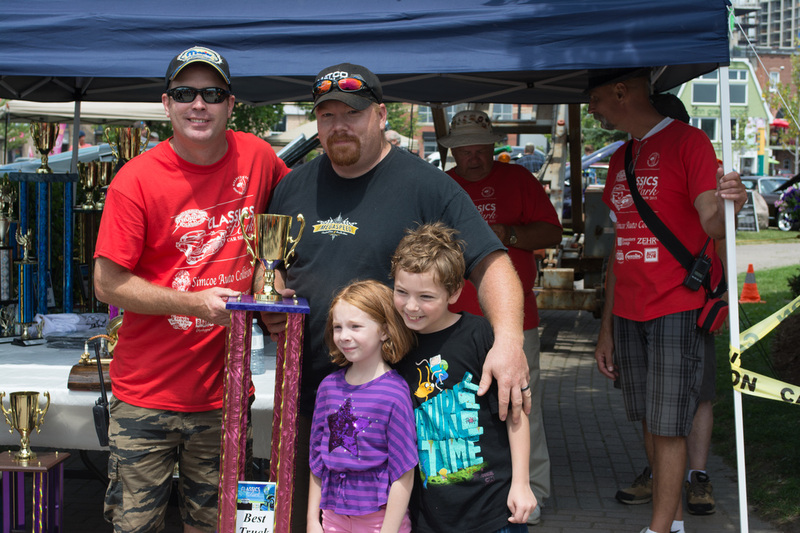 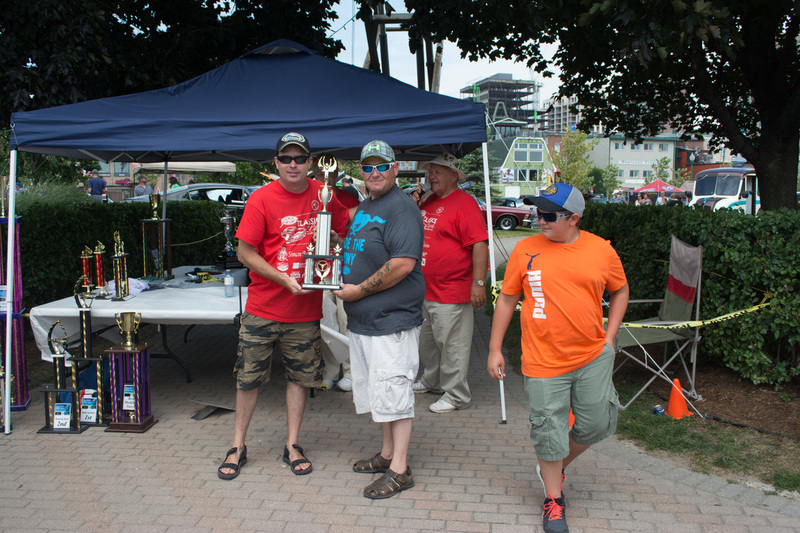 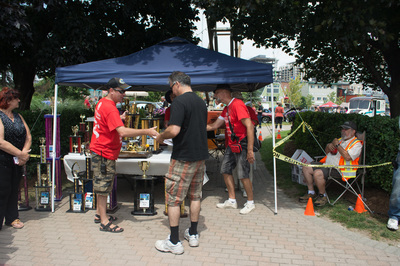 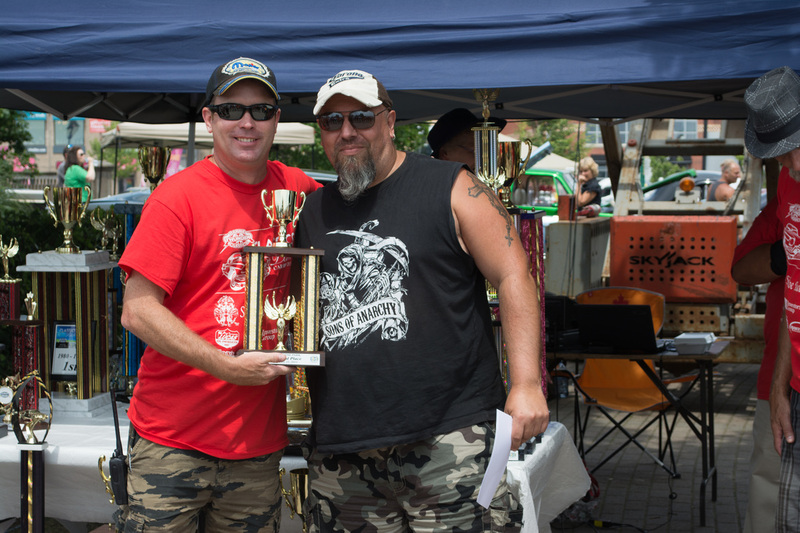 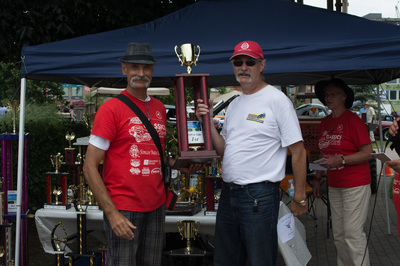 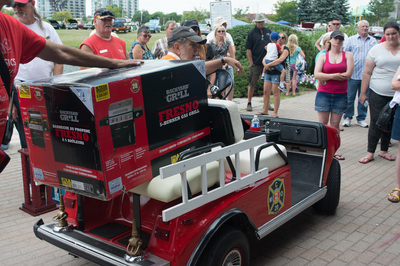 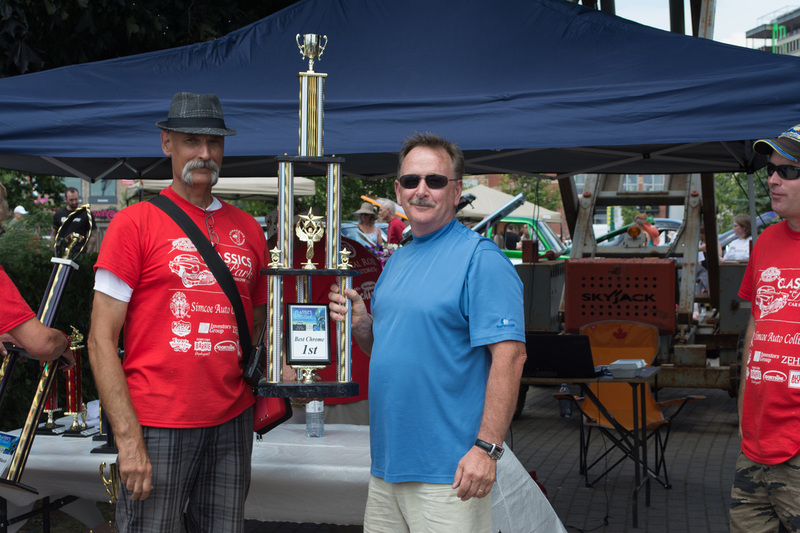 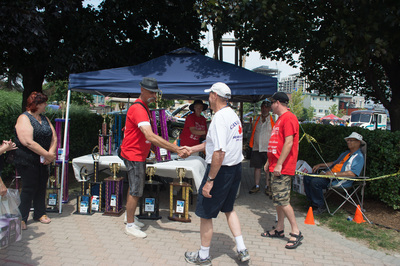 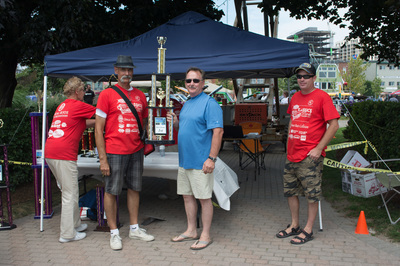 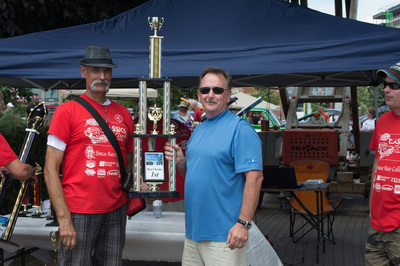 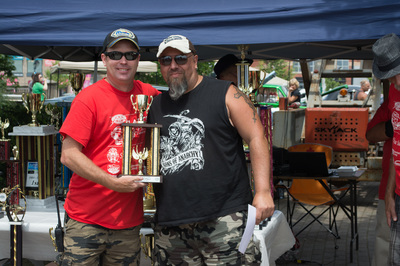 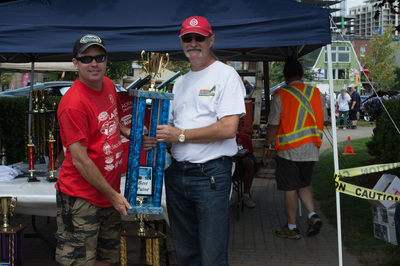 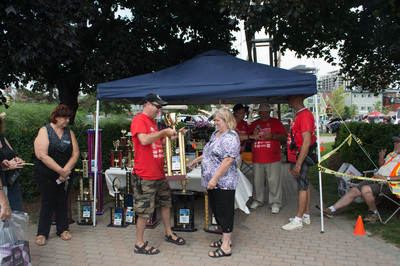 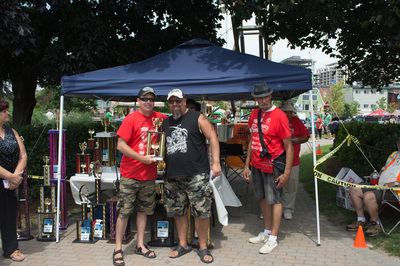 David Curlette on Behalf of Simcoe Trophies presents Steve Munshaw with a plaque for best truck, a 1976 Ford Ranchero. 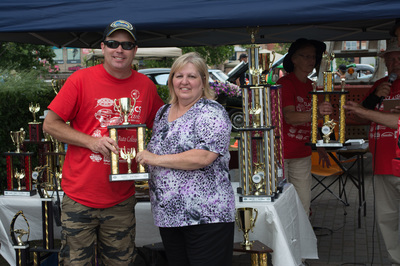 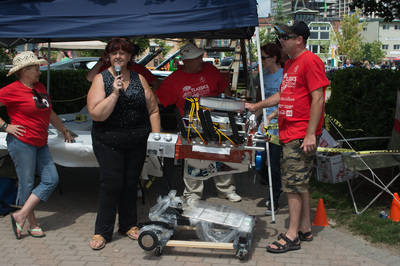 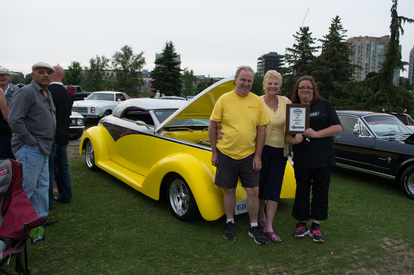 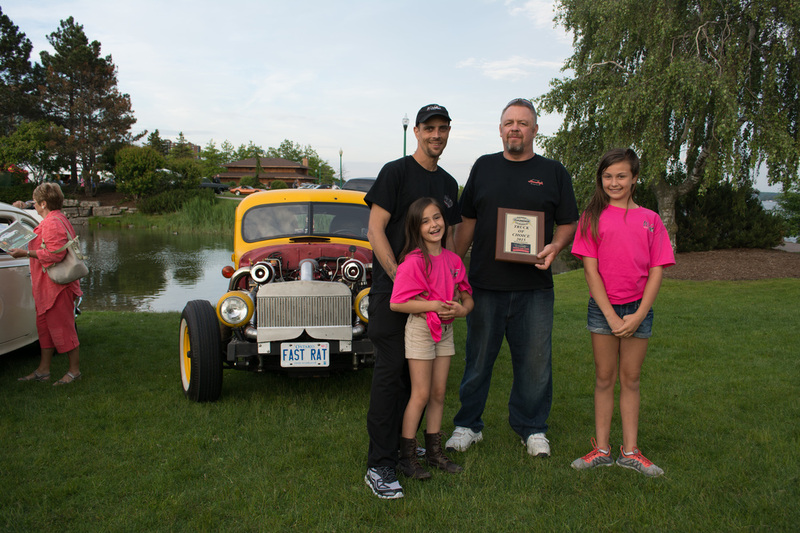 Michelle Caron of Part Source presents Larry & Lee Sawchuk with a plaque for best car, a 1939 Ford Custom. 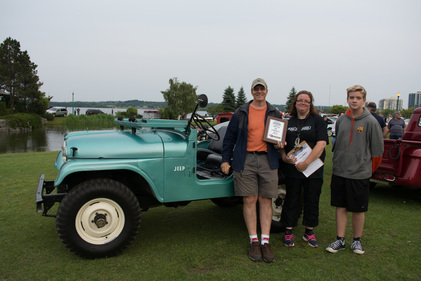 Michelle Caron of Part Source presents Pierre Desautels with a plaque for best truck, a 1966 Jeep Kaiser. Jordan Guerra of Tire Depot Barrie presents Al Provincial with a plaque for best car, a 1966 Buick Skylark. 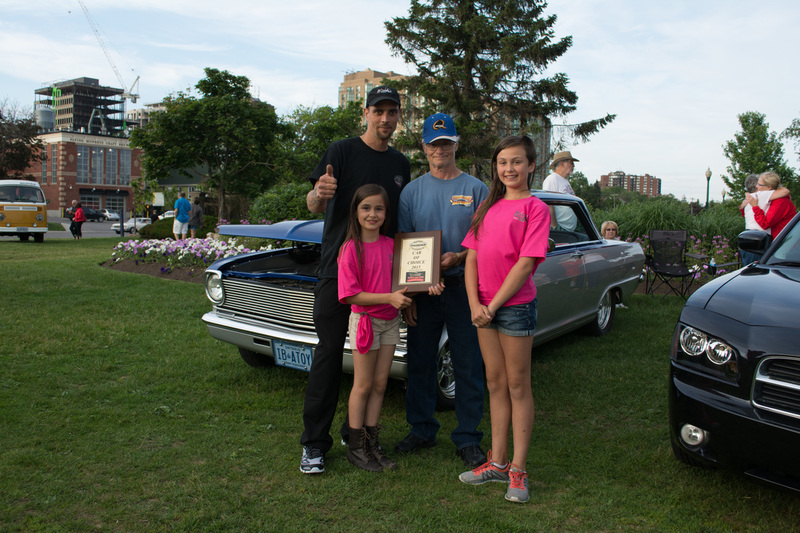 Jordan Guerra of Tire Depot Barrie presents Jim Croft with a plaque for best truck, a 1959 GMC 100. 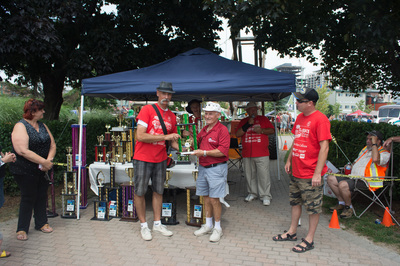 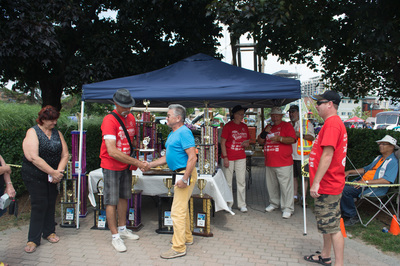 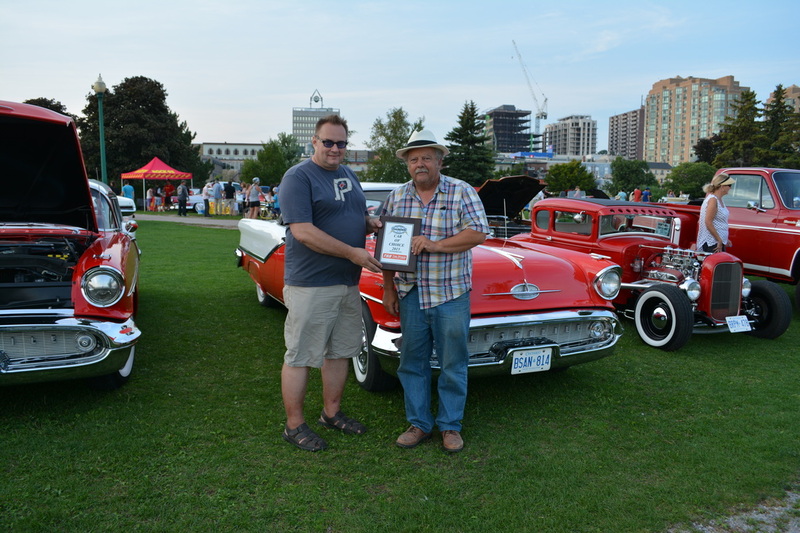 Tom Carlos of the Barrie Thunder Classics CC on behalf of Steve Fox of Fox's Bakery and Deli presents John Cruse with a plaque for best car, a 1956 Chevy 210. 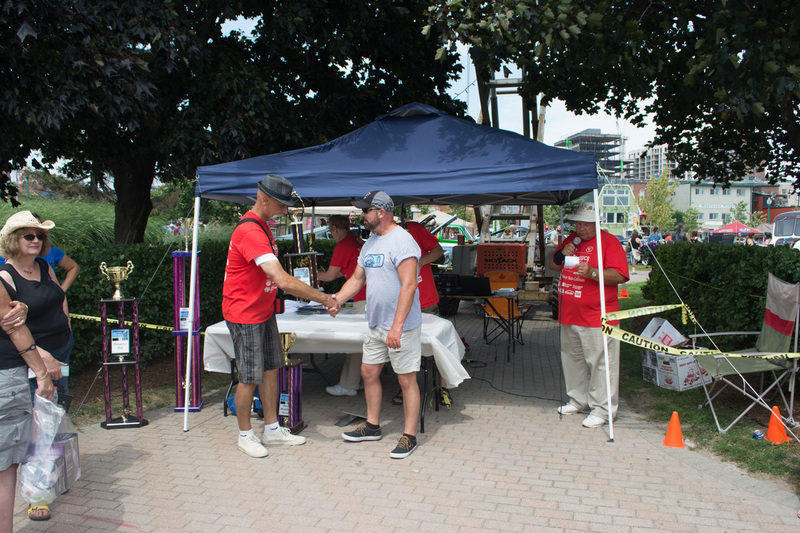 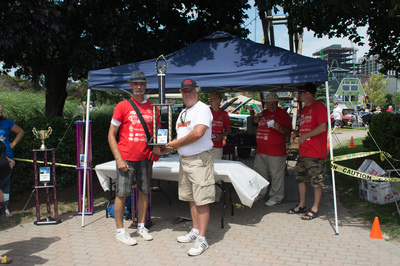 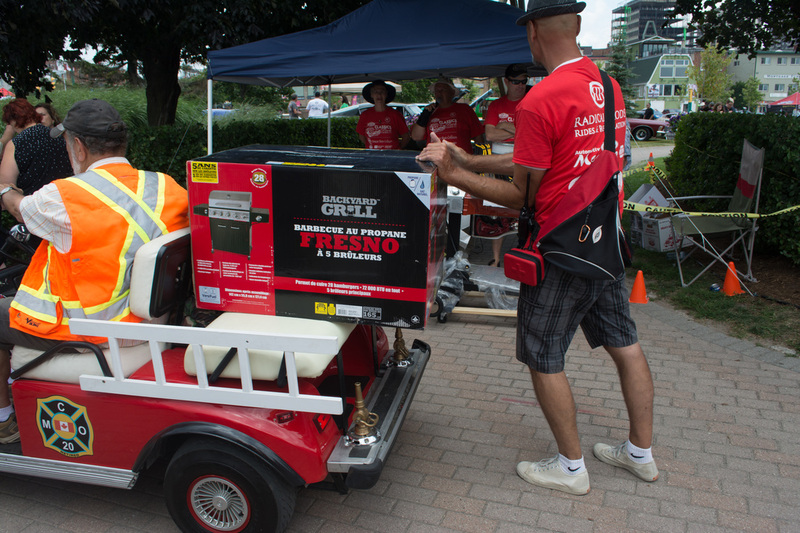 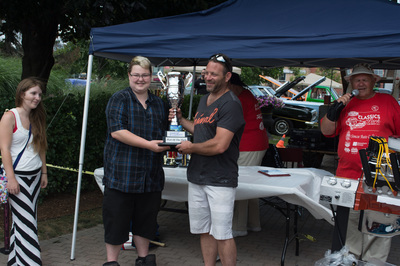 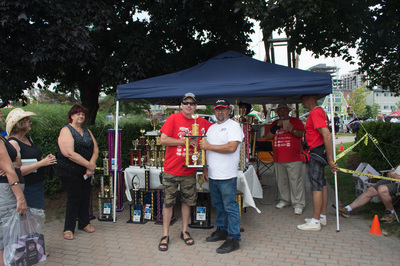 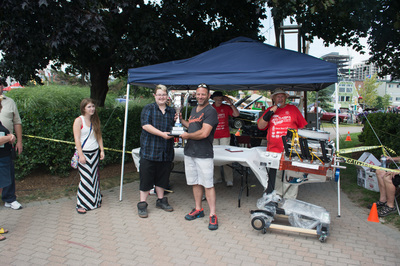 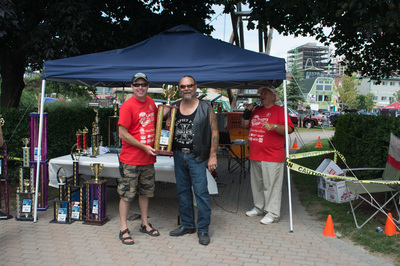 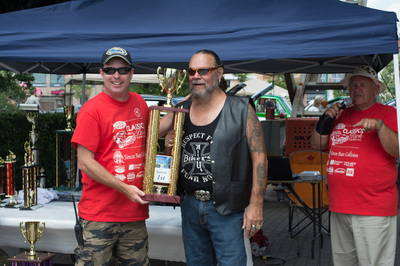 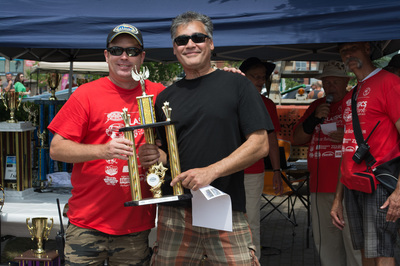 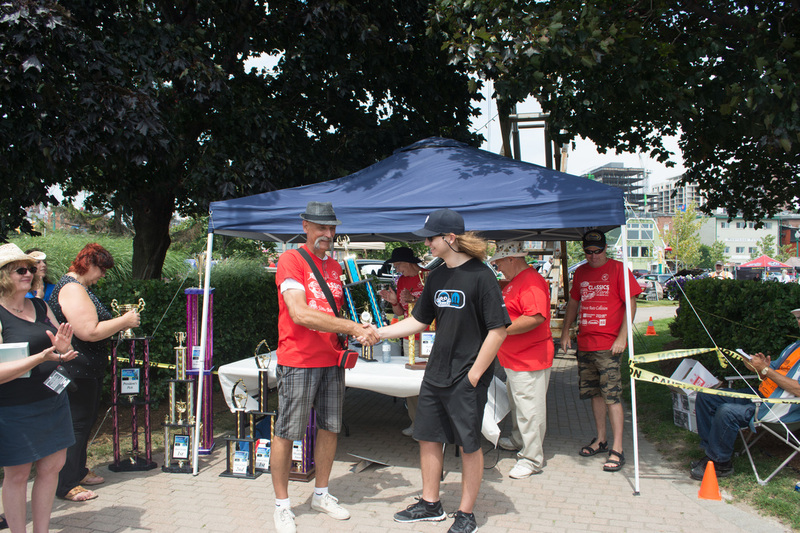 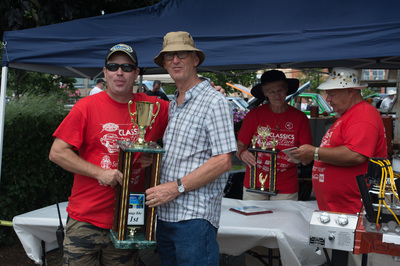 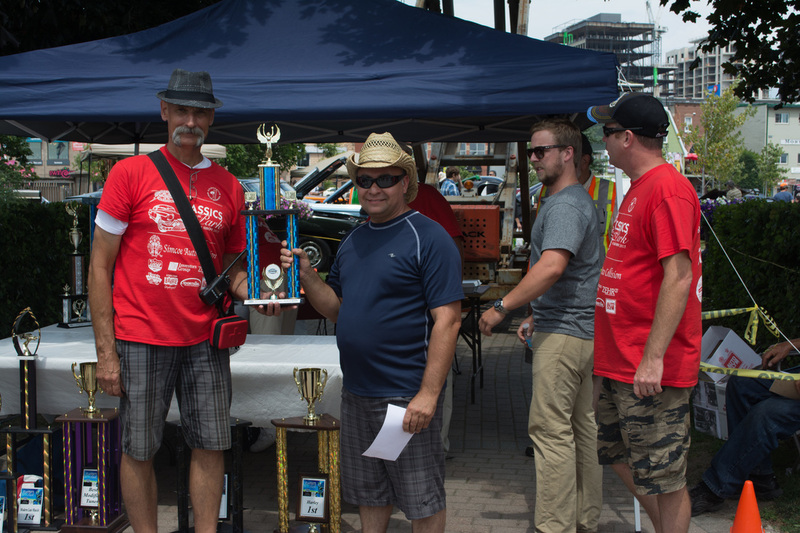 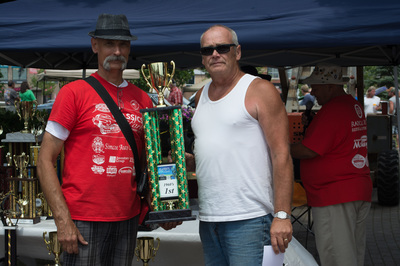 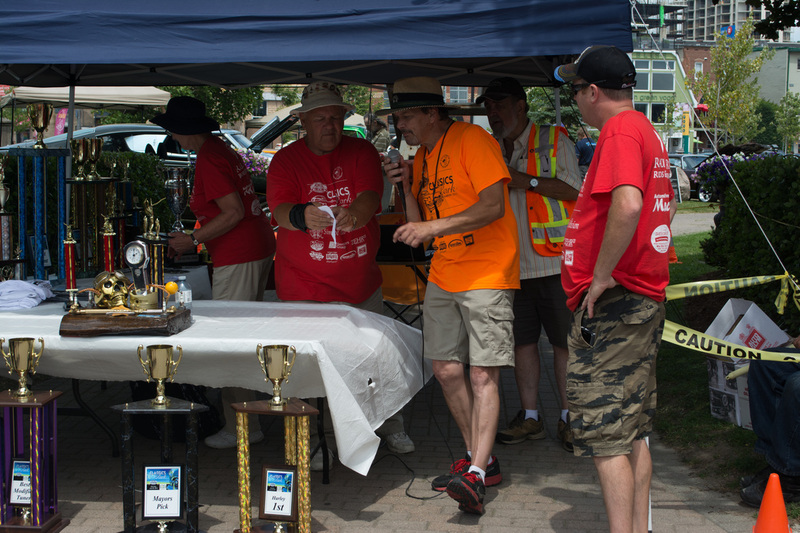 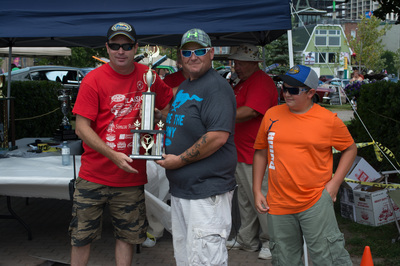 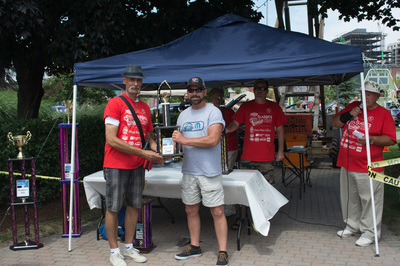 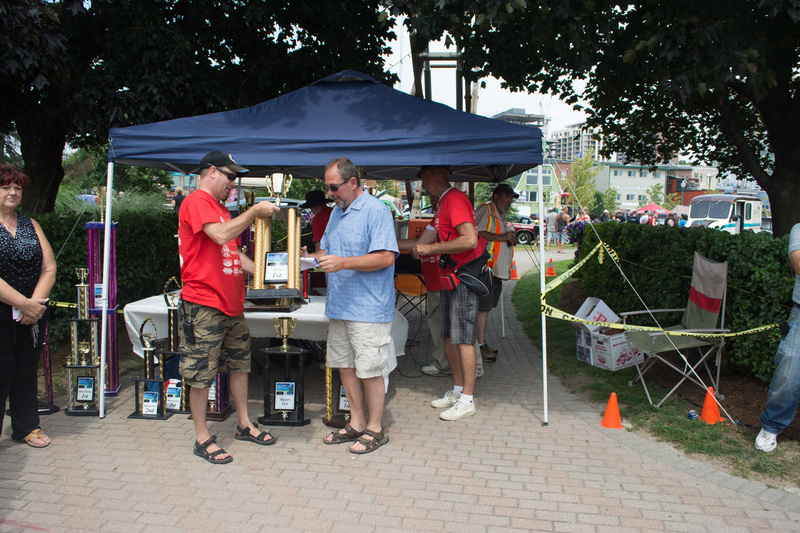 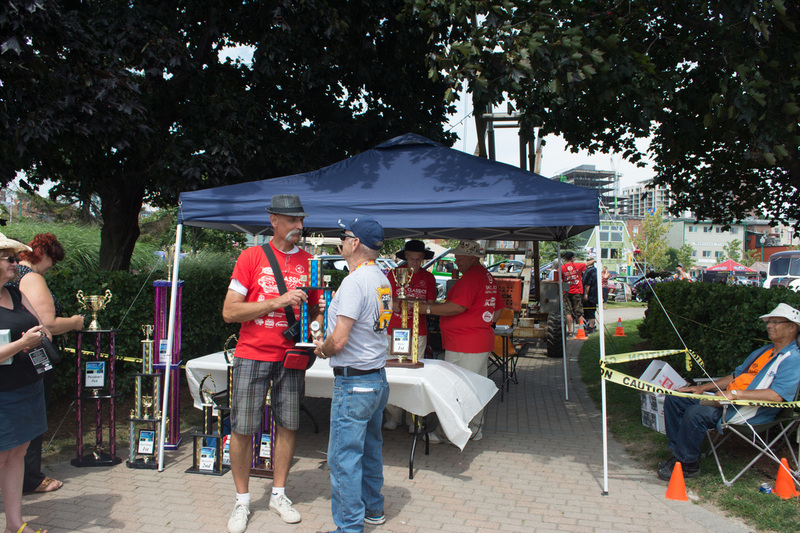 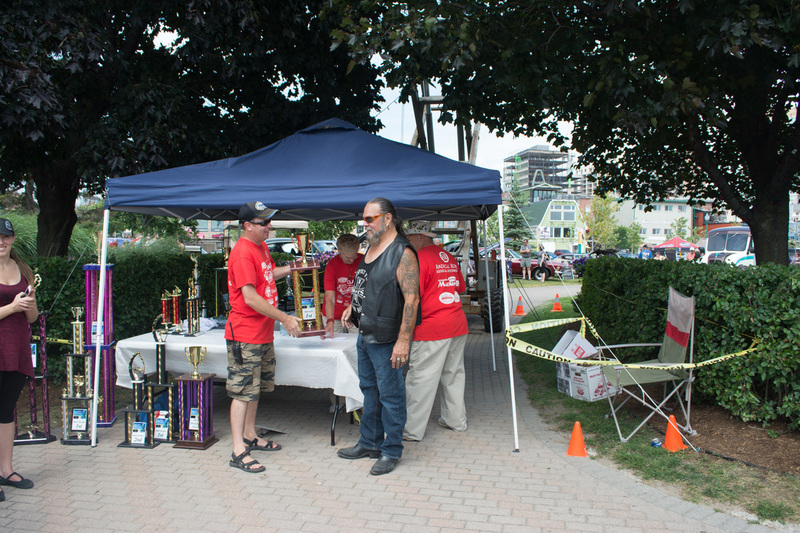 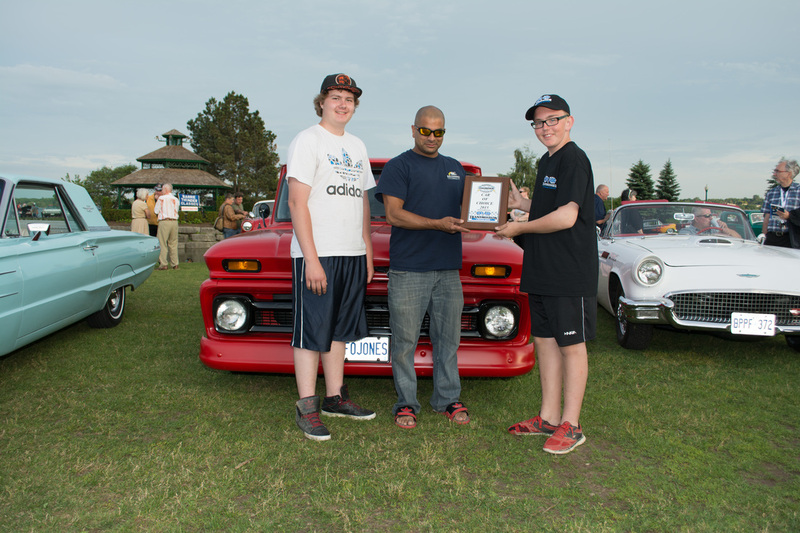 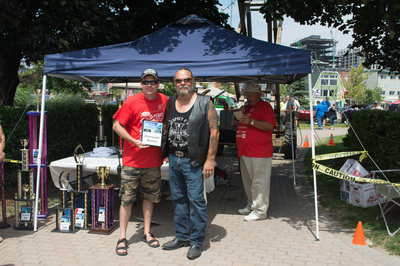 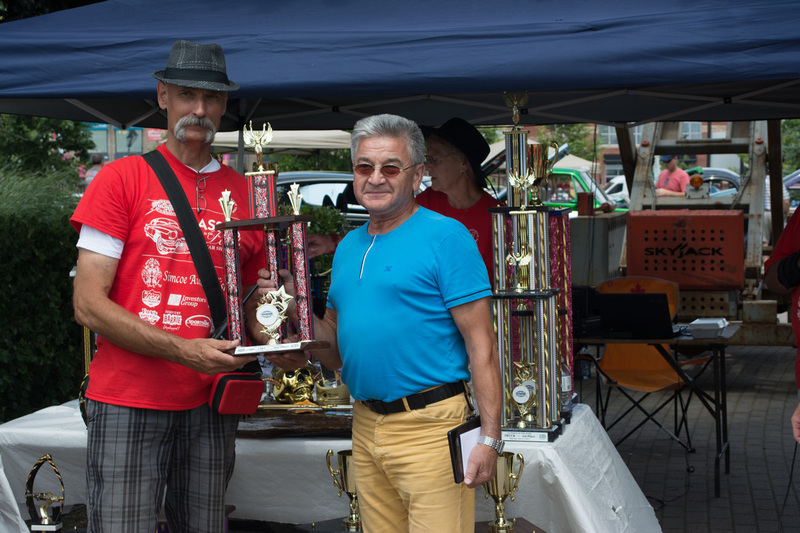 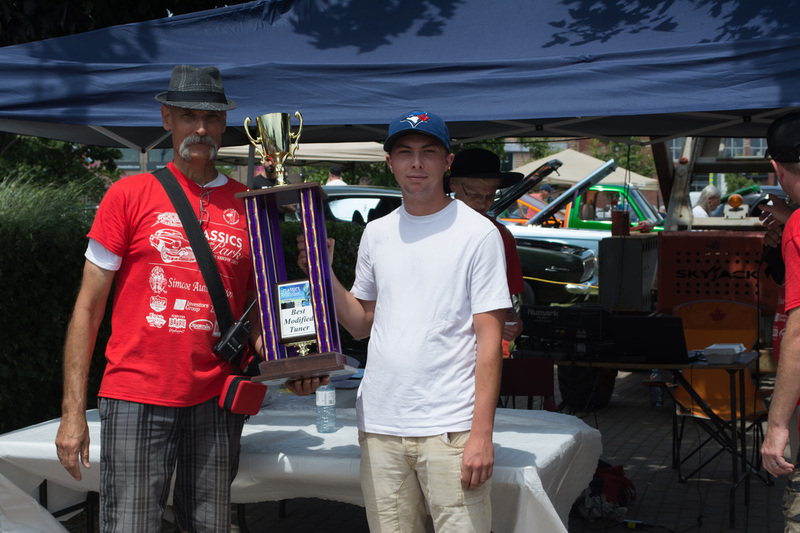 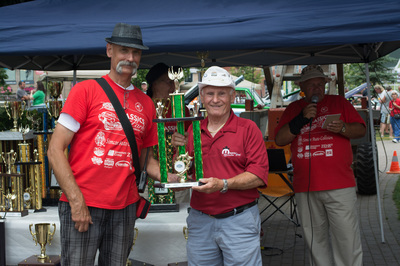 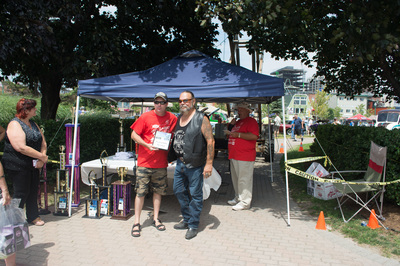 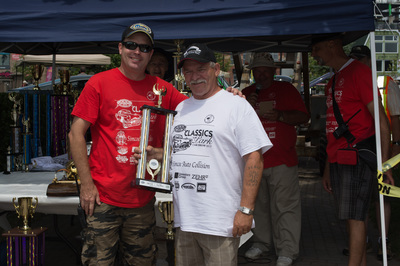 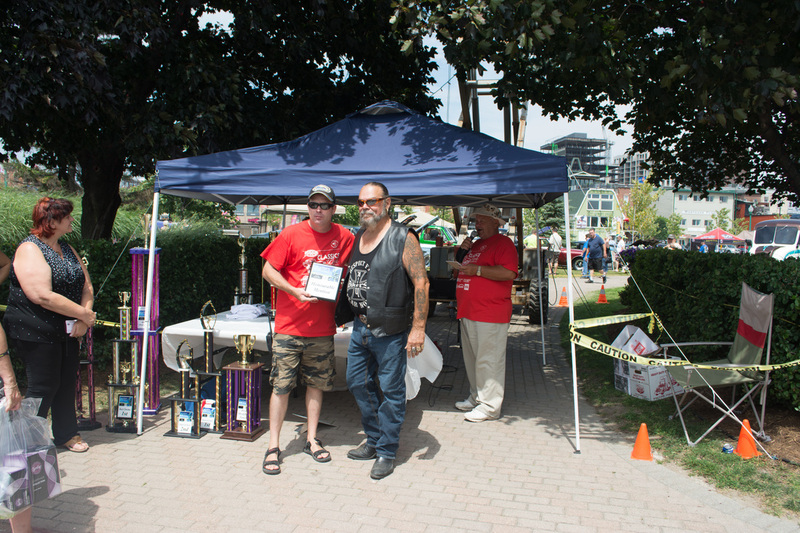 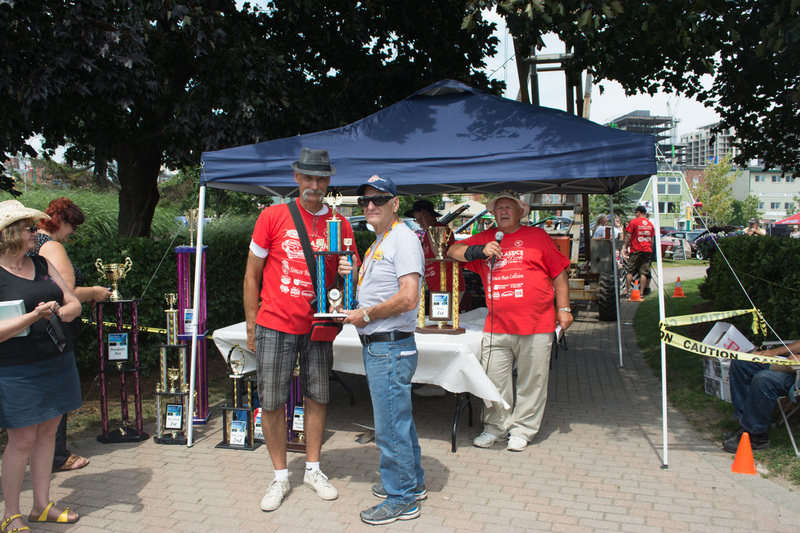 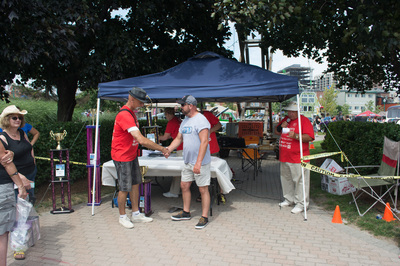 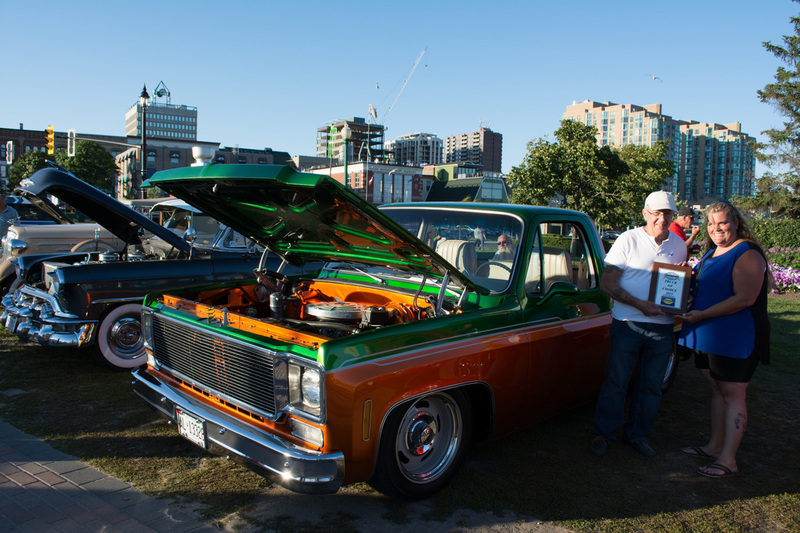 Tom Carlos of the Barrie Thunder Classics CC on behalf of Steve Fox of Fox's Bakery and Deli presents Shane Joachim with a plaque for best truck, a 1966 Chevy C10. 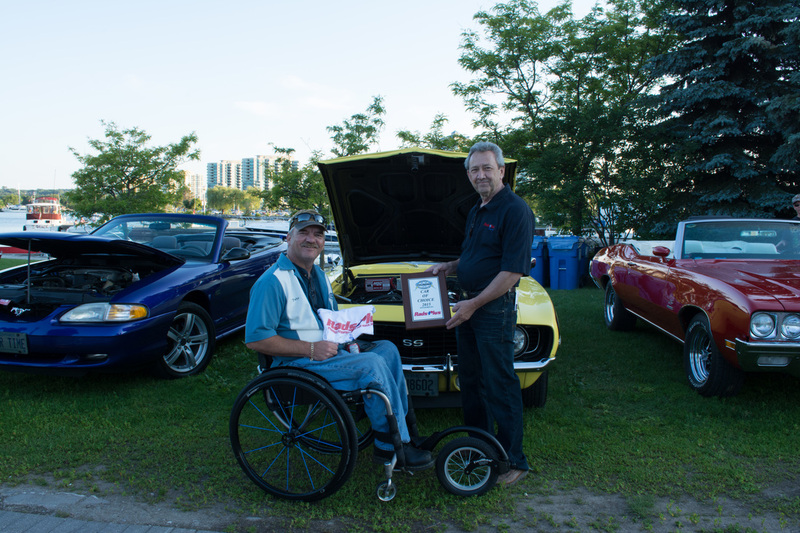 Dave McFarland of Performance Improvements presents Paul Stojan with a plaque for best car, a 1966 Ford Mustang Hertz GT350H. 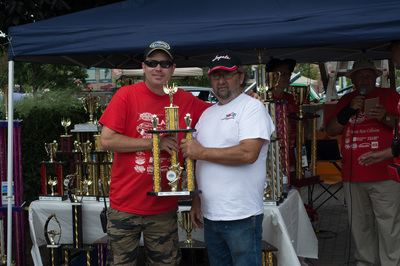 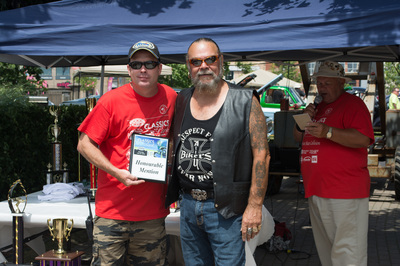 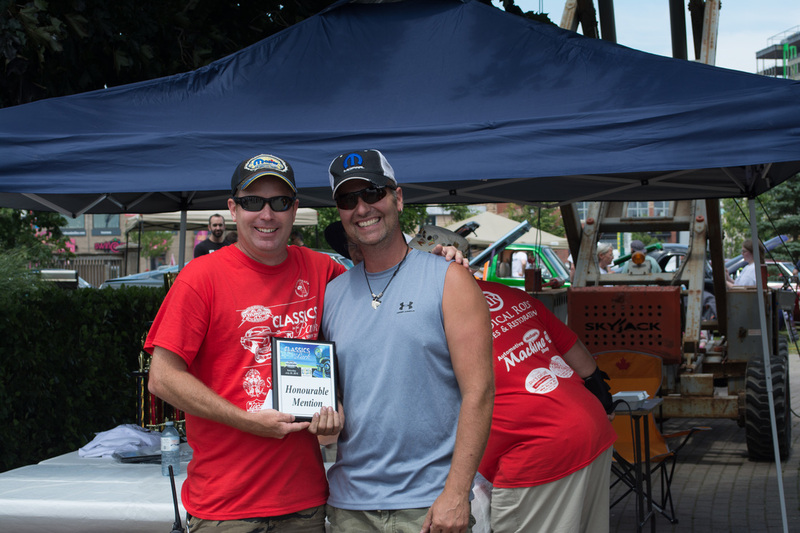 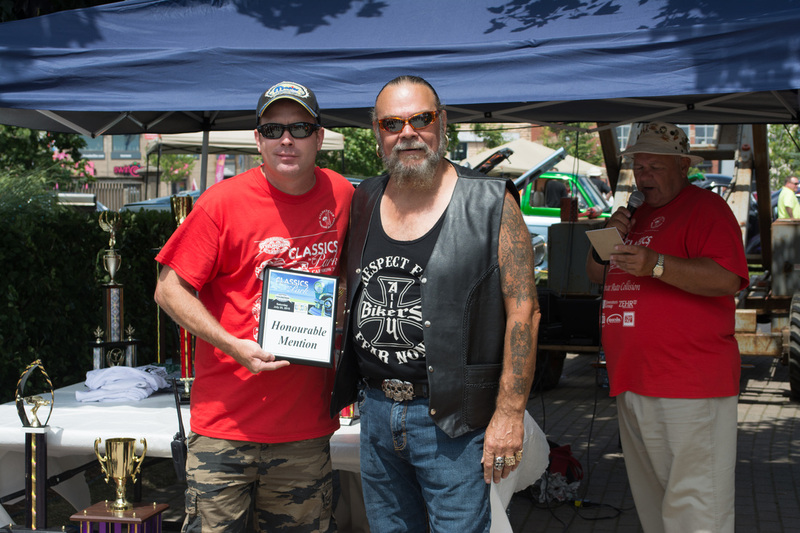 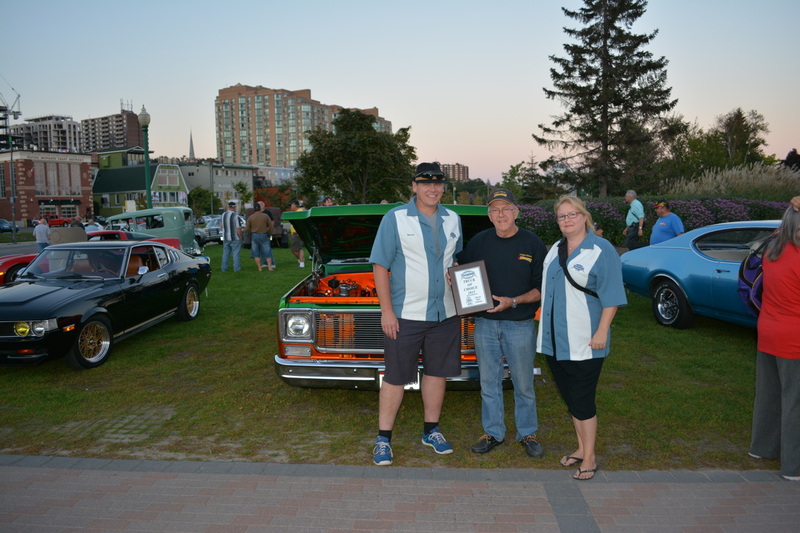 Dave McFarland of Performance Improvements presents John Ens with a plaque for best truck, a 1964 F100 Rat Rod. 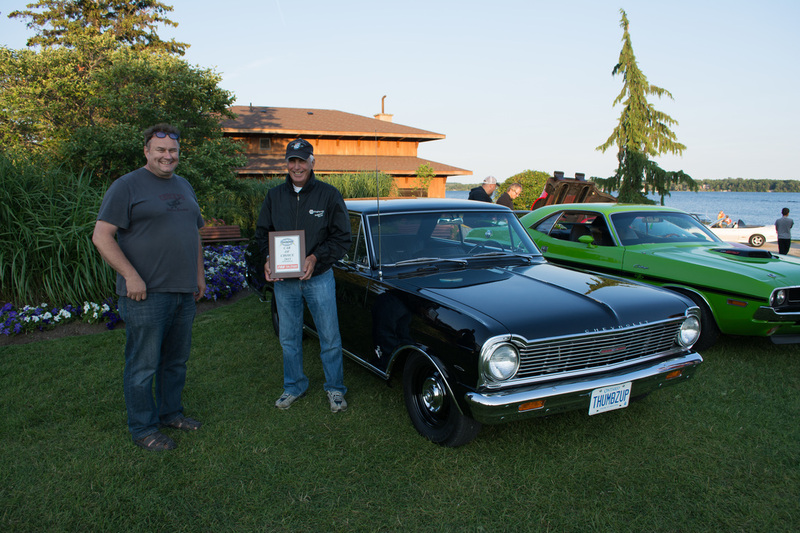 Darryl Stephenson of TSS Top Shops presents Doug Campbell with a plaque for best car, a 1965 Chevy Nova SS. 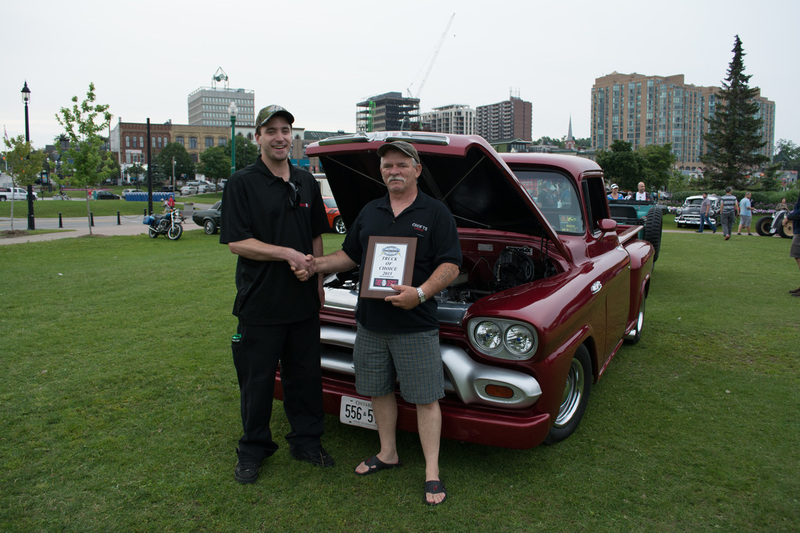 Darryl Stephenson of TSS Tops Shop presents David Martin with a plaque for best Truck, a 1956 Ford F100. 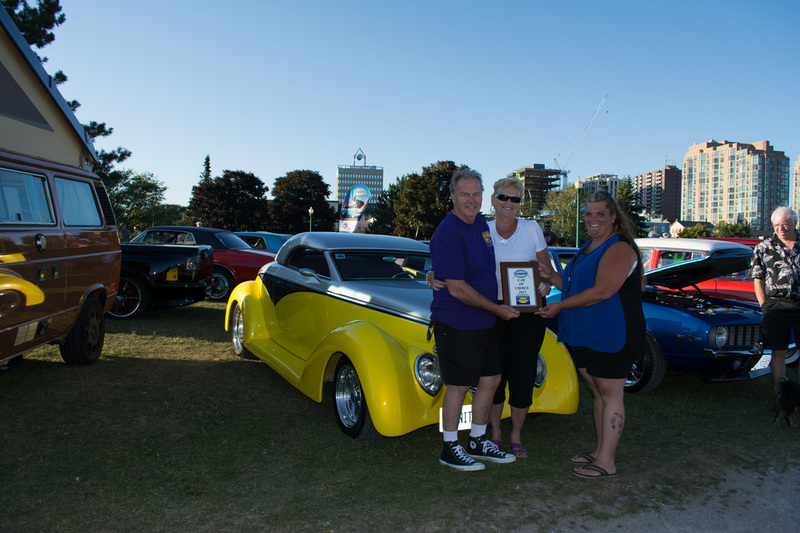 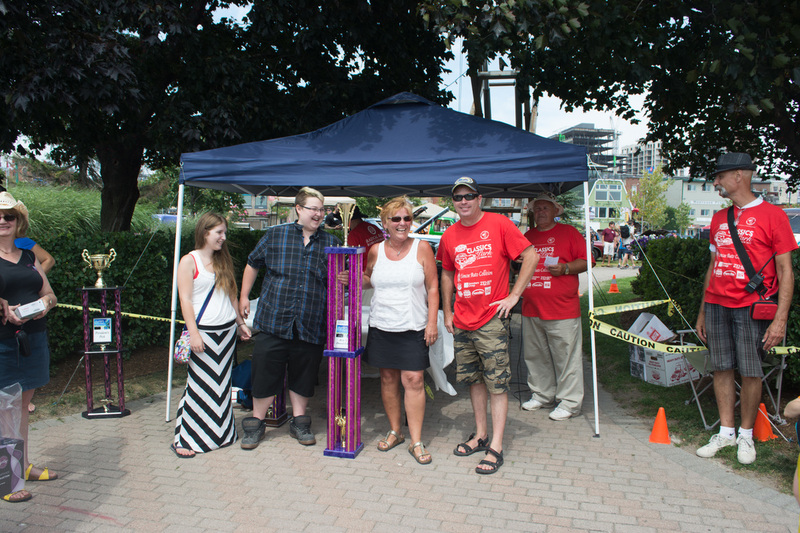 Sara and Danica of Hooters Barrie presents Rose Ann Bishop with a plaque for best car, a 1934 Ford Custom Hot Rod. 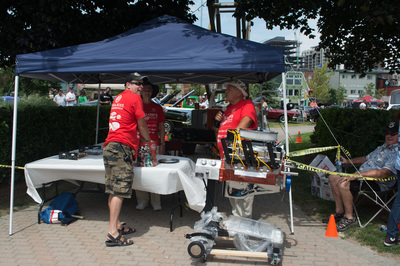 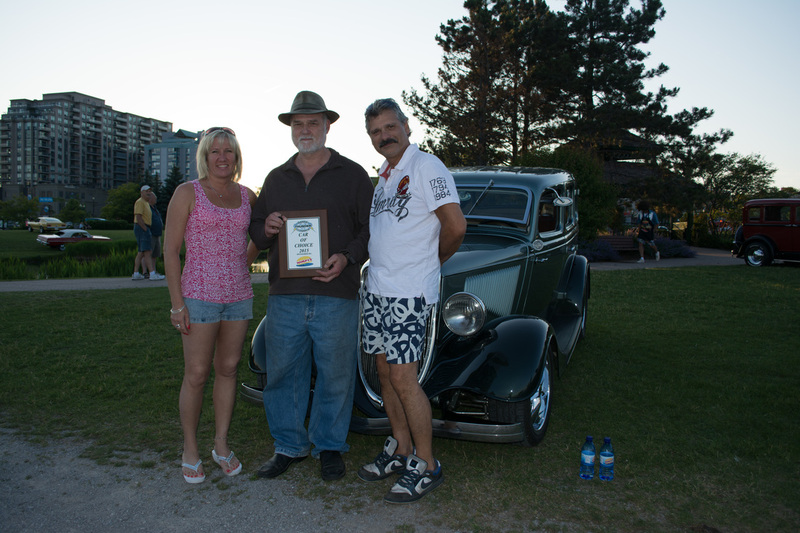 Sara and Danica of Hooters Barrie presents David Whitman with a plaque for best truck, a 1948 Chevrolet Thriftmaster. 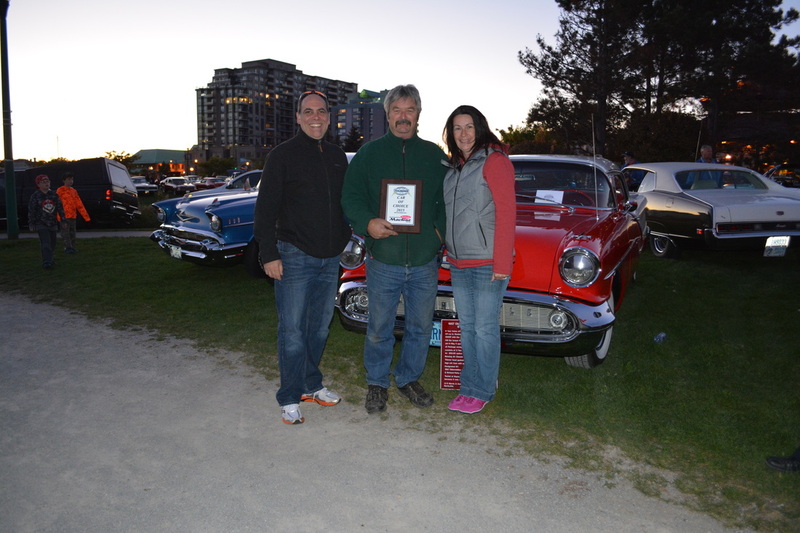 Mike Bertucca of Simcoe Auto Collision Centre presents Brian and Liszz Palmer with a plaque for best car, a 1963 Ford Thunderbird. 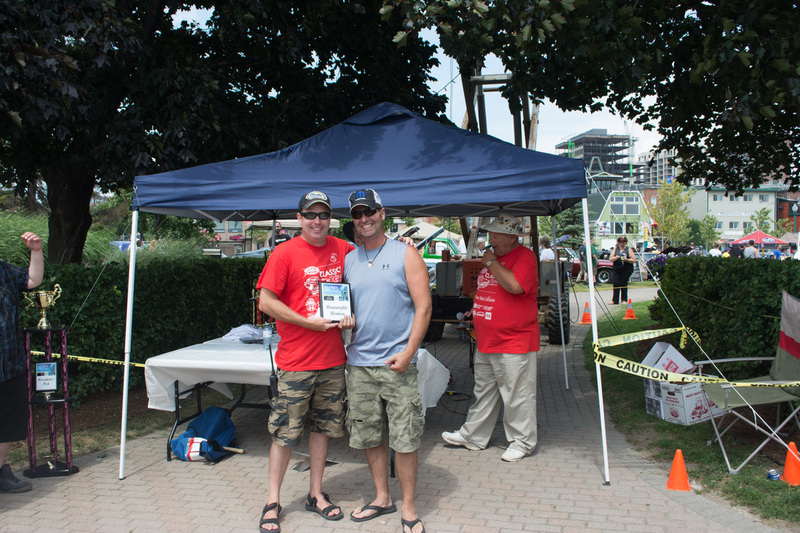 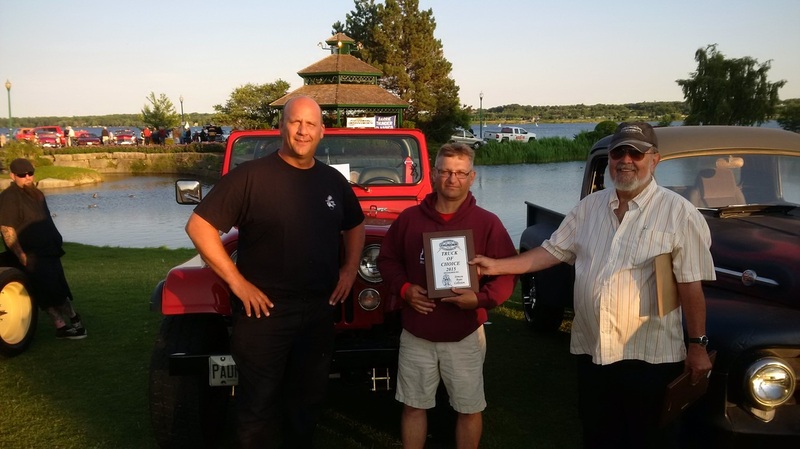 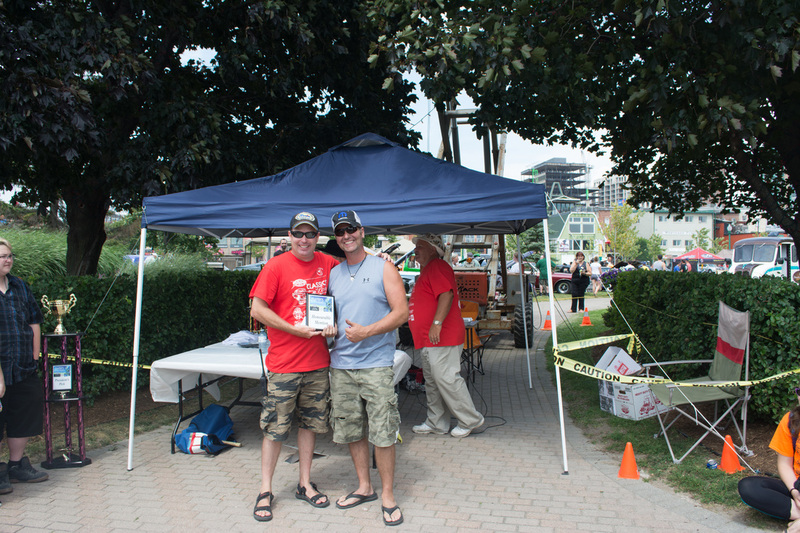 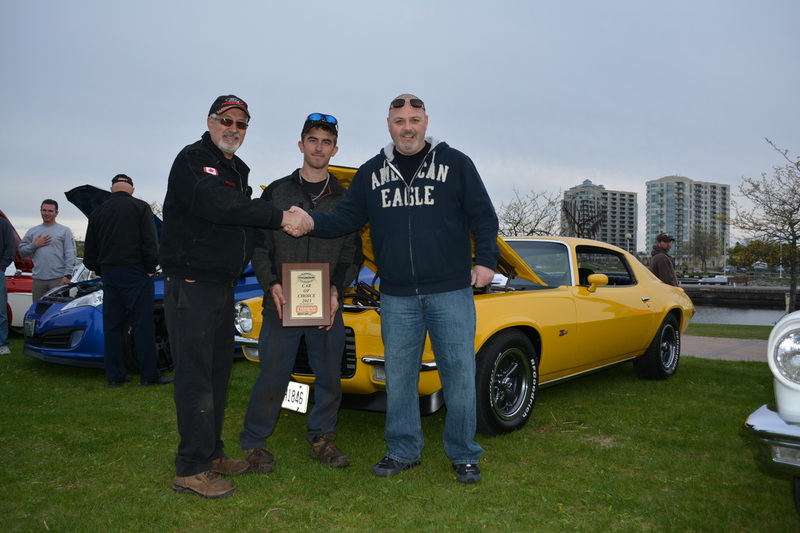 Mike Bertucca of Simcoe Auto Collision Centre presents Jay Davis with a plaque for best truck, a 1983 Jeep Renegade. 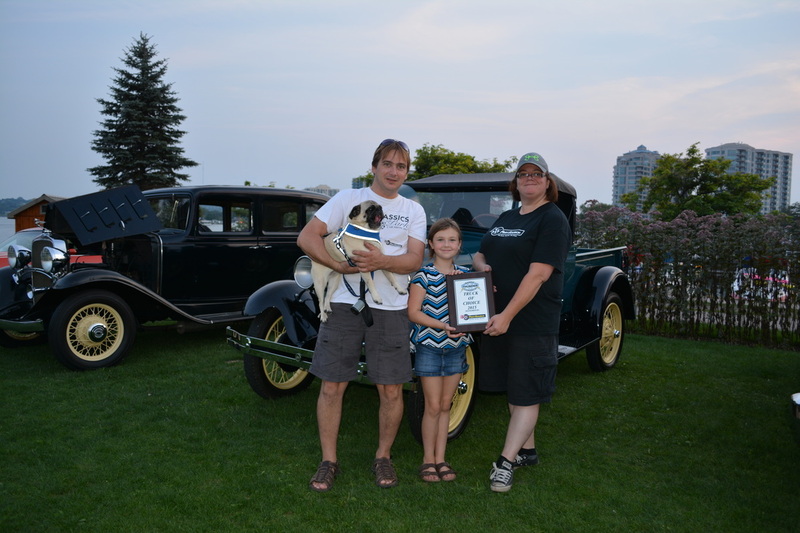 Leighann Miller of HotSpot Auto Parts presents Larry & Lee Sawchuk with a plaque for best car, a 1939 Ford Custom. 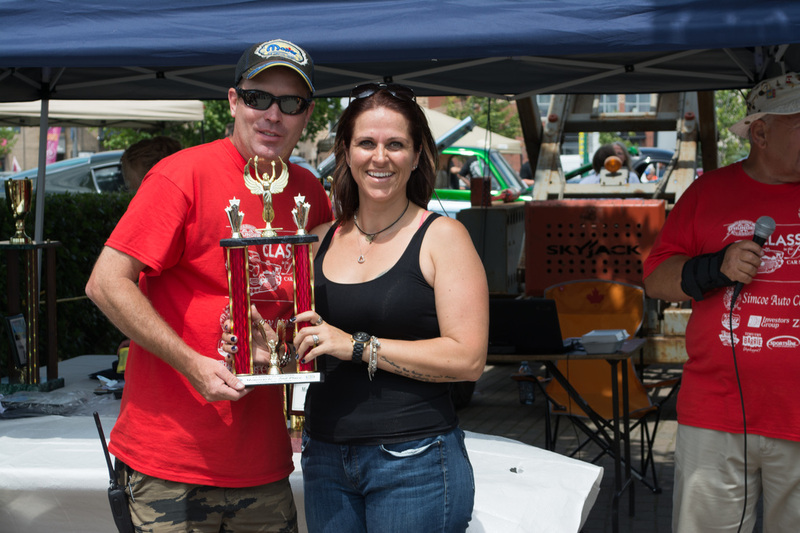 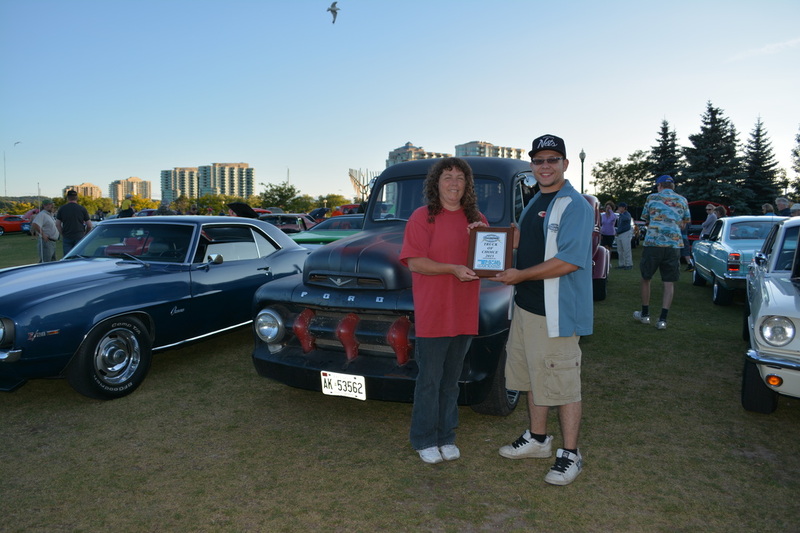 Leighann Miller of HotSpot Auto Parts presents Wayne Scott with a plaque for best truck, a 1975 Chevy C10. 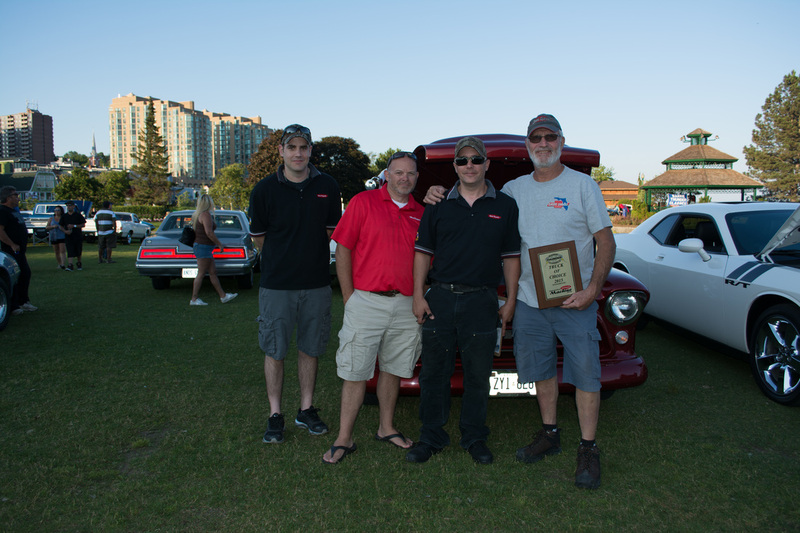 Dave Brown and Jim Ready of the Barrie Thunder Classics CC on behalf of Tom's Car Radio presents Dallas and Ron Semkins with a plaque for best car, a 1957 Chevy Nomad Belair Station Wagon. 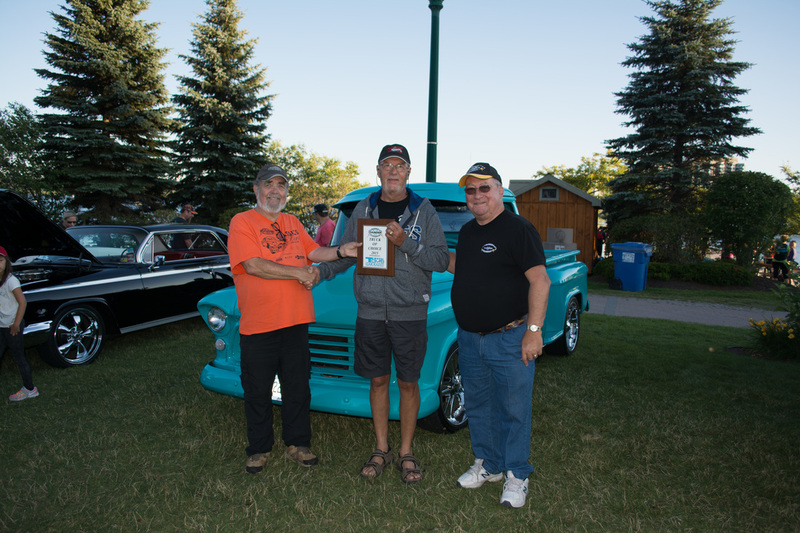 Dave Brown and Jim Ready of the Barrie Thunder Classics CC on behalf of Tom's Car Radio presents Gary Smith with a plaque for best truck, a 1956 Chevy Custom Step-side Pickup Truck. 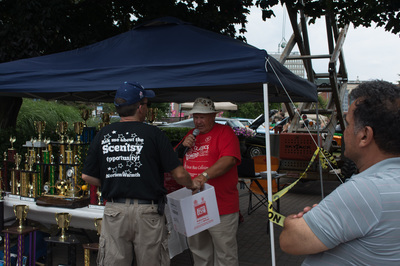 George Neshovski of Wimpy's Diner presents Toy Townsend with a plaque for best car, a 1980 Camaro Z28. 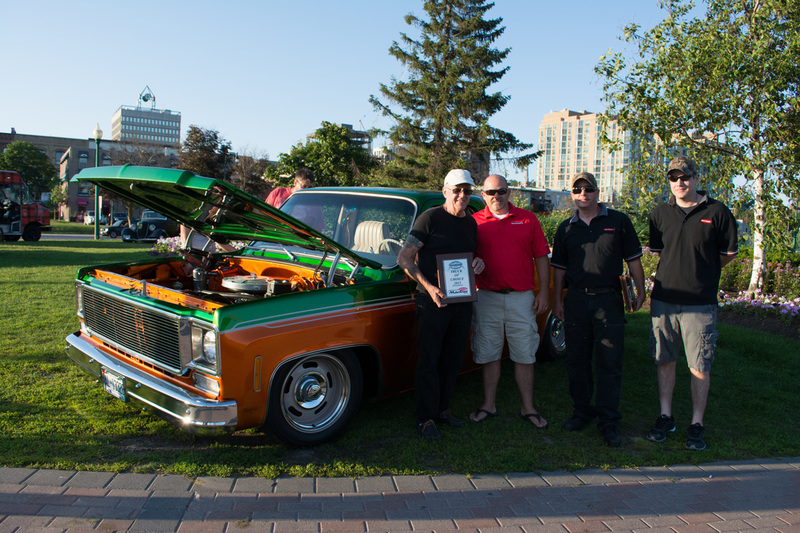 George Neshovski of Wimpy's Diner presents Doug Campbell with a plaque for best truck, a 1976 Silverado Sport. 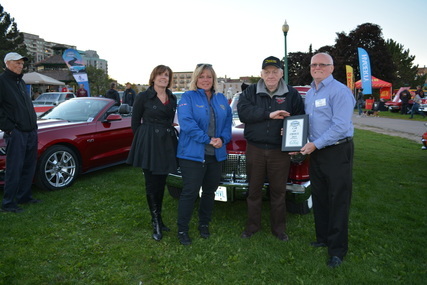 Al Forget and Warren Fisher of Ideal Supply presents Doug Jones with a plaque for best car, a 1965 Ford Mustang. 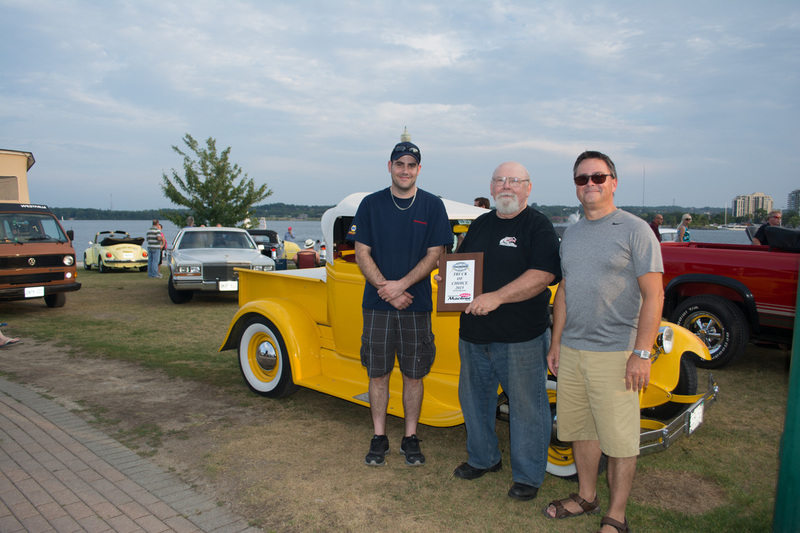 Al Forget and Warren Fisher of Ideal Supply presents Brian with a plaque for best car, a 1931 Ford Roadster Pickup. 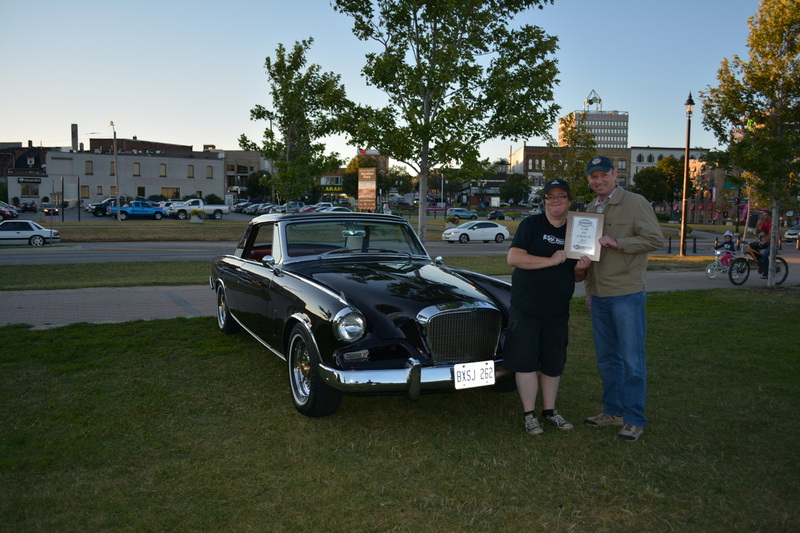 Michelle Caron of Part Source presents Kevin Davis with a plaque for best car, a 1962 Studebaker Hawk Gt. 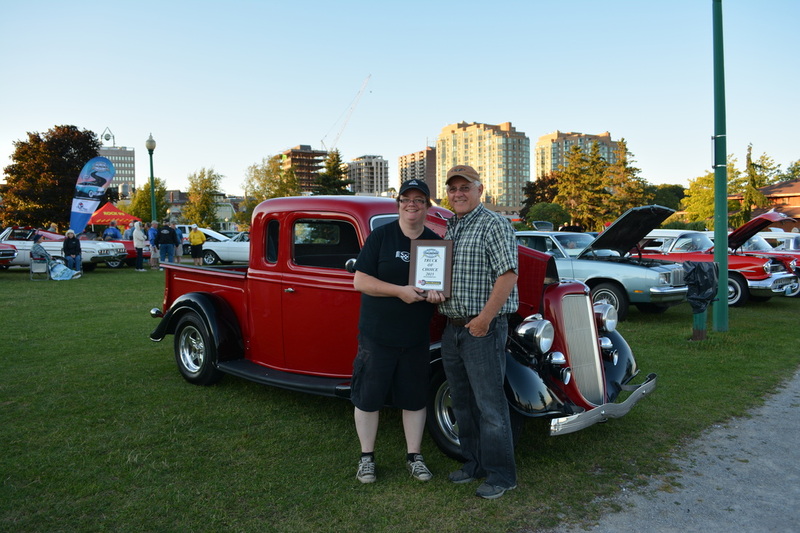 Michelle Caron of Part Source presents Mike Kenney with a plaque for best truck, a 1935 Ford Extended Cab Custom Pick-up. 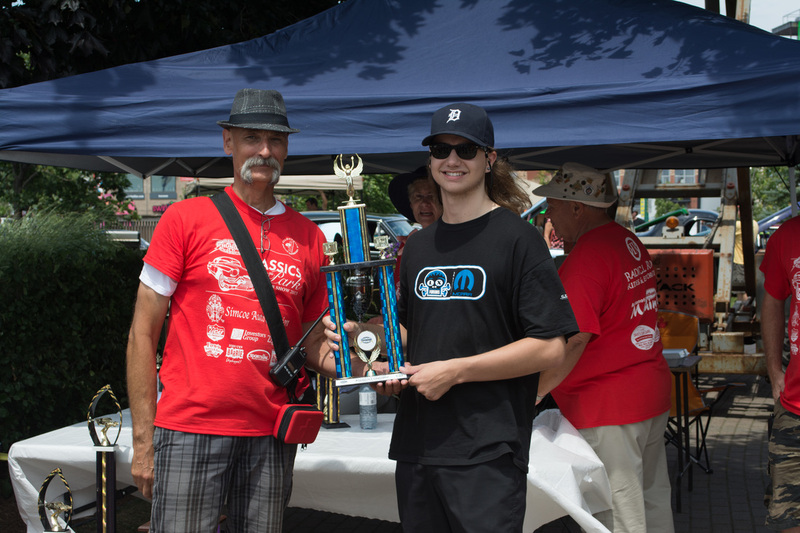 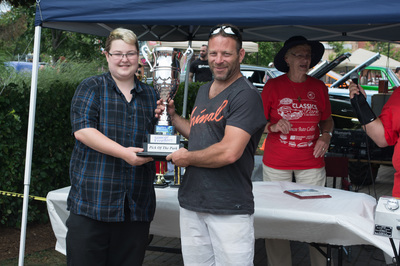 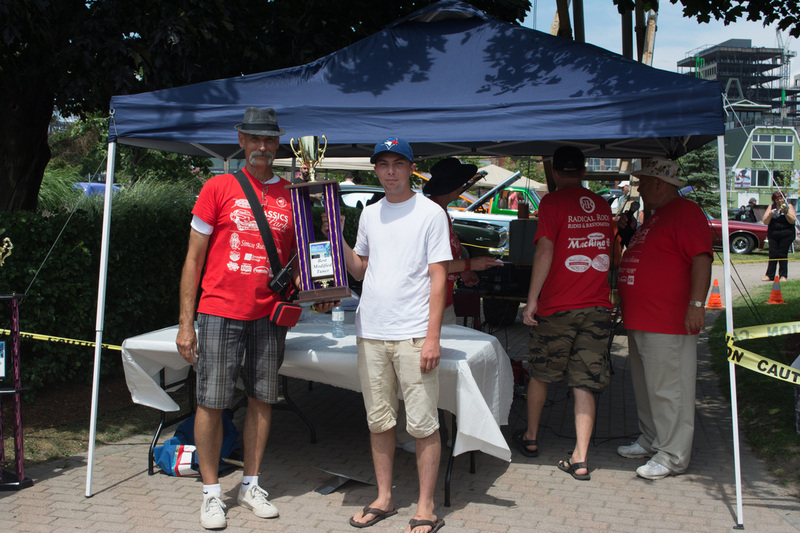 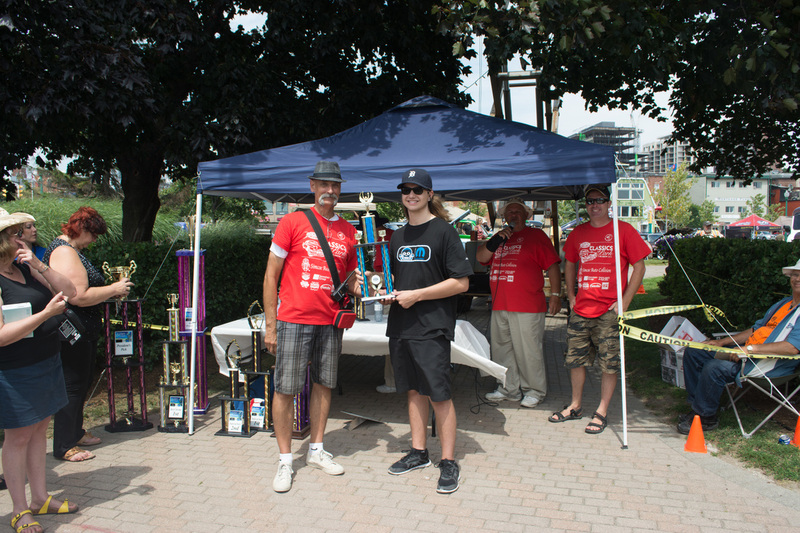 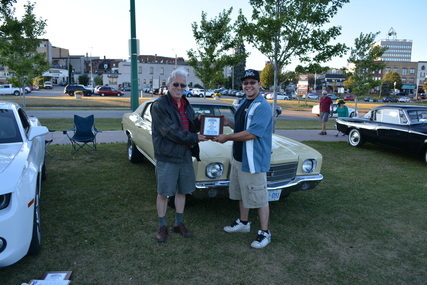 Andrew Camp of the Barrie Thunder Classics CC on behalf of Tom's Car Radio presents Bryan Leighton with a plaque for best car, a 1970 Chevy Mote Carlo. 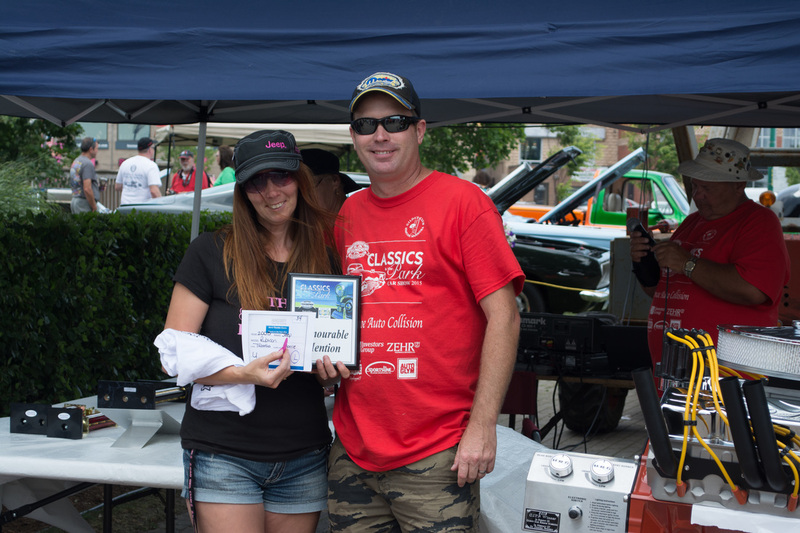 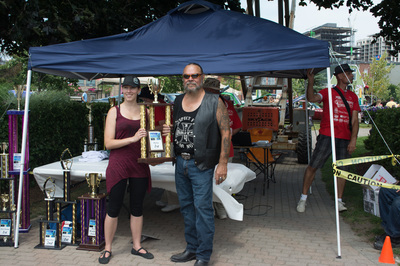 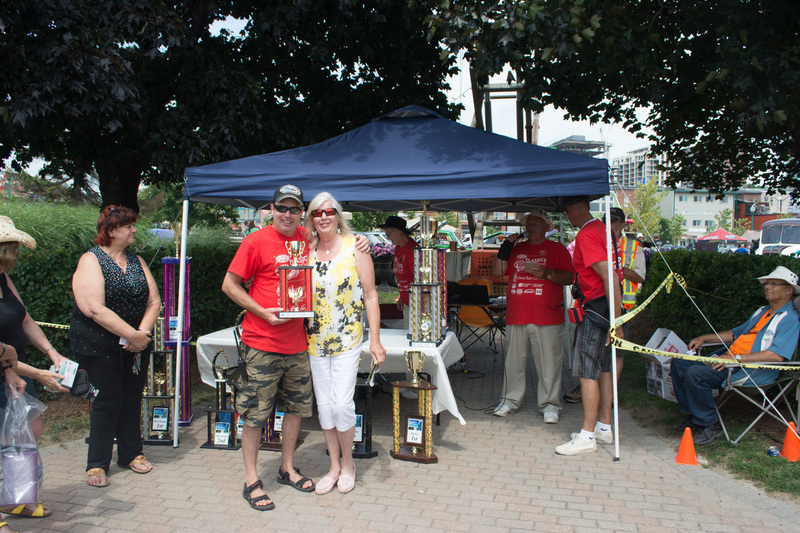 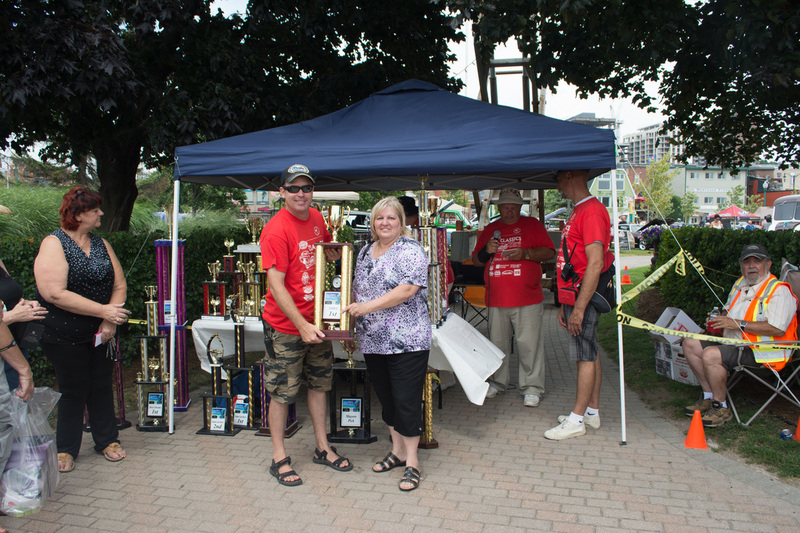 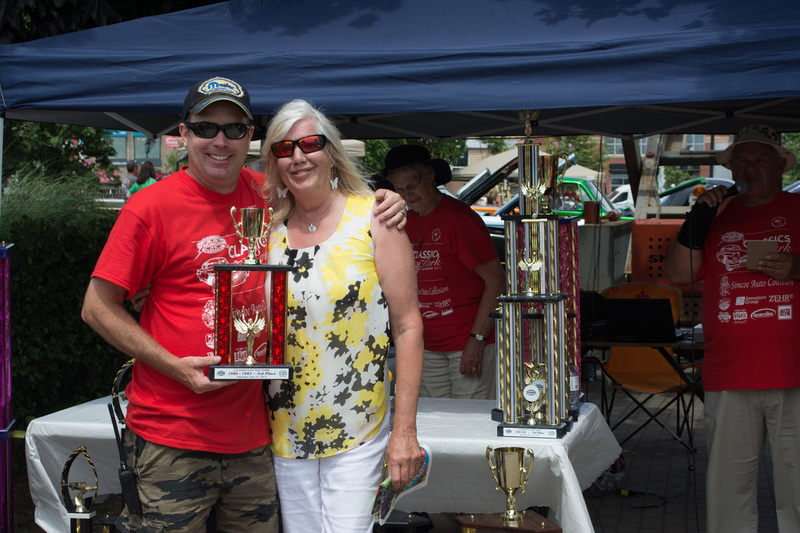 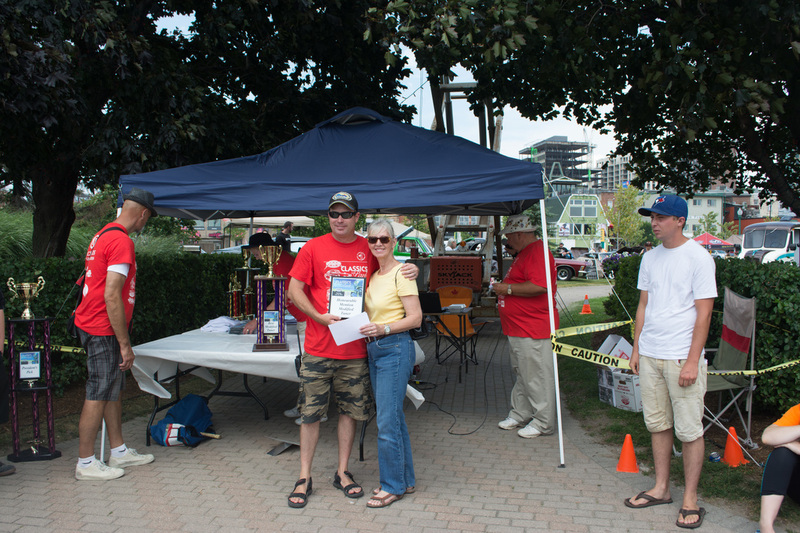 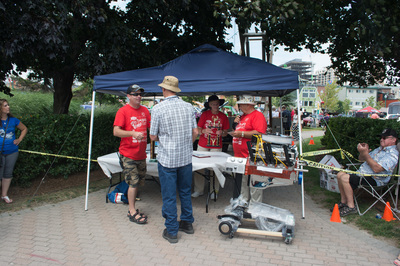 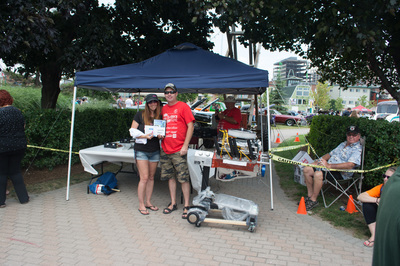 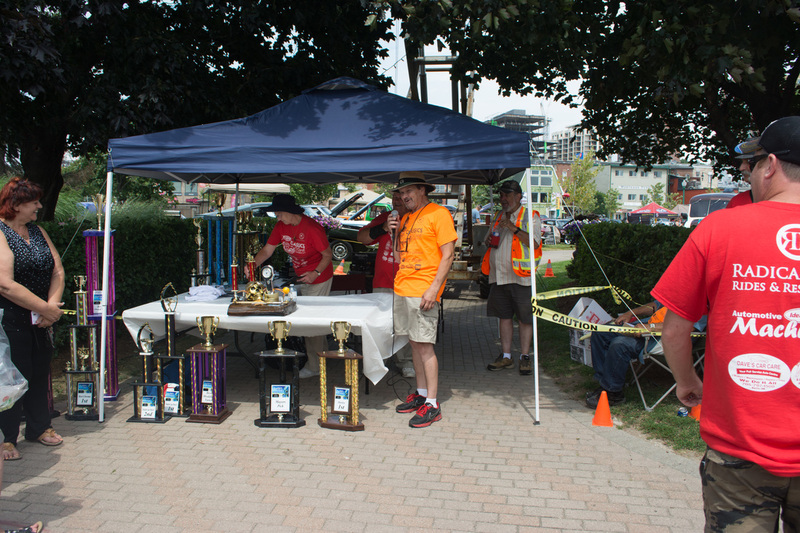 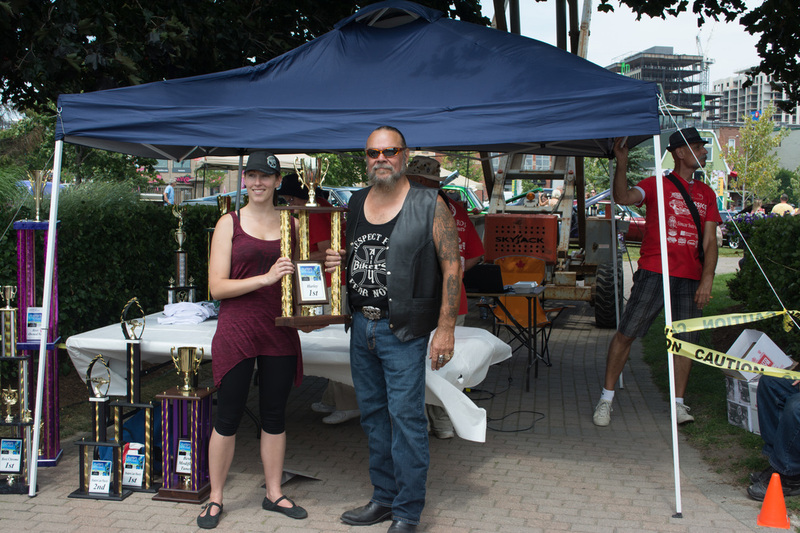 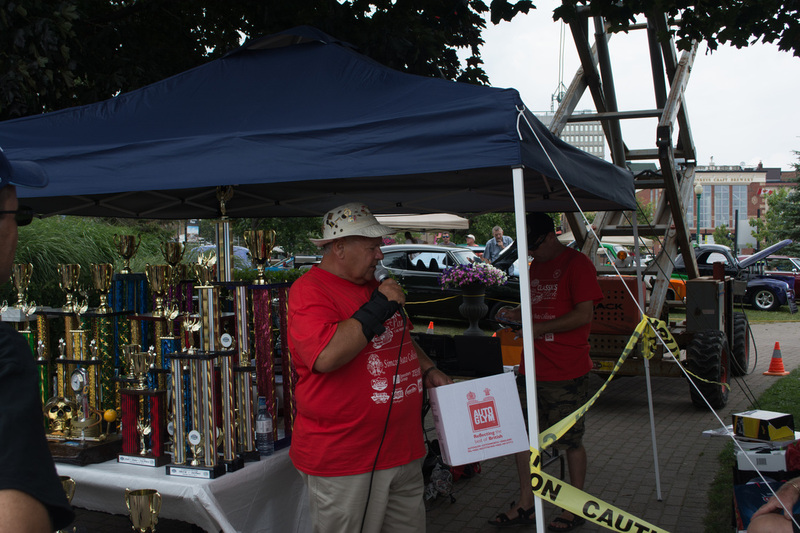 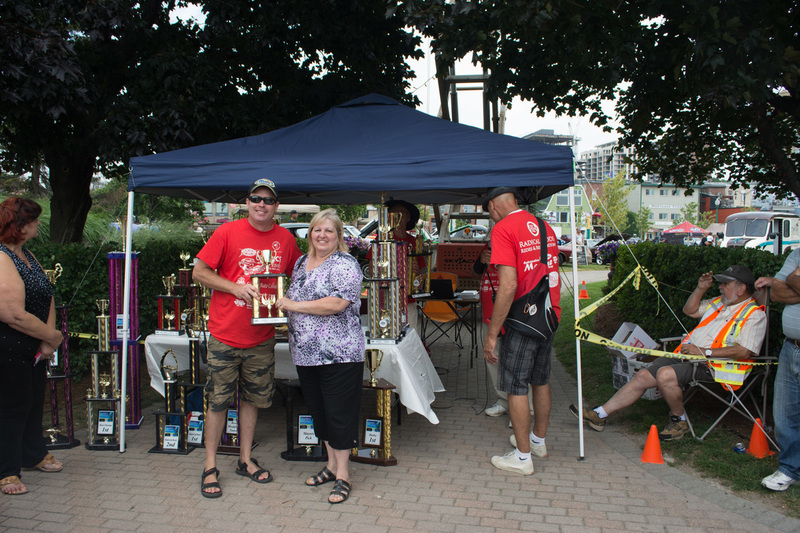 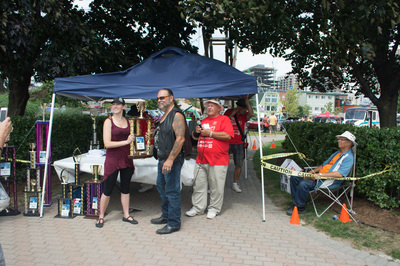 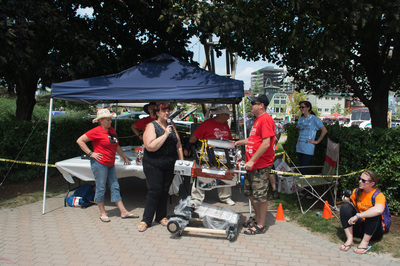 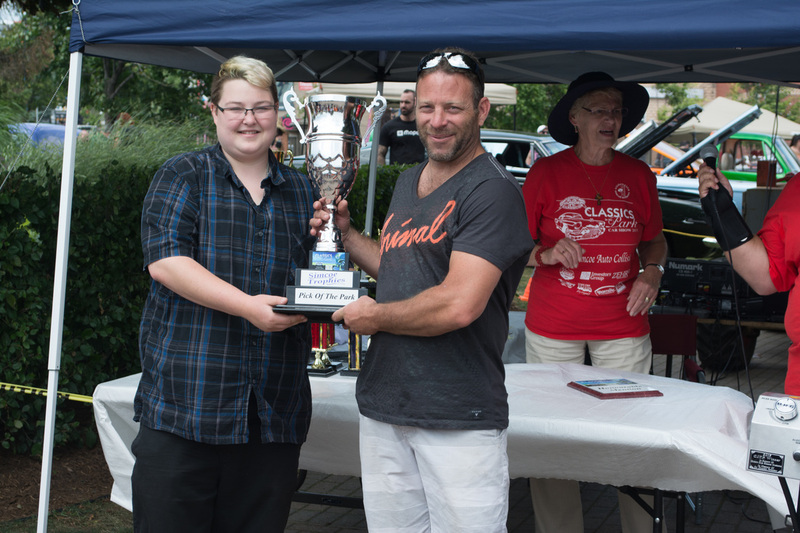 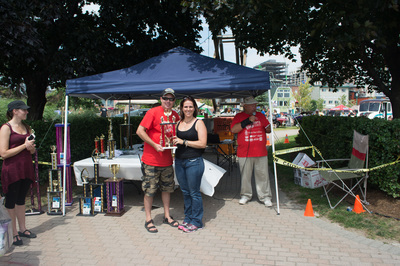 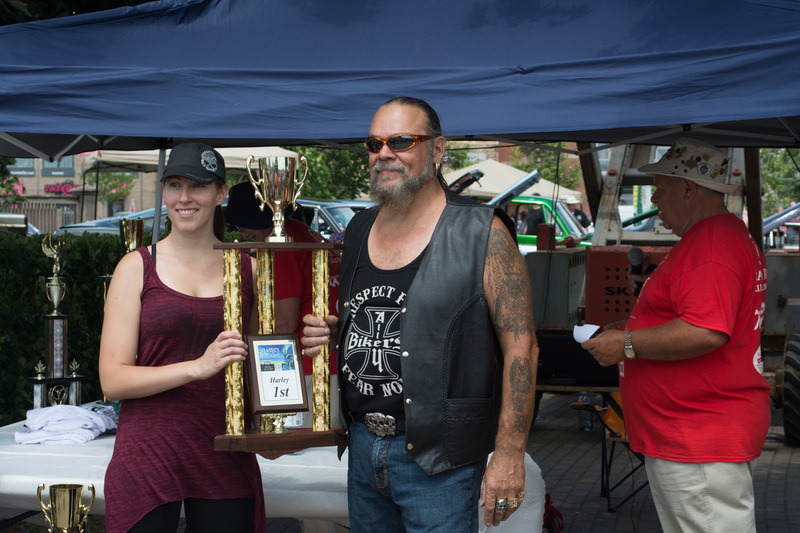 Andrew Camp of the Barrie Thunder Classics CC on behalf of Tom's Car Radio presents Laura Czovek with a plaque for best truck, a 1952 Ford F3. 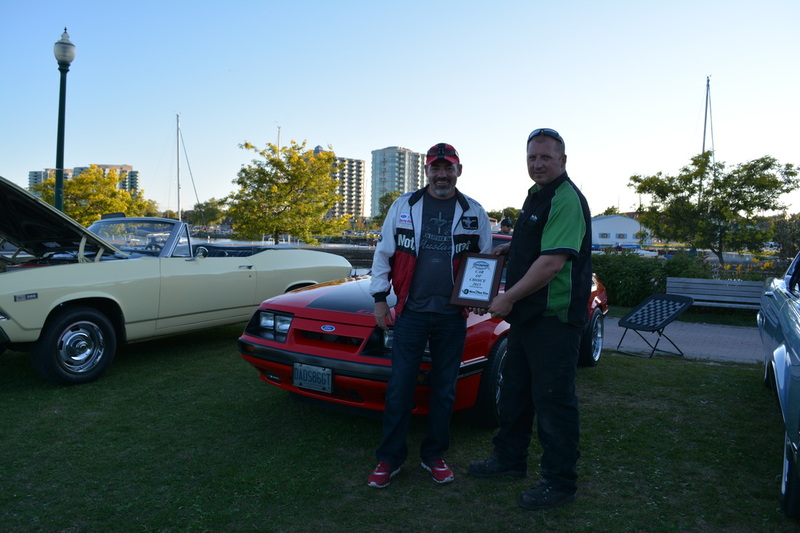 Roger Gale of New 2 You Tire presents Jim Thomas with a plaque for best car, a 1986 Ford Mustang GT. 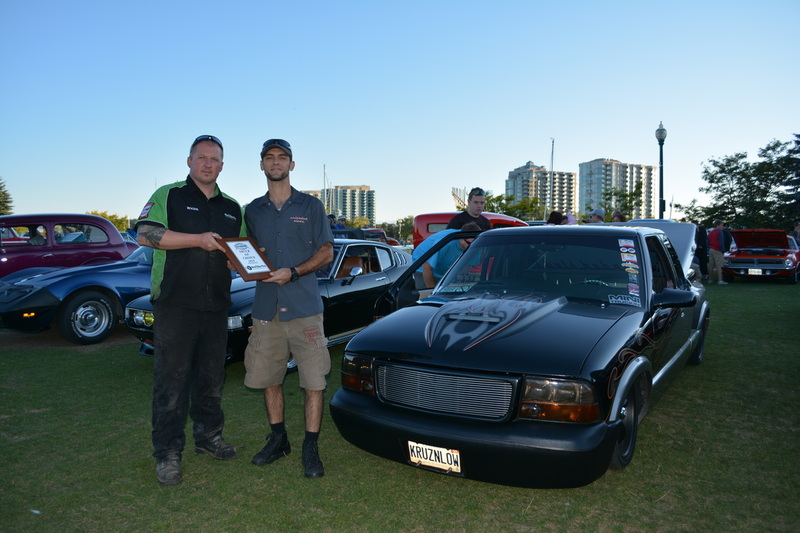 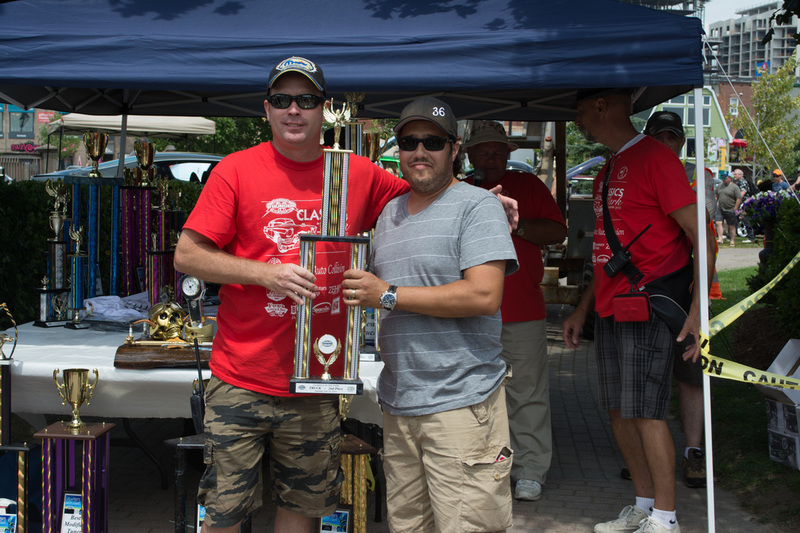 Roger Gale of New 2 You Tire presents Lee Custodio with a plaque for best truck, a 2002 GMC Sonoma Custom. 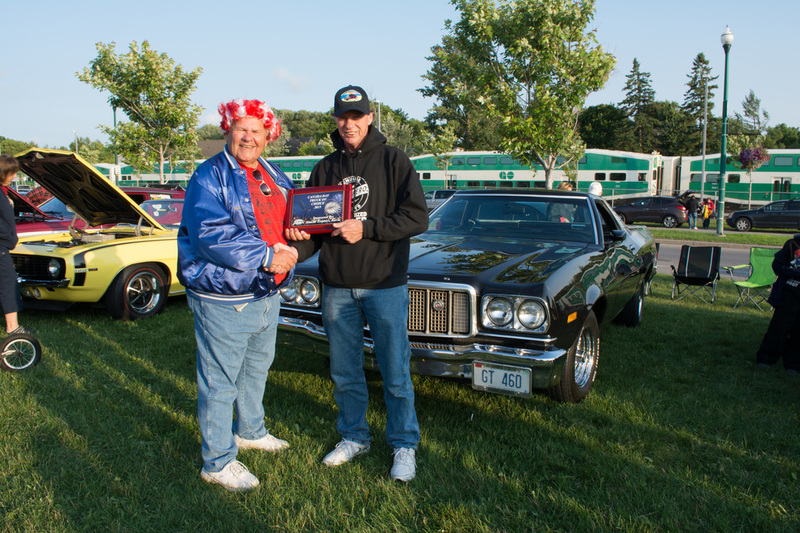 Jim Ready of the Barrie Thunder Classics CC on behalf of HWY 400 Transmission & Driveline Service presents John Csiki with a plaque for best car, a 1956 Lincoln Premiere. 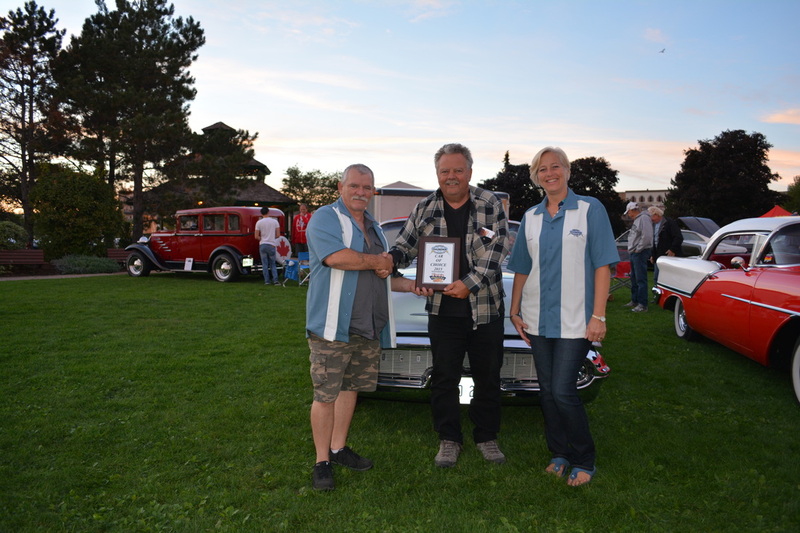 Bob Mackinnon of the Barrie Thunder Classics CC on behalf of HWY 400 Transmission & Driveline Service presents Kim Millsop and Steve Gillies with a plaque for best truck, a 1956 Chevy pickup. 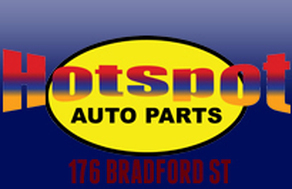 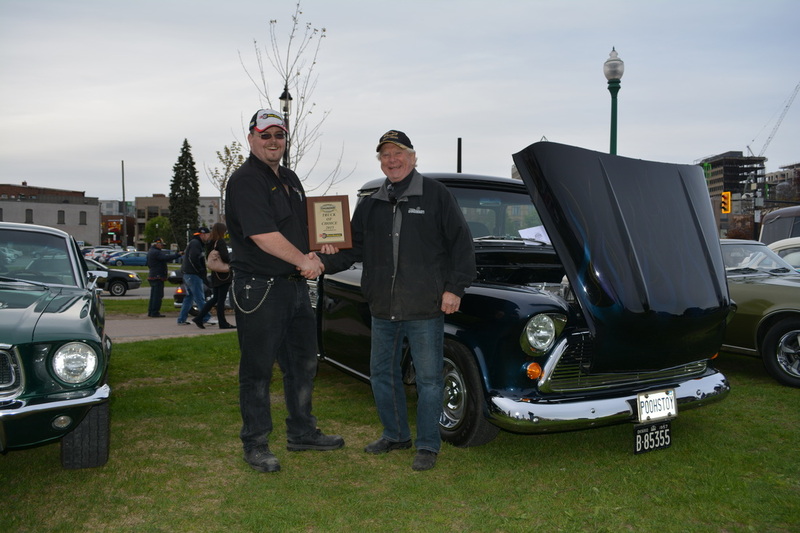 Darryl Stephenson of TSS Top Shops presents Jim Hurle with a plaque for best car, a 1957 Olds 98. 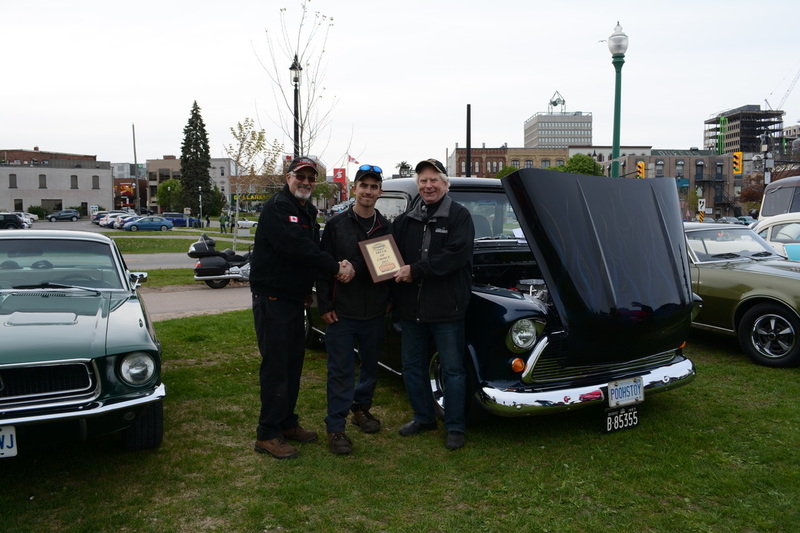 Darryl Stephenson of TSS Top Shops presents Mike Jesse with a plaque for best truck, a 1950 Mercury M100. 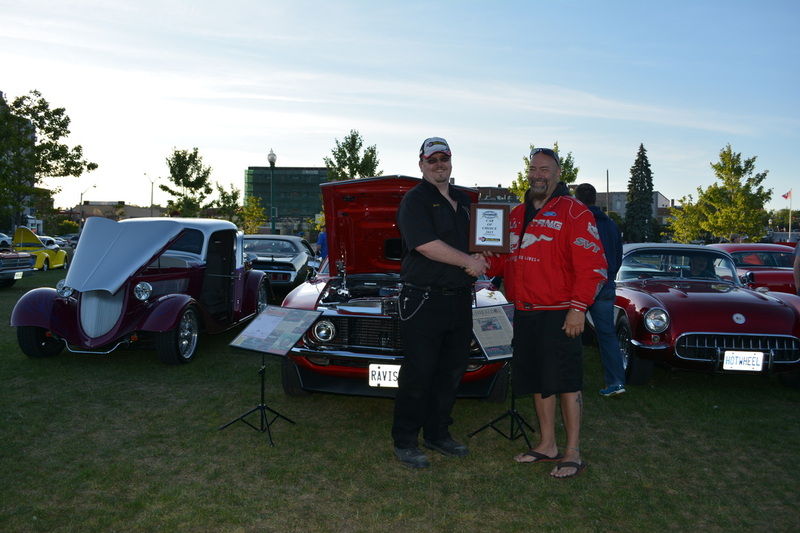 Brandon Valley of the Barrie Thunder Classics CC on behalf of ORV Auto Accessories and Signs presents Mike Jones with a plaque for best car, a 1965 Factory Five Daytona. 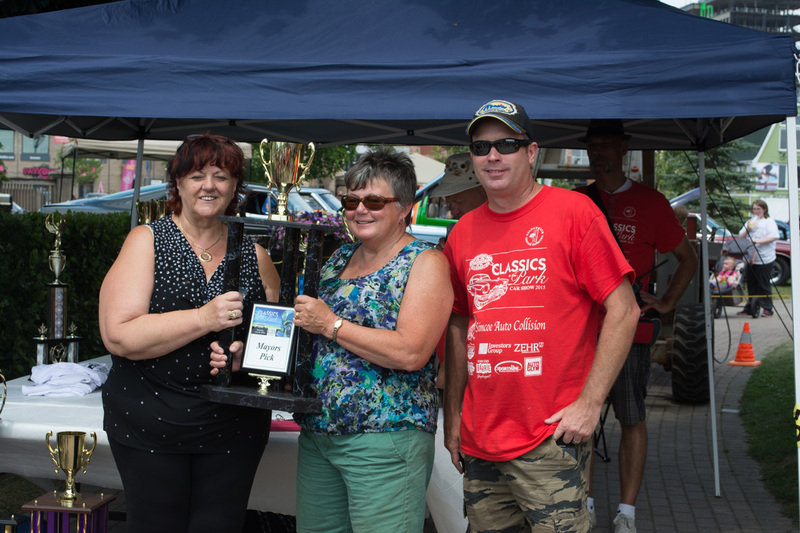 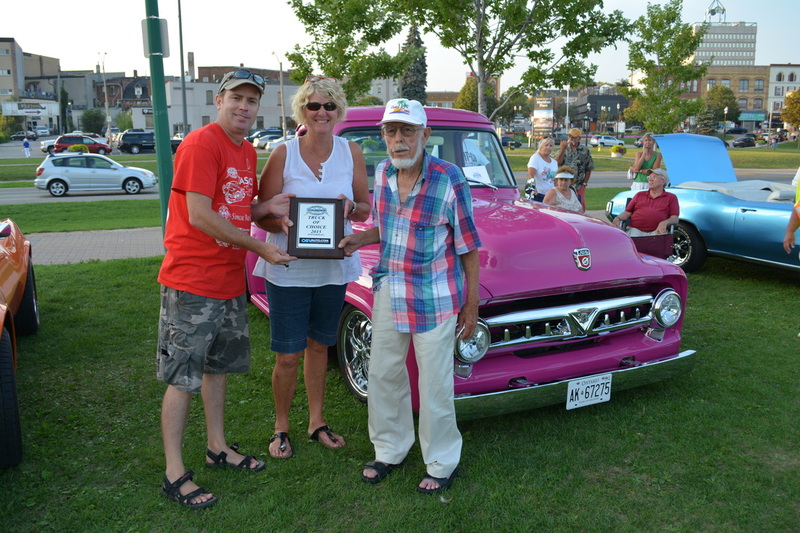 Brandon Valley of the Barrie Thunder Classics CC on behalf of ORV Auto Accessories and Signs presents Sue Krentz with a plaque for best truck, a 1953 Ford F100. 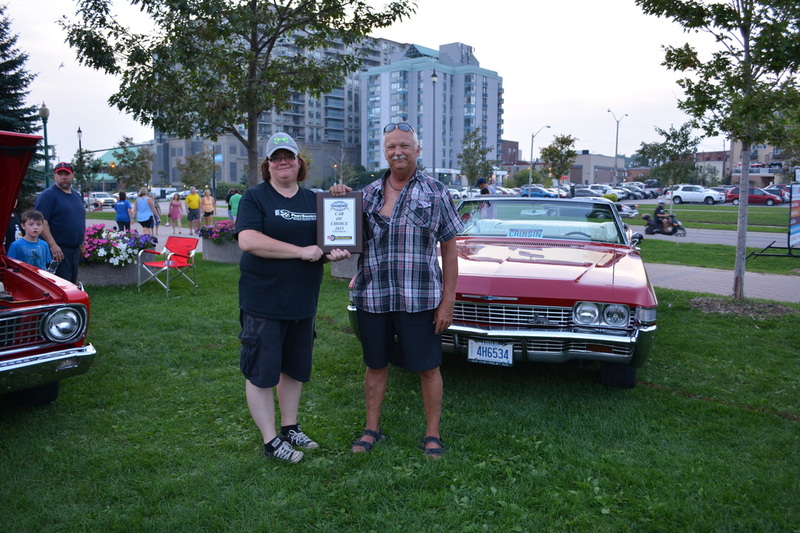 Michelle Caron of Part Source presents Jake Baker with a plaque for best car, a 1968 Chevy Impala SS. 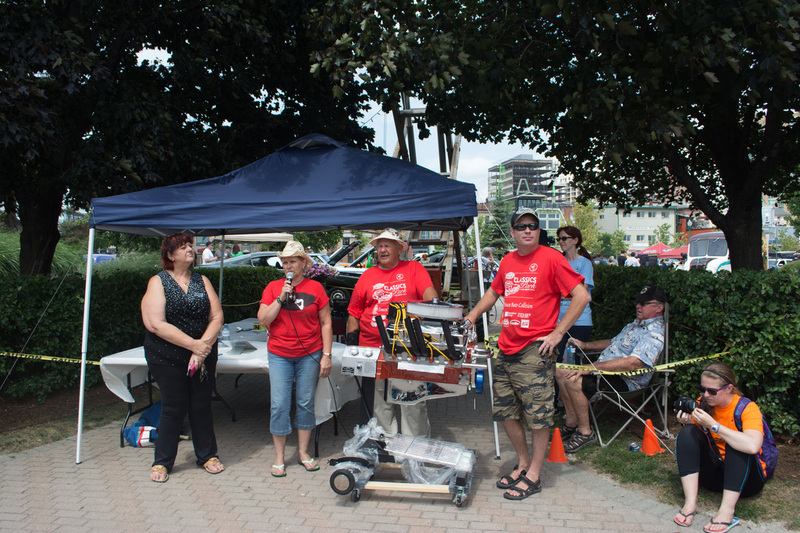 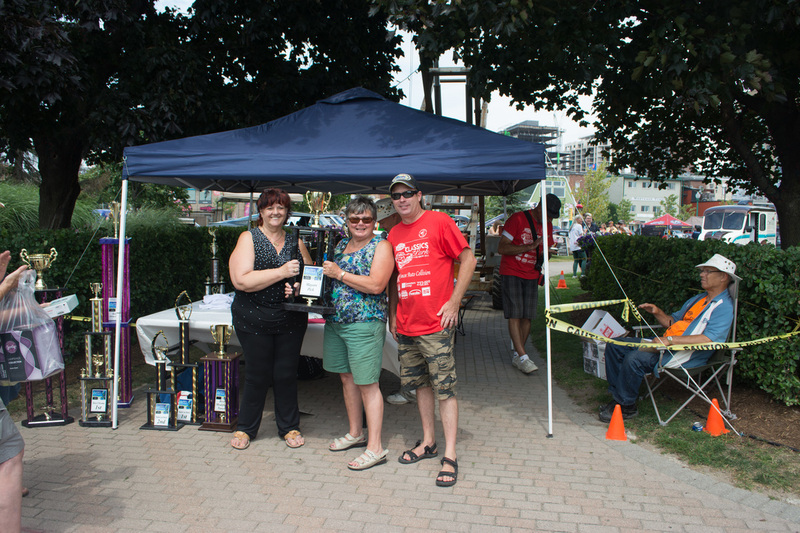 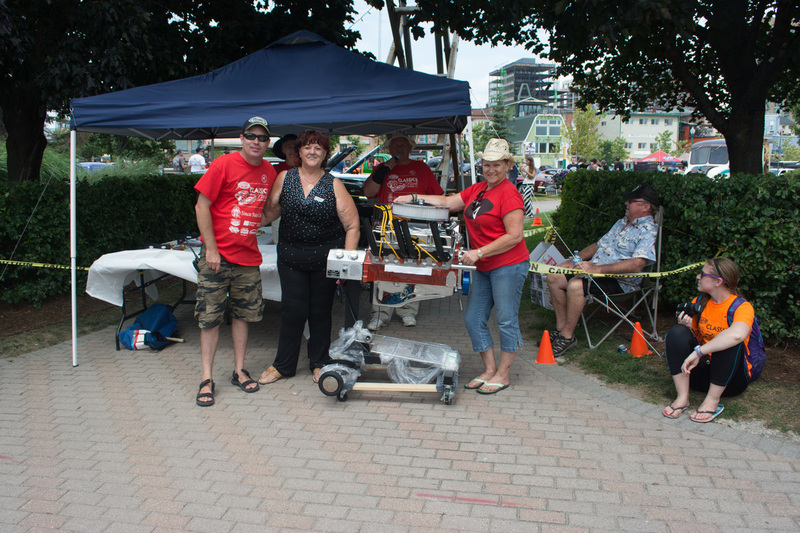 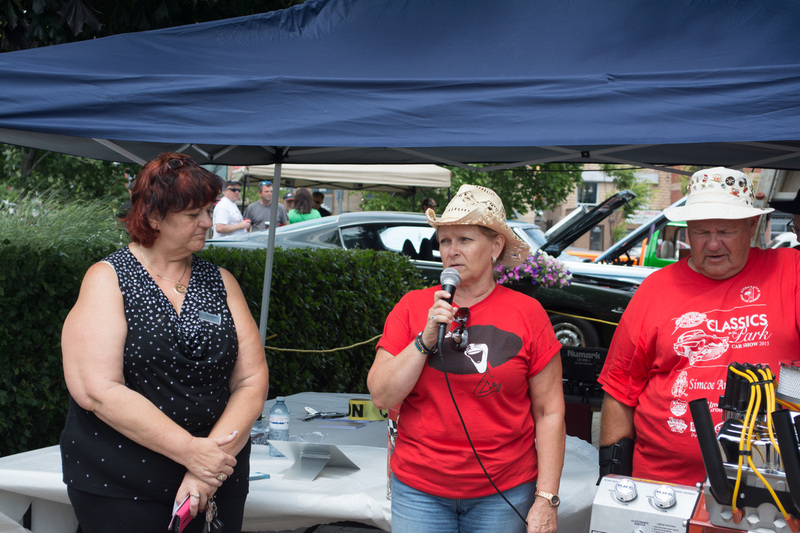 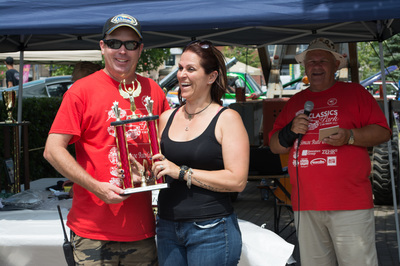 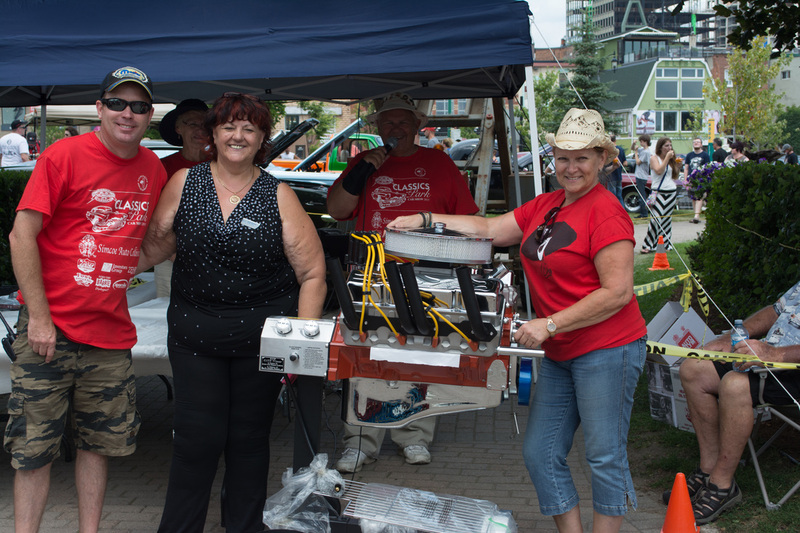 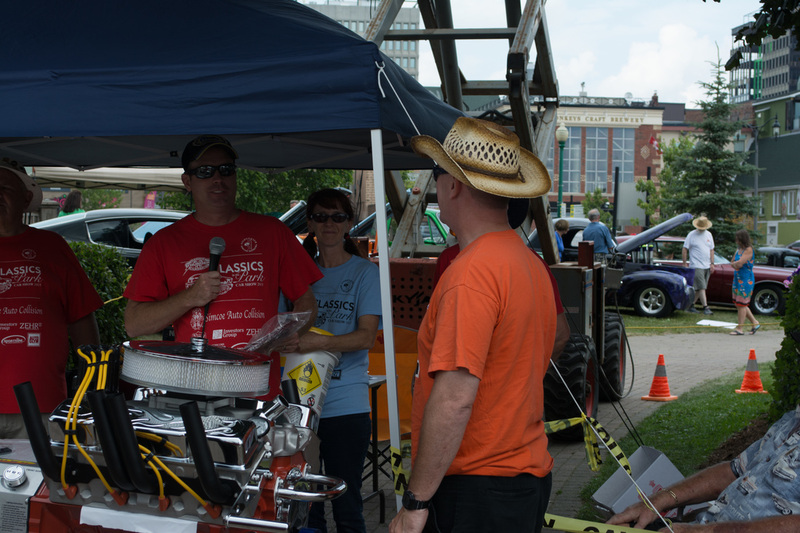 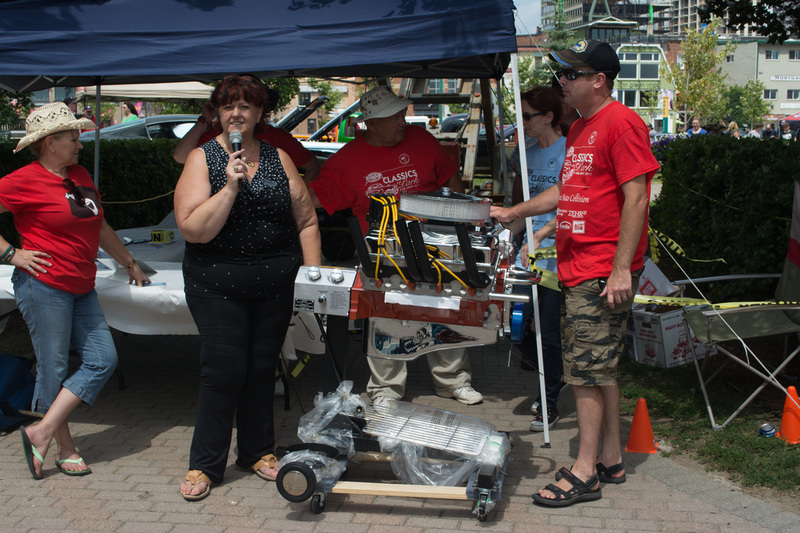 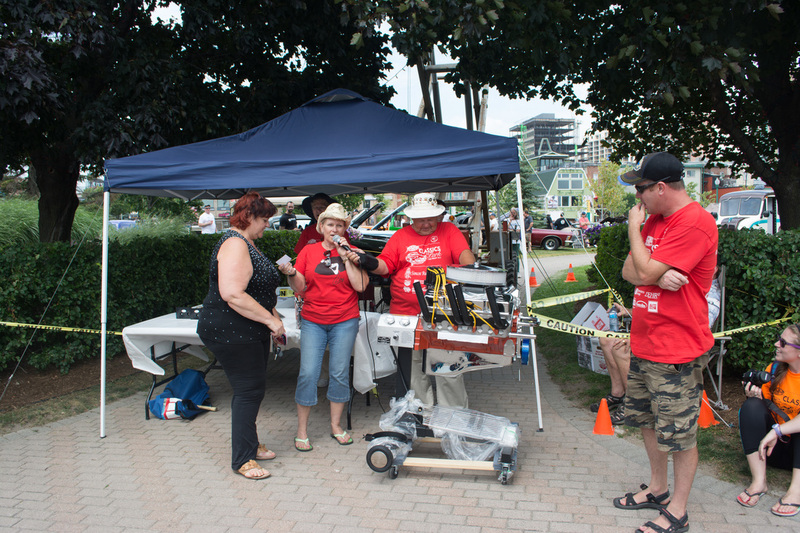 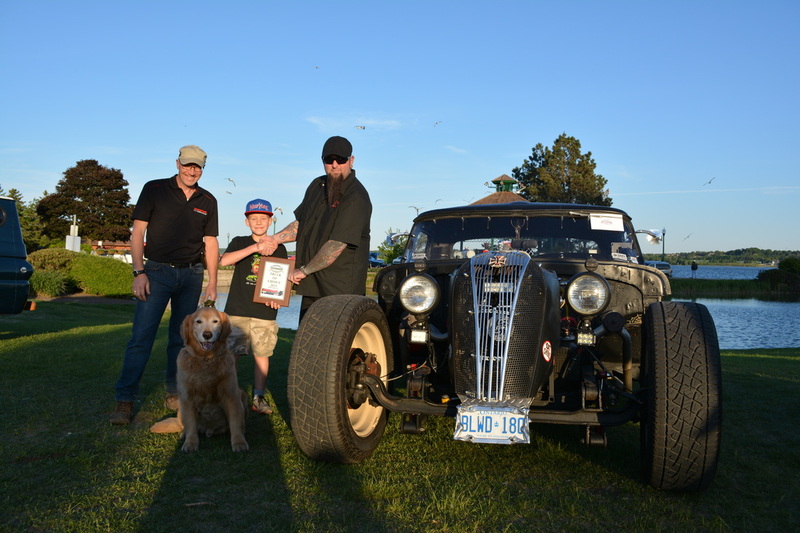 Michelle Caron of Part Source presents Mercedes & Jay Ormerod with a plaque for best truck, a 1928 Ford Roadster. 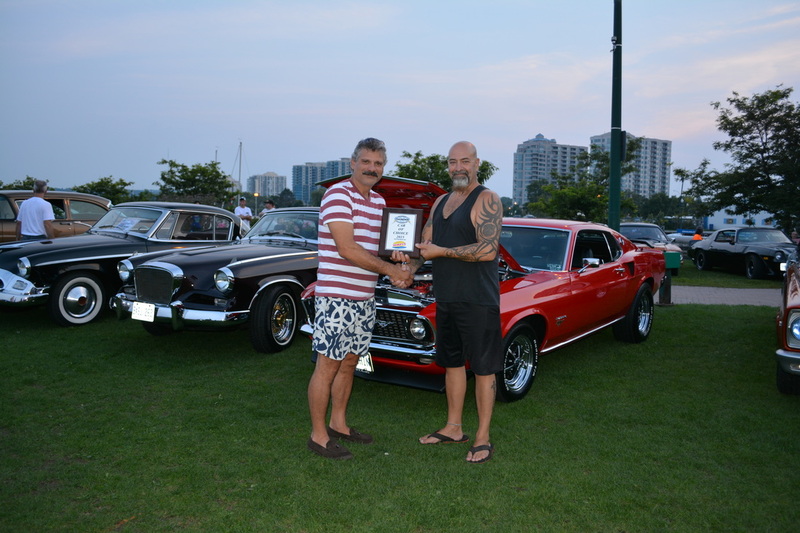 George Neshovski of Wimpy's Diner presents Greg Marinoff with a plaque for best car, a 1969 Ford Mustang. 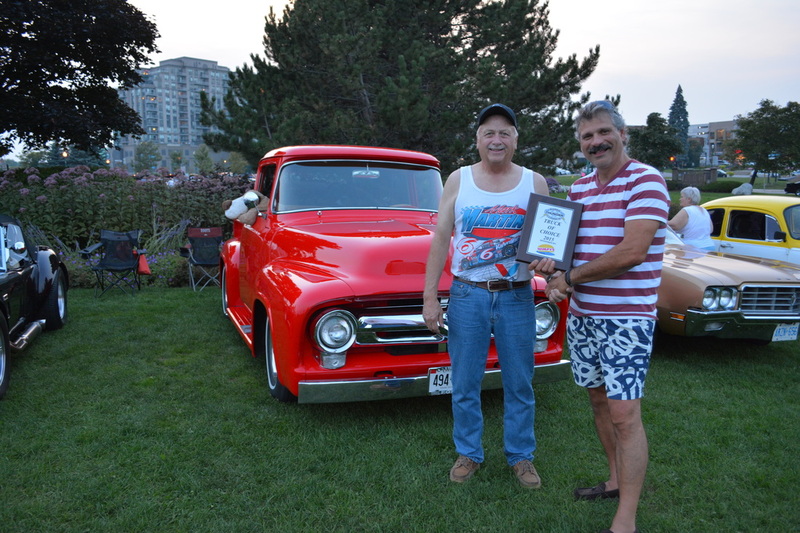 George Neshovski of Wimpy's Diner presents Jim Hord with a plaque for best truck, a 1956 Ford Pickup. 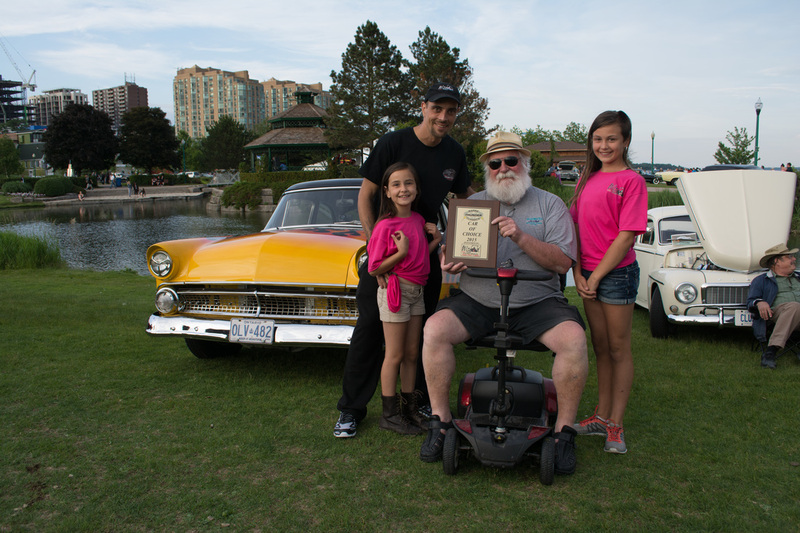 Chaenne and Danica of Hooters Barrie presents Don Gordon with a plaque for best car, a 1957 Ford Gasser. 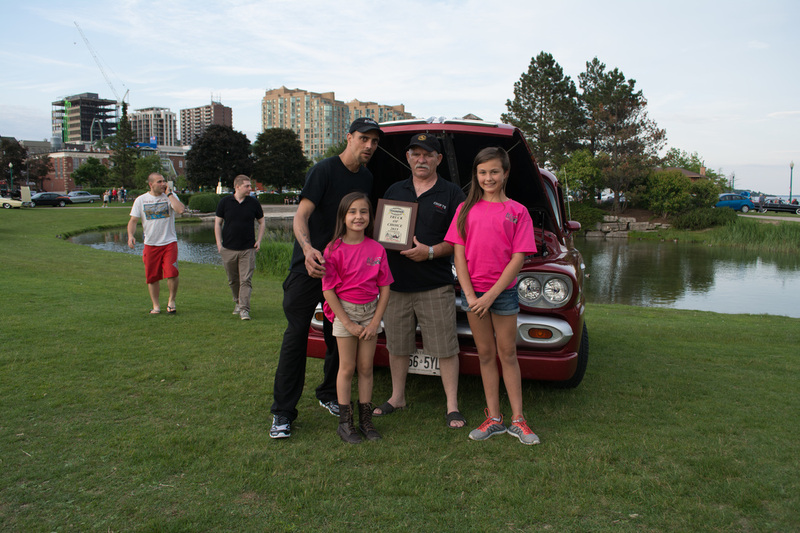 Chaenne and Danica of Hooters Barrie presents Dan Wetmore with a plaque for best truck, a 1979 Dodge Little Red Express. 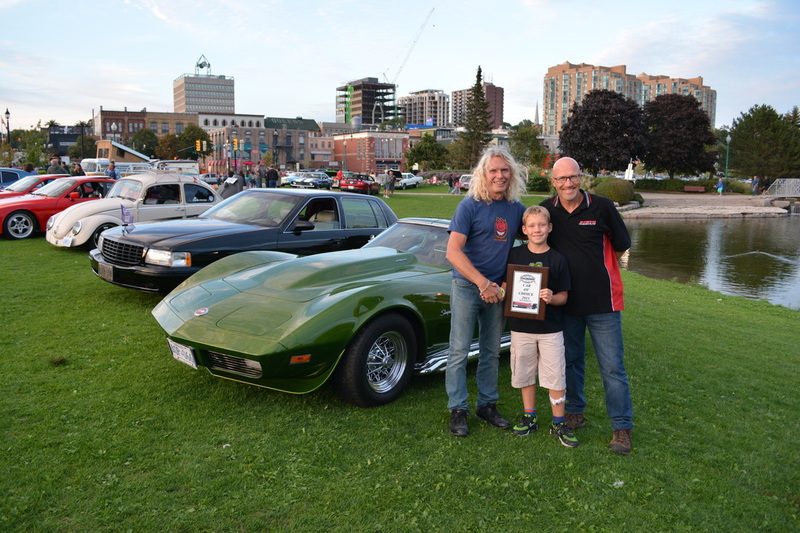 Greg and Jake of Superior Tire & Auto Presents Glen Upton with a plaque for best car, a 1973 Corvette 454 Stingray . 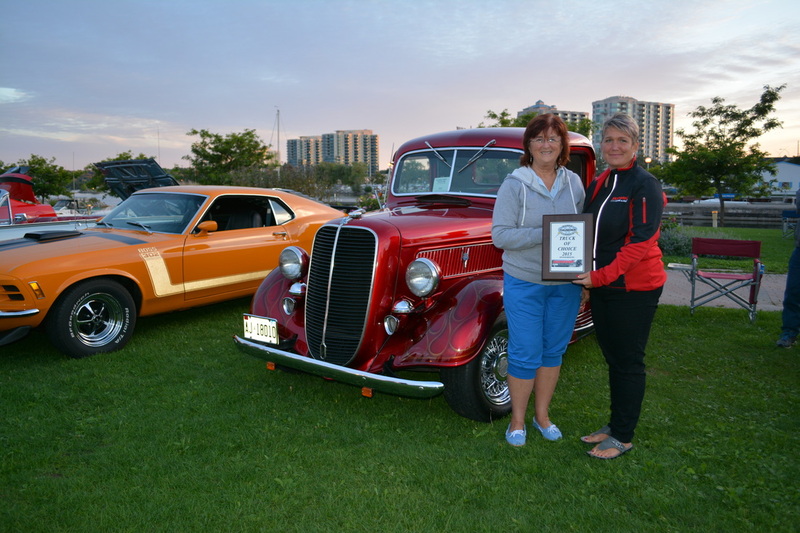 Chantelle of Superior Tire & Auto Presents Judy Gallant with a plaque for best truck, a 1937 Ford Pickup. 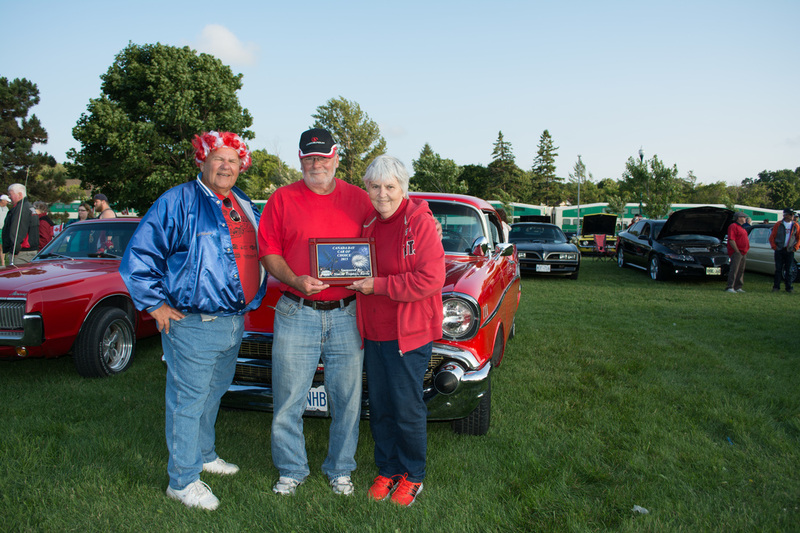 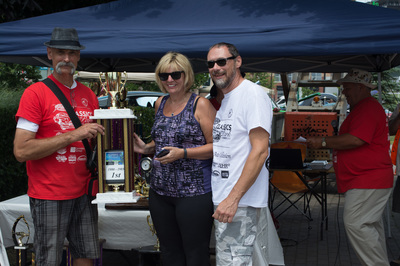 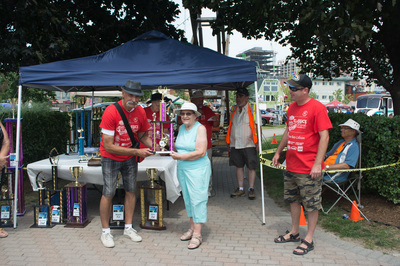 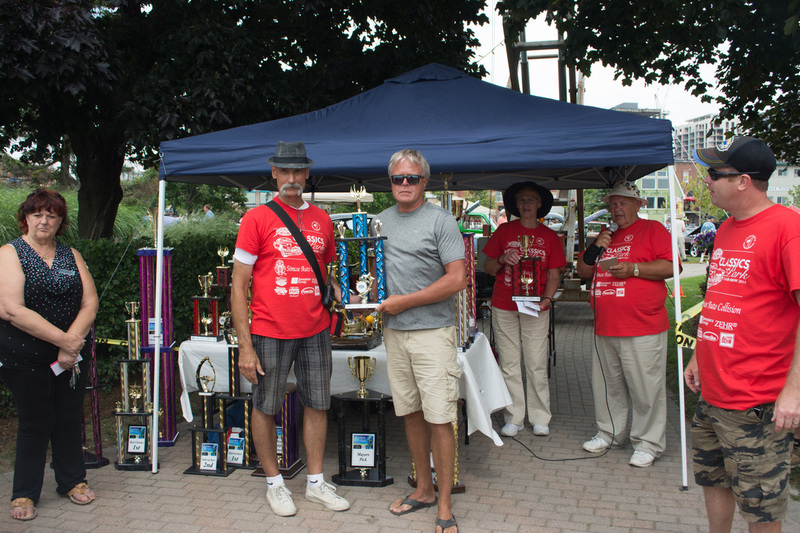 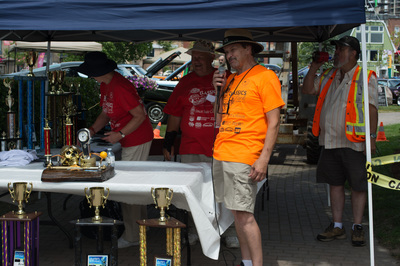 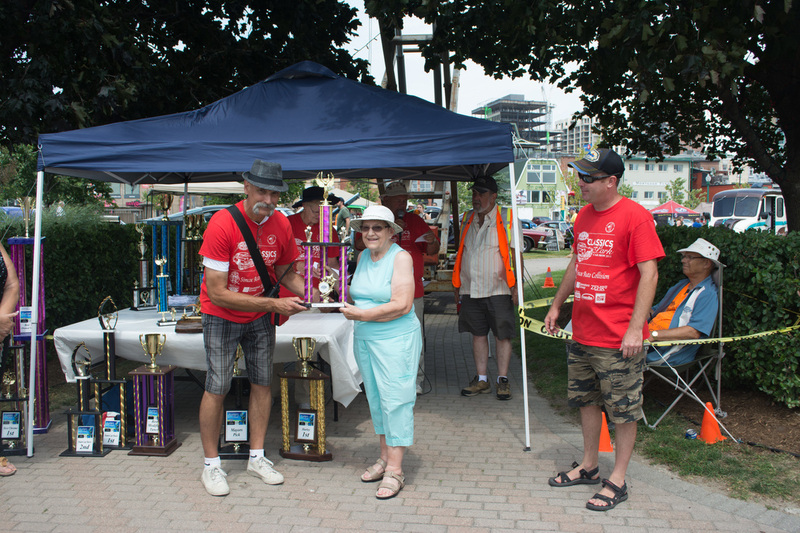 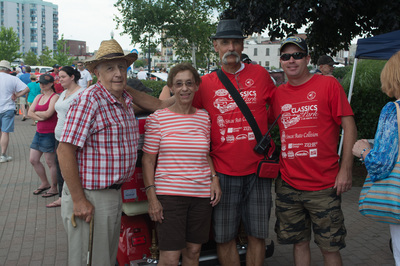 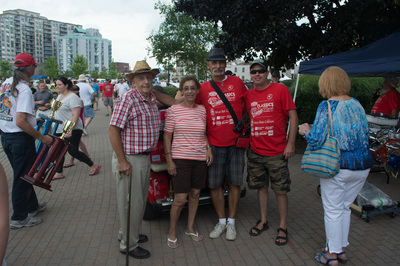 Jim & Teresa Croft of the Barrie Thunder Classics CC on behalf of Steve Fox of Fox's Bakery and Deli presents Jim Hurlburt with a plaque for best car, a 1957 Oldsmobile Super 88. 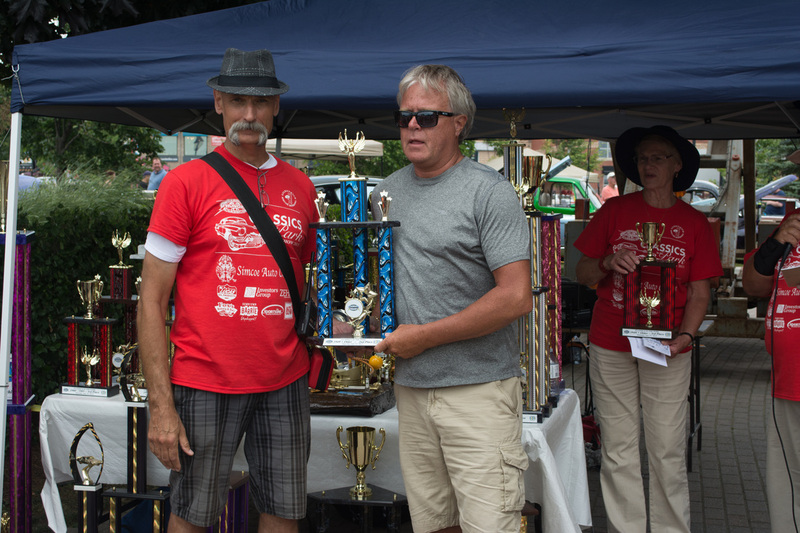 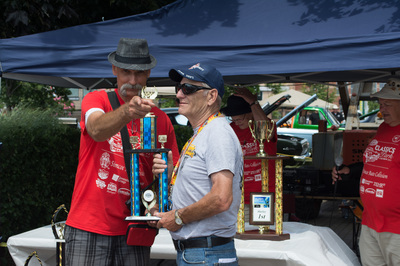 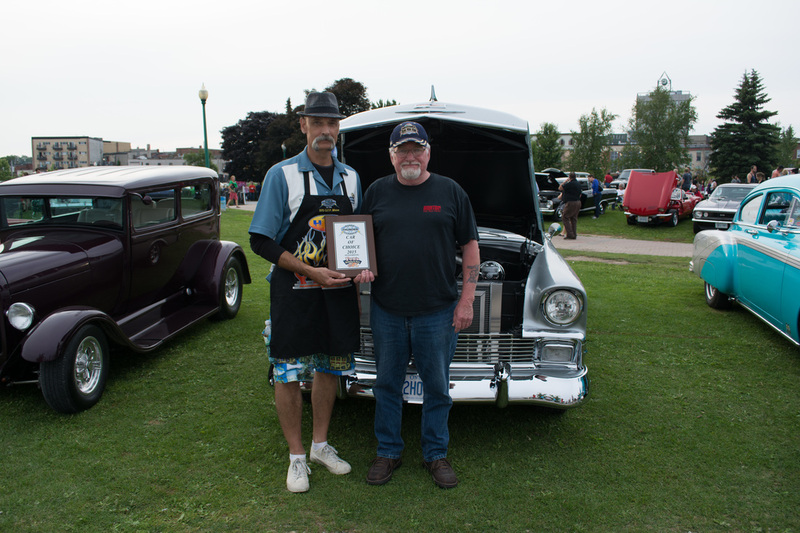 Mario Horwood of the Barrie Thunder Classics CC on behalf of Steve Fox of Fox's Bakery and Deli presents Eric Kennedy with a plaque for best truck, a 1957 Chevy Cameo. 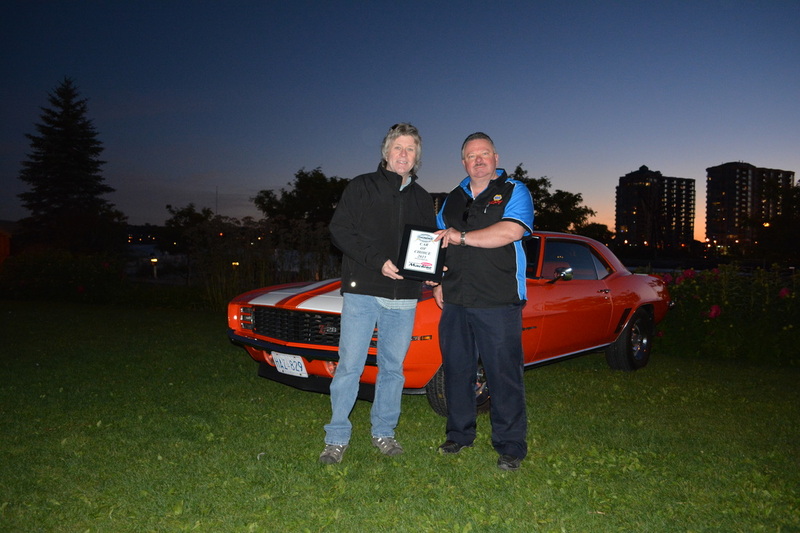 Dave McFarland of Performance Improvements presents Quinn Clancy with a plaque for best car, a 1973 Chevy Camaro. 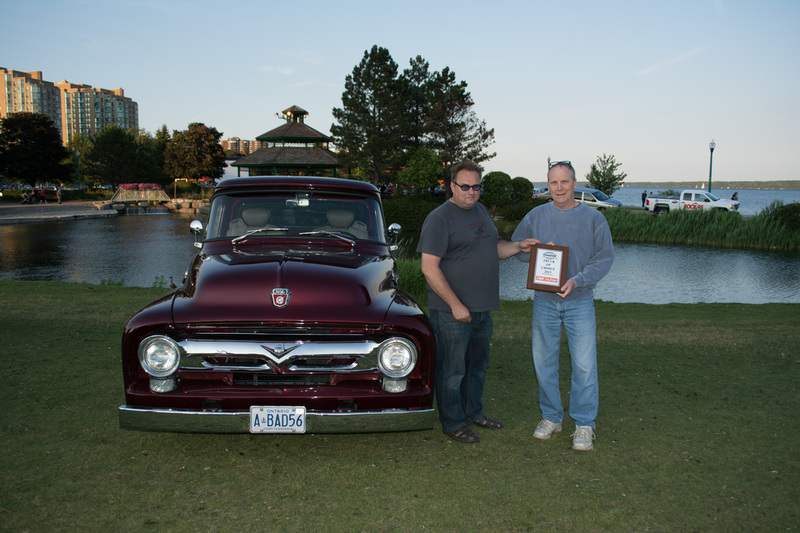 Dave McFarland of Performance Improvements presents Mike Bodkin with a plaque for best truck, a 1947 Chevy C3100 Custom. 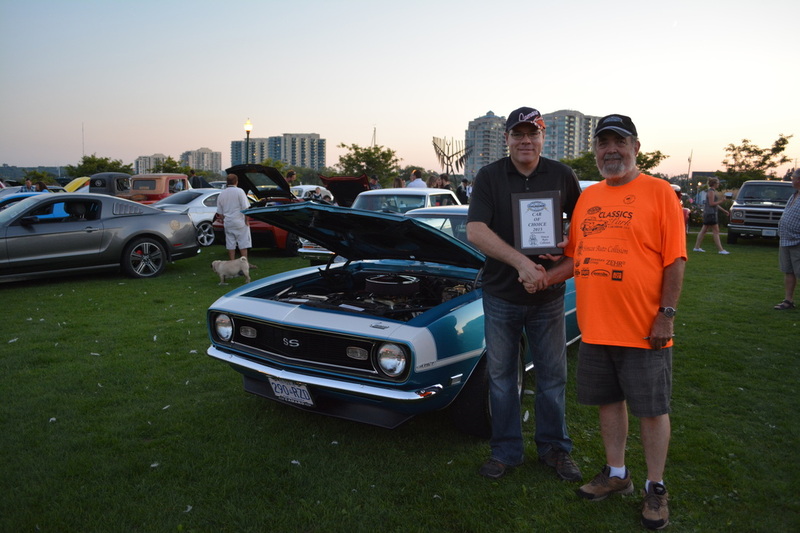 Jim Ready of the Barrie Thunder Classics CC on behalf of Simcoe Auto Collision Centre presents Mike Morrison with a plaque for best car, a 1968 Chevy Camaro SS 427. 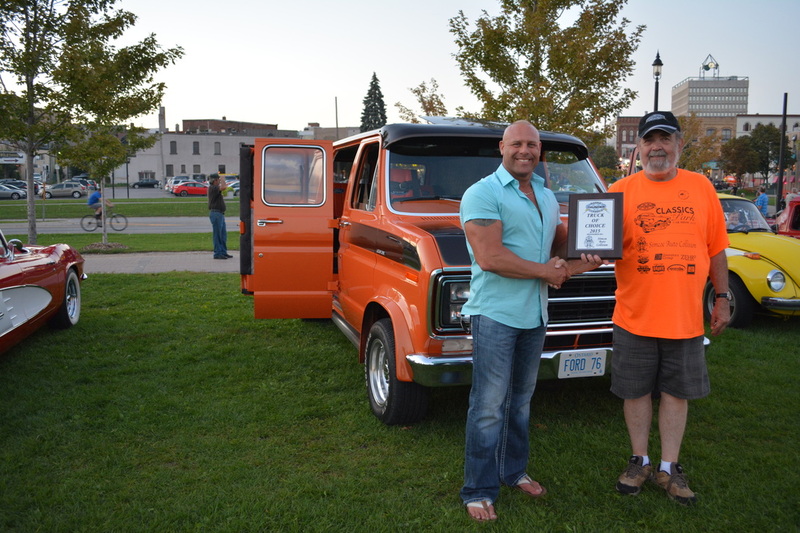 Jim Ready of the Barrie Thunder Classics CC on behalf of Simcoe Auto Collision Centre presents Berny LaCombe with a plaque for best truck, a 1976 Ford Econoline Custom. 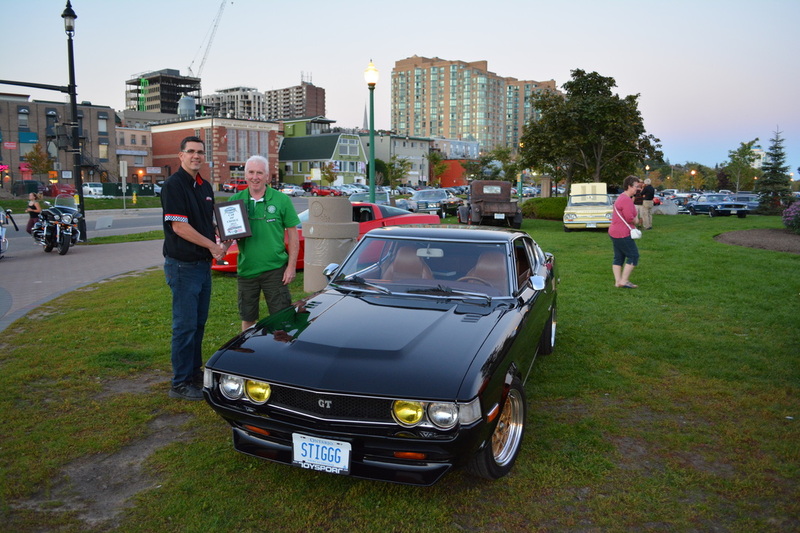 Dave McFarland of Performance Improvements presents Neil Reid with a plaque for best car, a 1977 Toyota Celica. 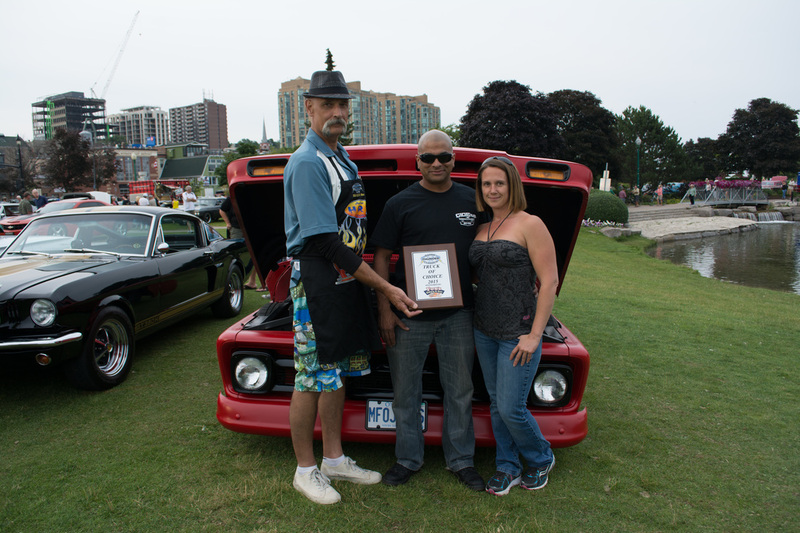 Mario and Sandra of the Barrie Thunder Classics CC on behalf of Simcoe Auto Collision Centre presents Keith and Carol Laycock with a plaque for best car, a 19657 Mercury Turnpike Cruiser. Dave McFarland of Performance Improvements presents Sean Fairbairn with a plaque for best truck, a 1930 Ford Model A.
Mario and Sandra of the Barrie Thunder Classics CC on behalf of Simcoe Auto Collision Centre presents Wayne Scott with a plaque for best truck, a 1975 GMC Custom Pickup. 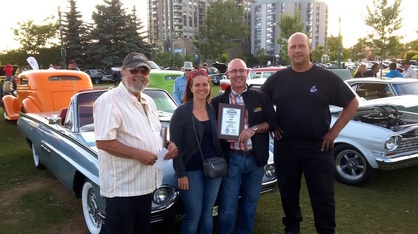 September 30th Cruise Night Sponsor Awards "Season Finale"
Colleen Dinan and Jeff Mitchell of StoneRidge Insurance Brokers and Michelle Henderson of Hagerty Classic Car Insurance presents John Chiki with a plaque for best car, a 1957 Continental MKII. 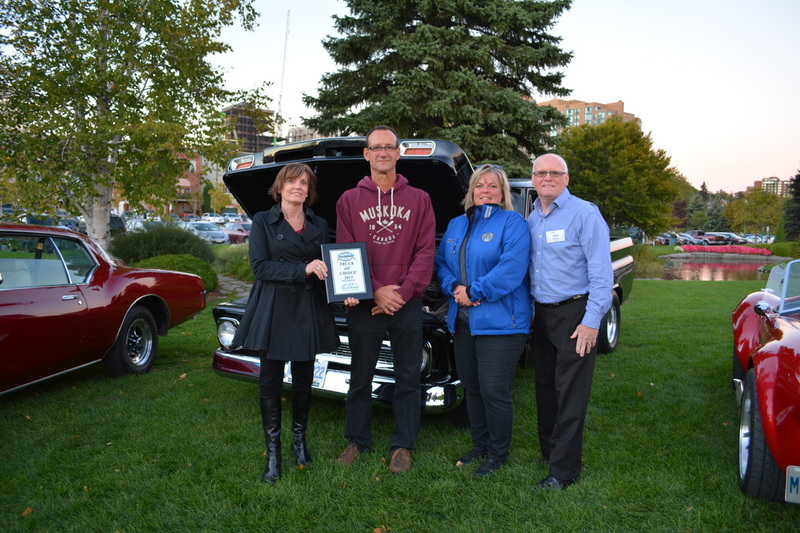 Colleen Dinan and Jeff Mitchell of StoneRidge Insurance Brokers and Michelle Henderson of Hagerty Classic Car Insurance presents Rick Hansen with a plaque for best truck, a 1966 Chevy C10. 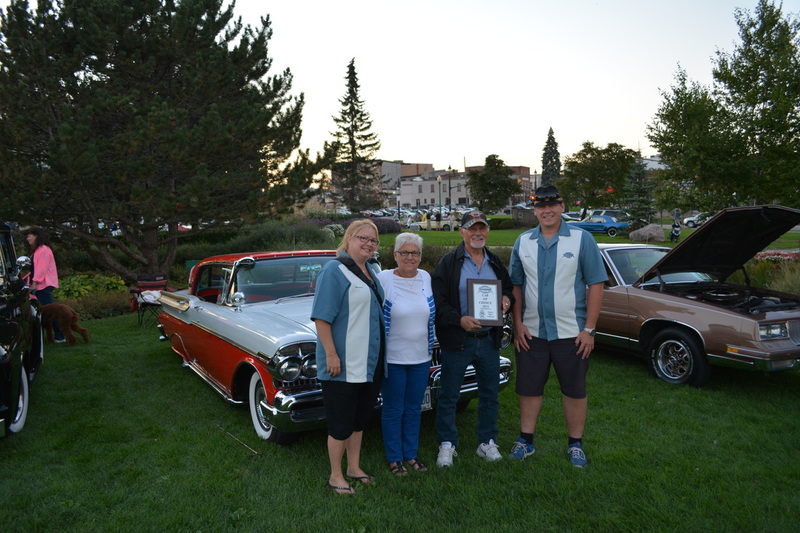 Julie and Andrew Volhakod of NAPA on behalf of Ideal Supply & Automotive Machine Shop presents Morris Broomer with a plaque for best car, a 1957 Oldsmobile Super 88. 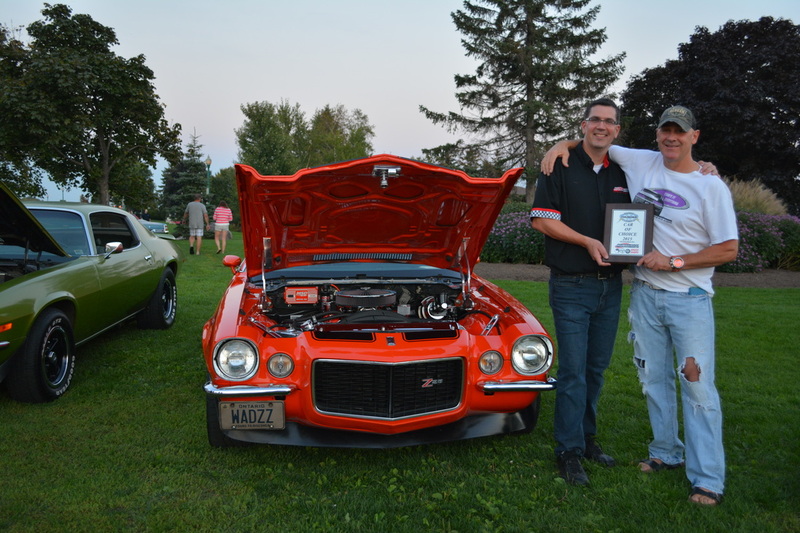 Dave Lang of Ideal Supply & Automotive Machine Shop presents Steve Cails with a plaque for best car, a 1969 Chevy Camaro R/S Z28. 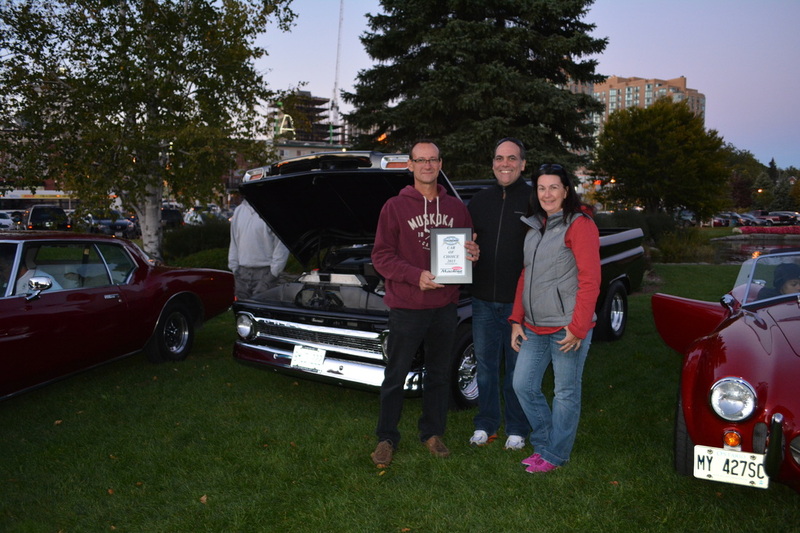 Julie and Andrew Volhakod of NAPA on behalf of Ideal Supply & Automotive Machine Shop presents Ron Hansen with a plaque for best truck, a 1966 Chevy C10. 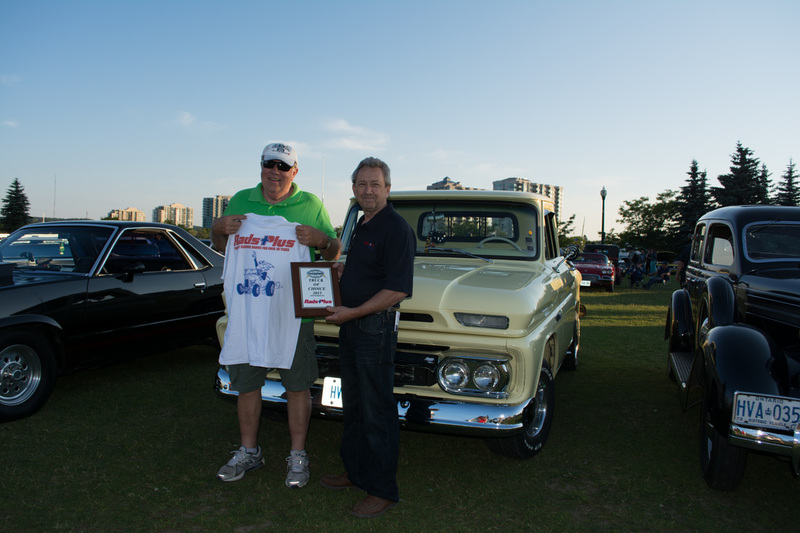 Dave Lang of Ideal Supply & Automotive Machine Shop presents Mike Warin with a plaque for best truck, a 1964 Chevy C10. 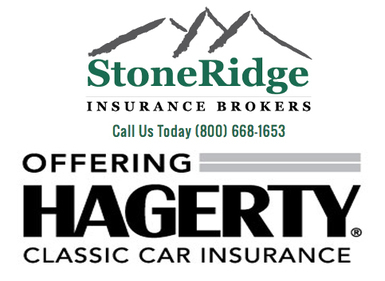 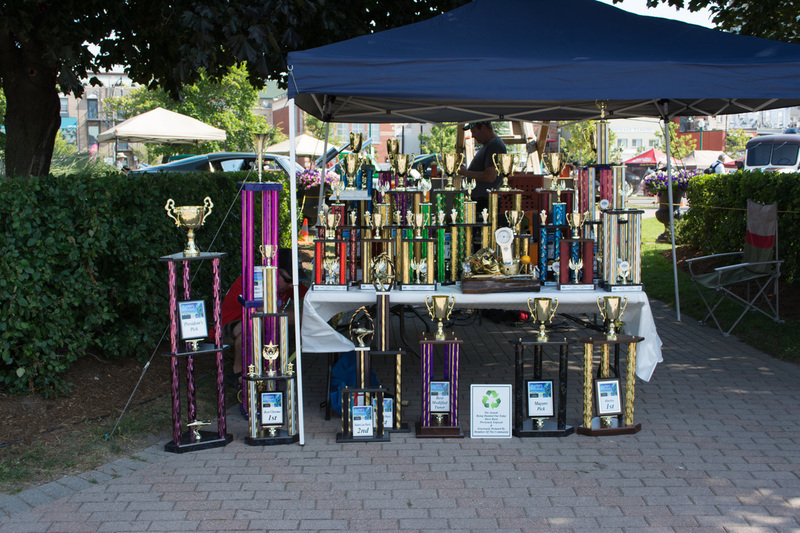 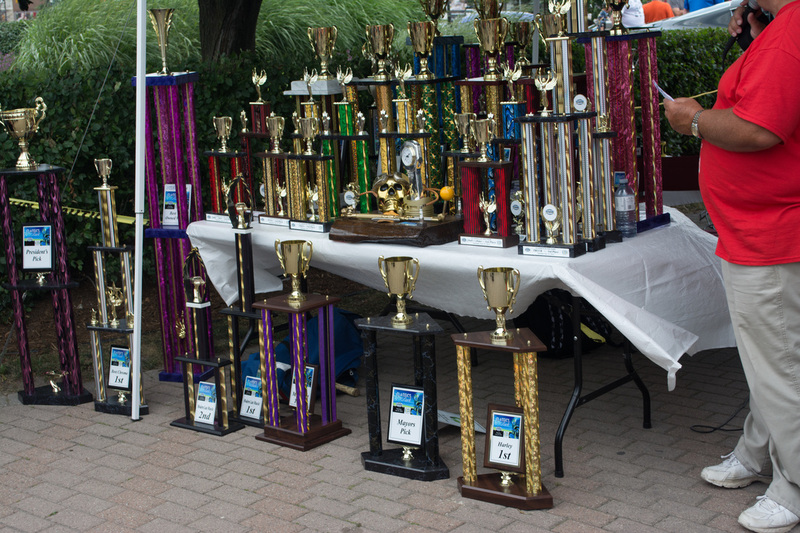 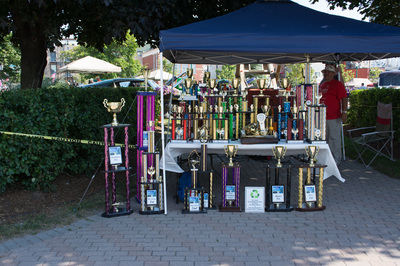 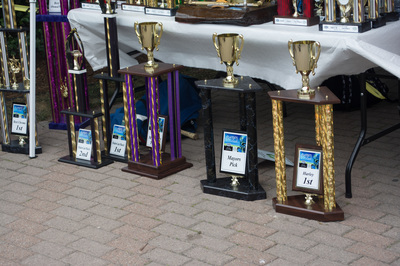 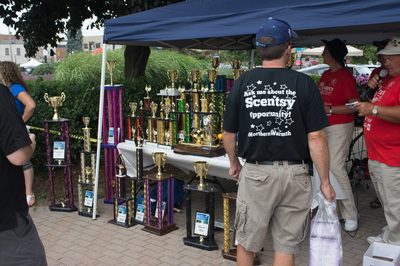 Winners are picked solely by our nightly sponsor. 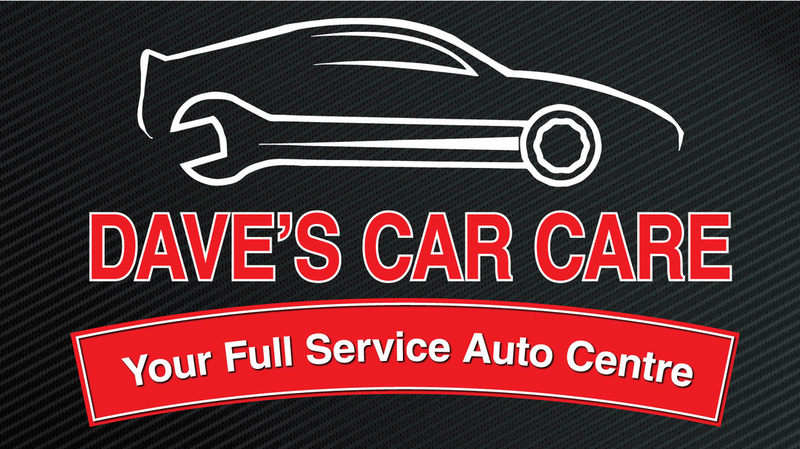 For errors and omissions please contact us through the contact page.